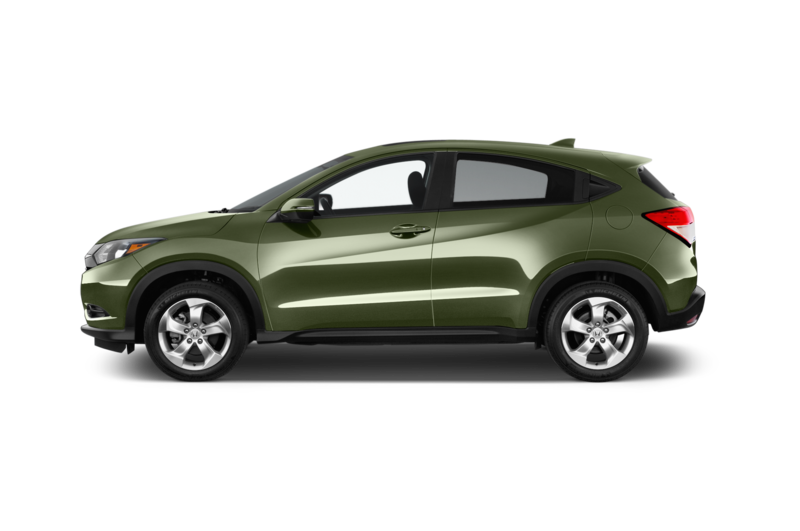 Being a middle child is hard. 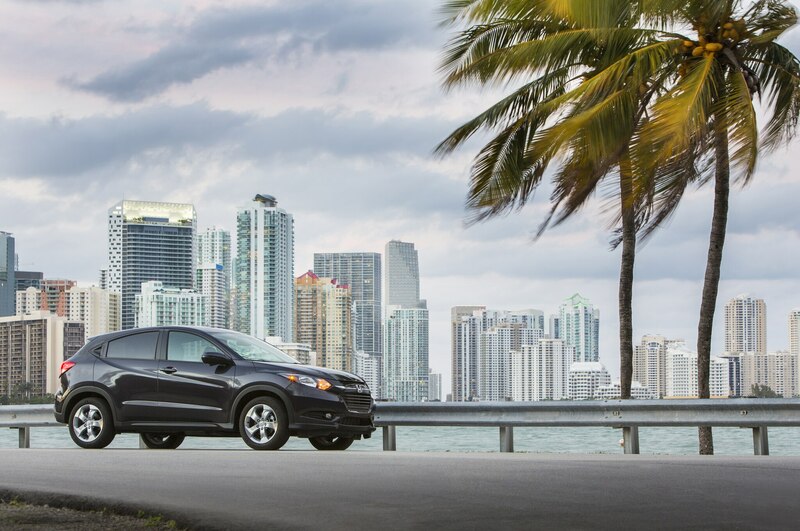 MIAMI — It’s hard to stand out when you’re a middle child, especially if you’re part of a family as successful as Honda’s. 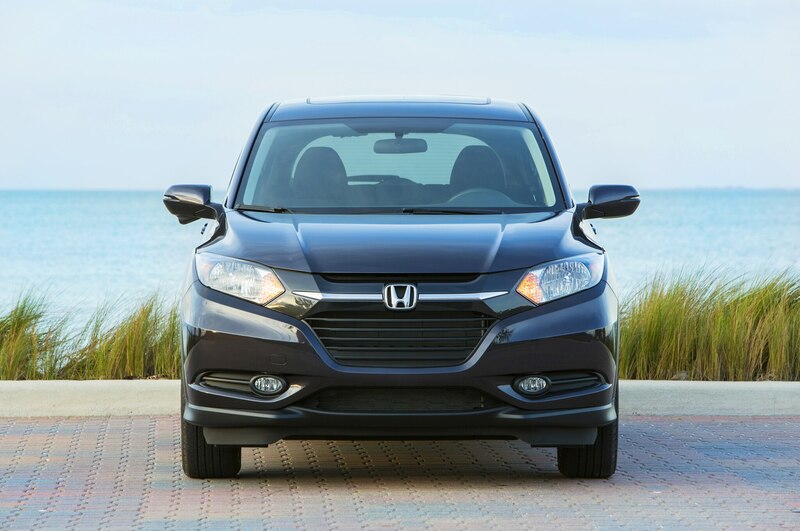 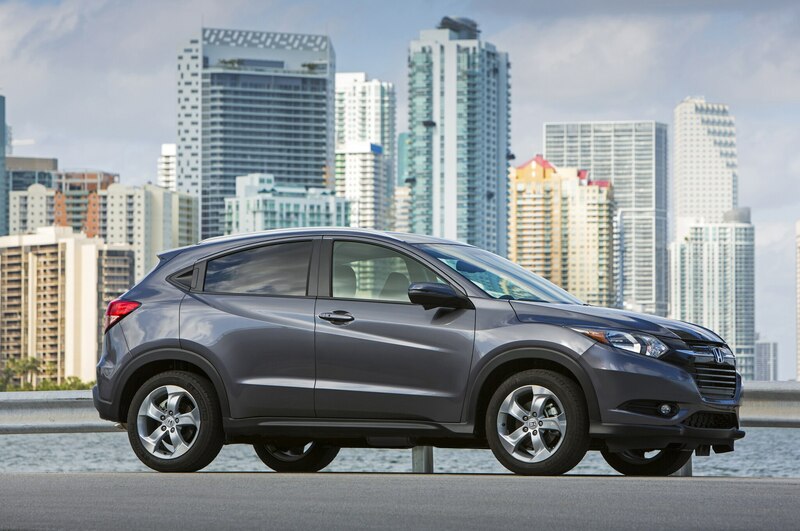 The 2016 Honda HR-V is surrounded by exceptional siblings: the CR-V that’s been the best-selling SUV in America for years, the Fit that still dominates the subcompact hatch segment, and the perennially popular Accord and Civic. 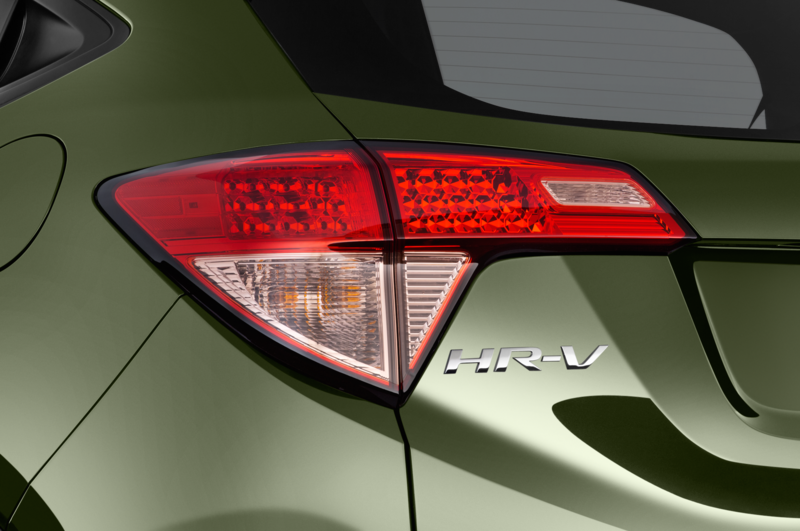 It won’t be easy for the HR-V to stand out in the marketplace either, seeing how it competes in the rapidly growing subcompact crossover segment, a hard-to-define class with competitors from Chevrolet, Jeep, Mazda, and Nissan that are all over the map in terms of looks and underpinnings. 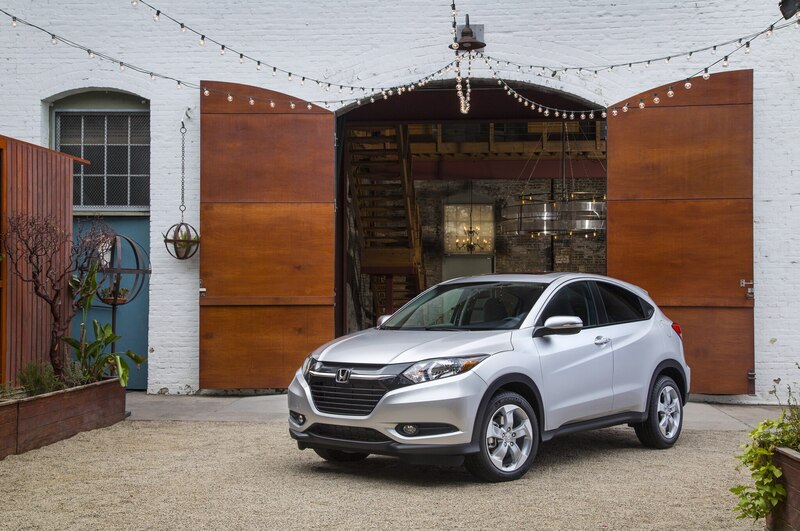 But the HR-V’s proven Honda DNA is nothing to sneeze at. 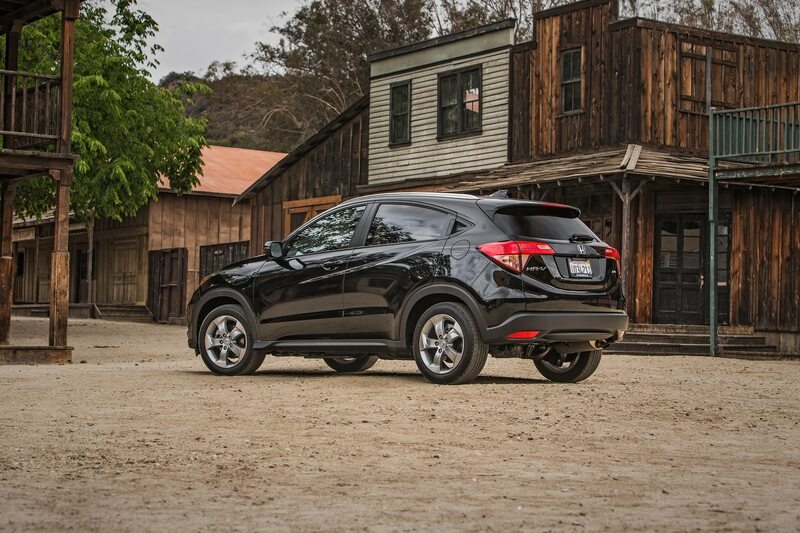 Can this all-new crossover make the most of its strong roots and separate itself from the crowd? 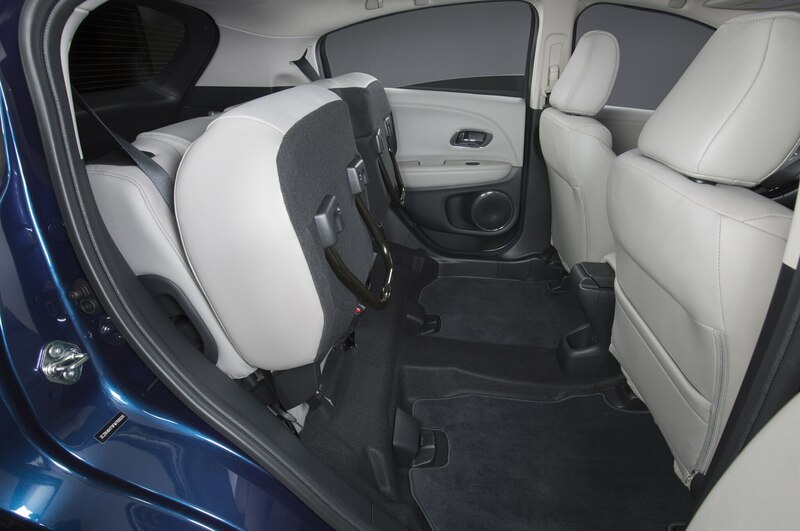 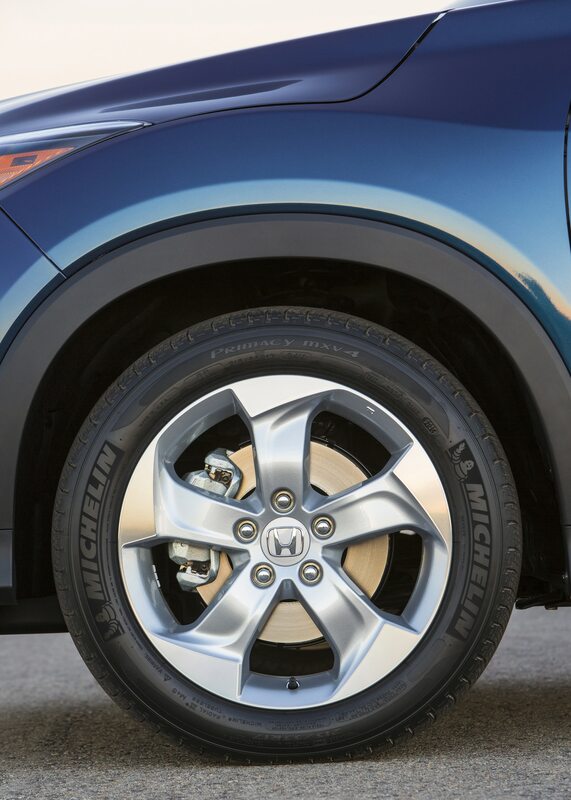 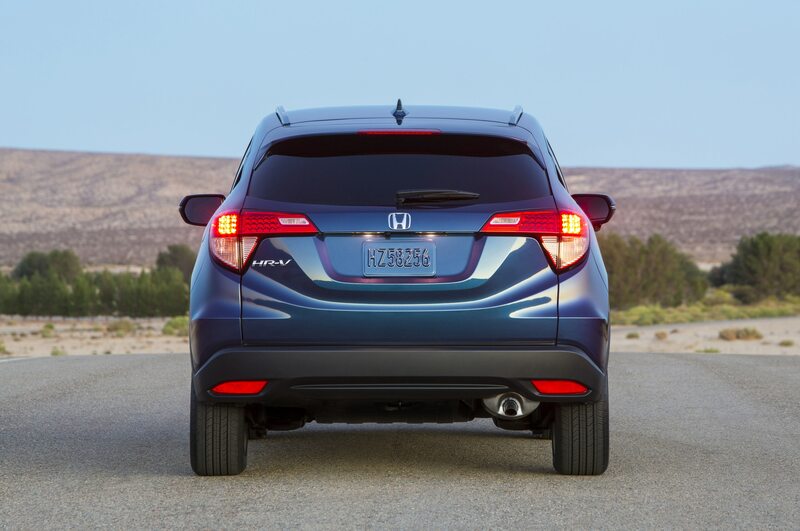 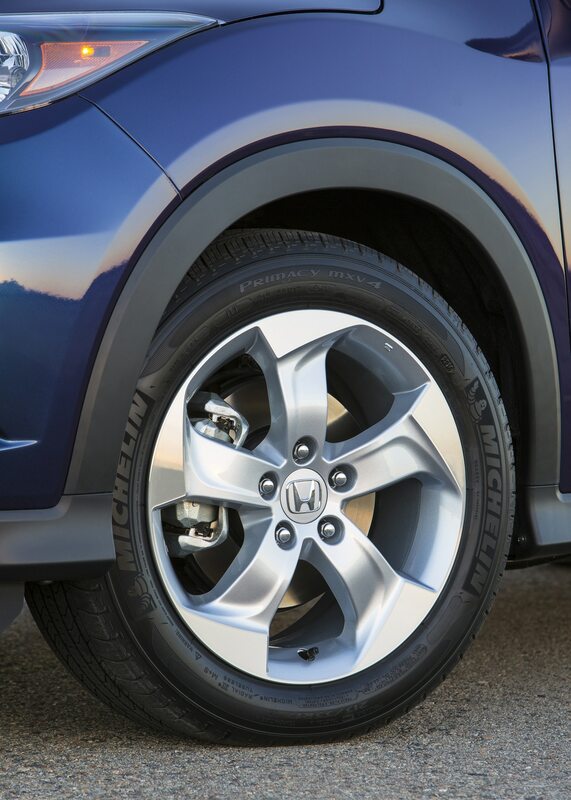 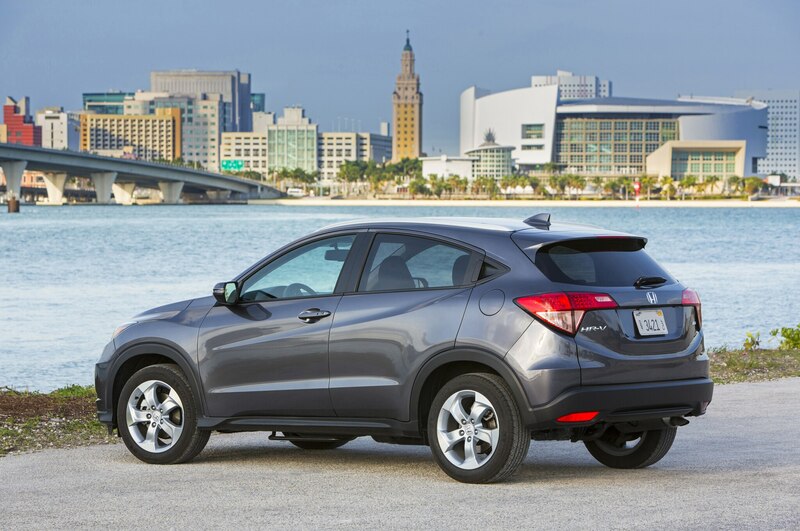 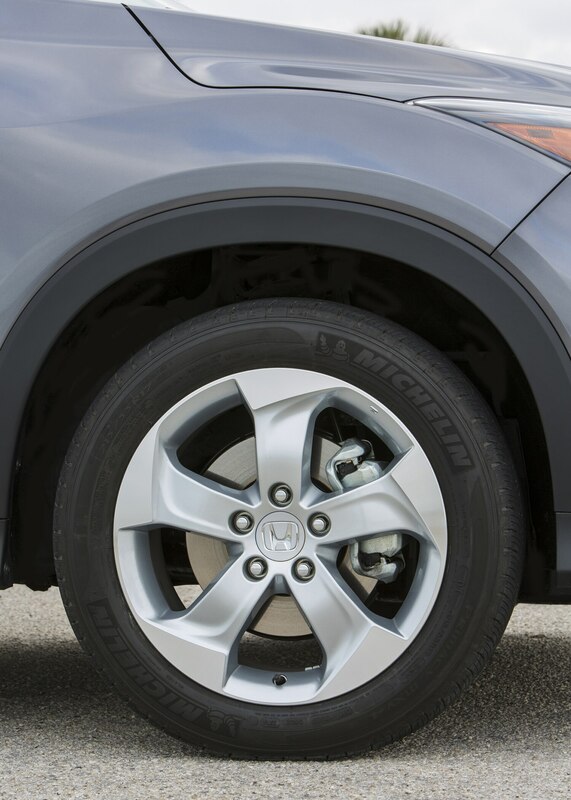 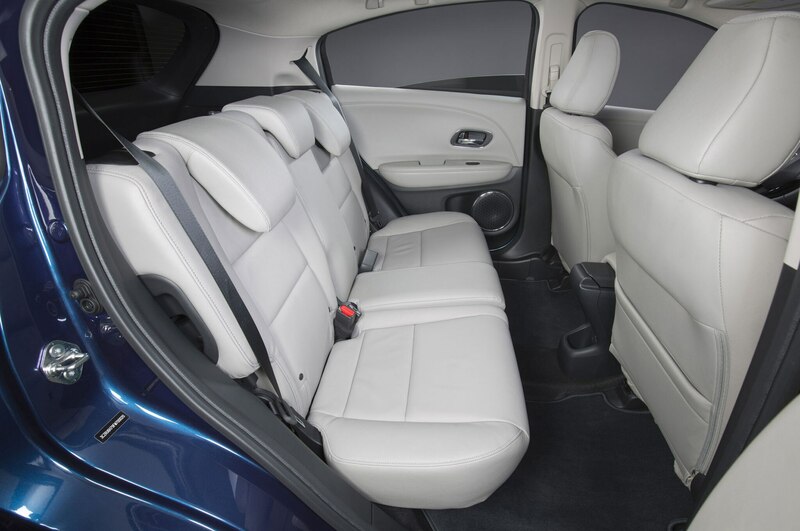 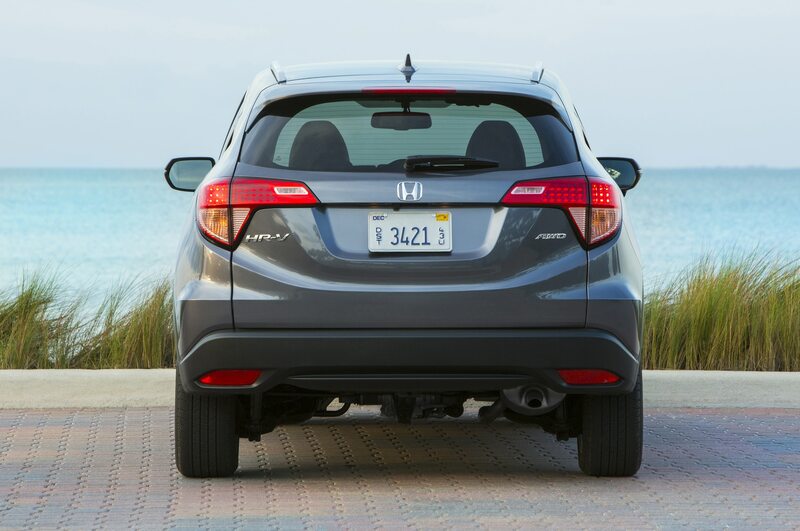 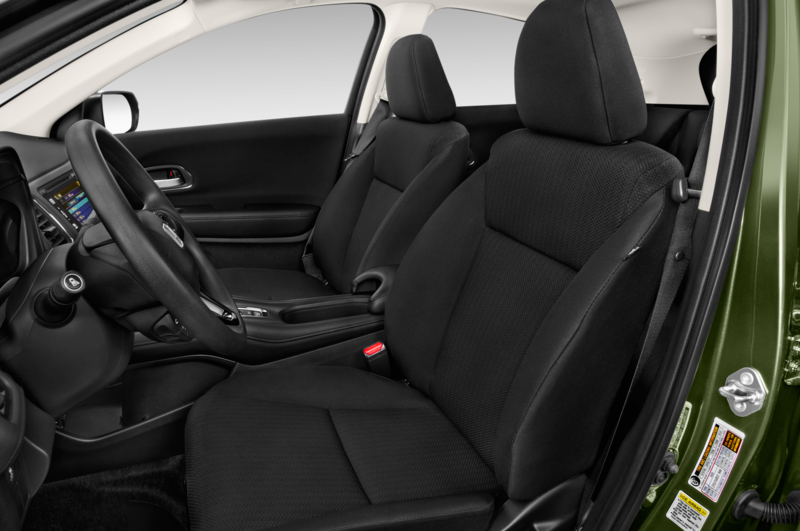 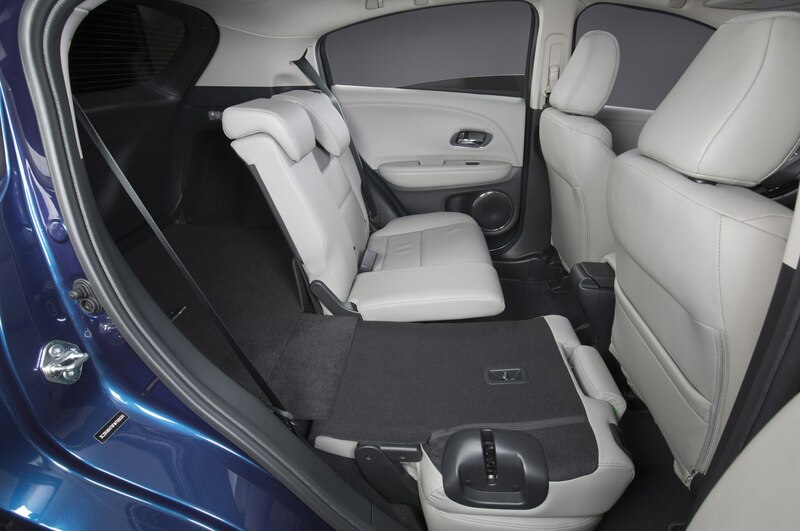 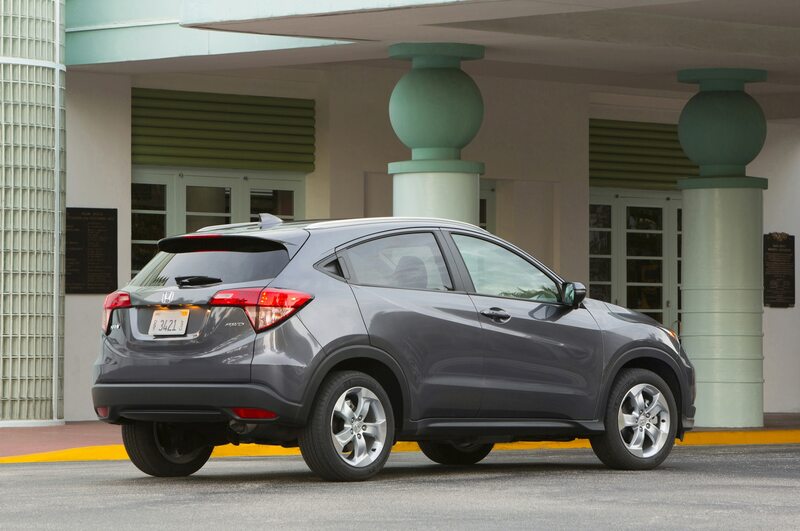 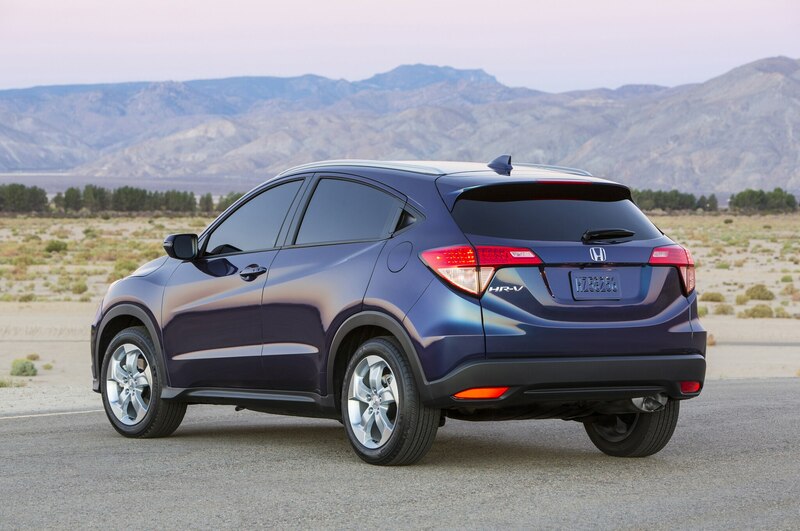 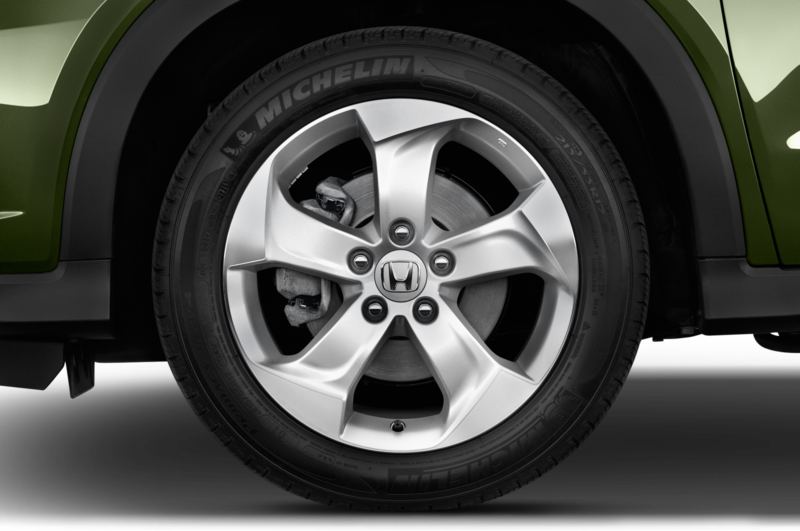 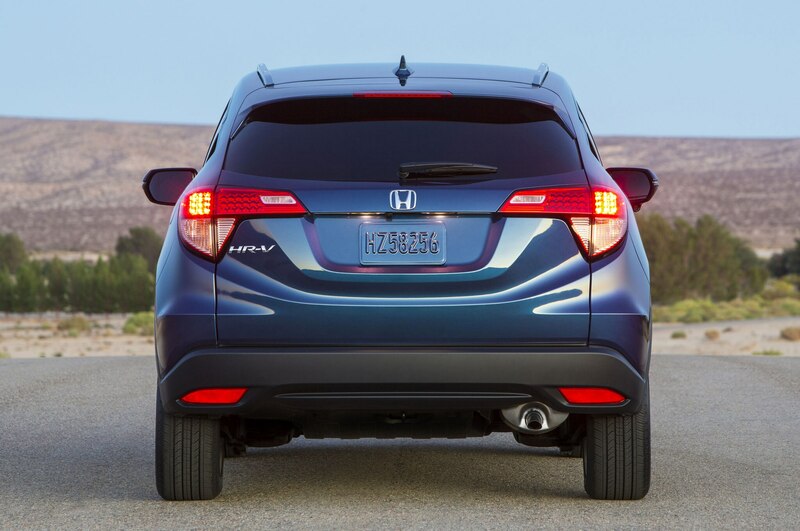 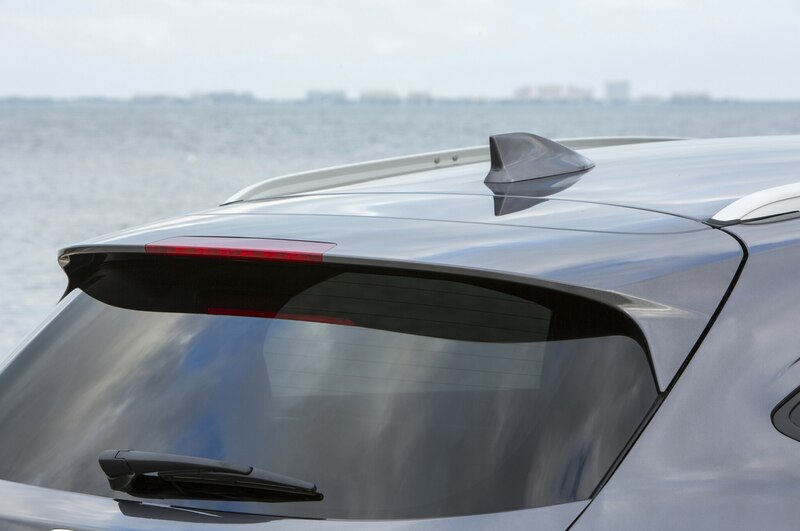 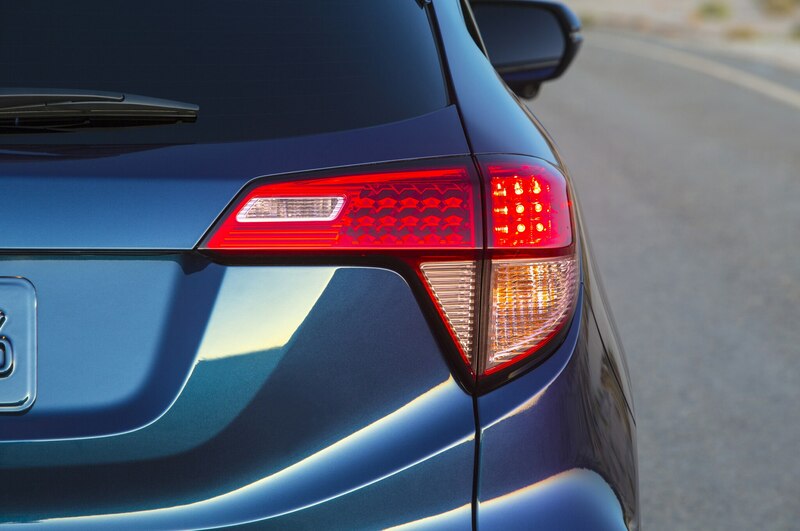 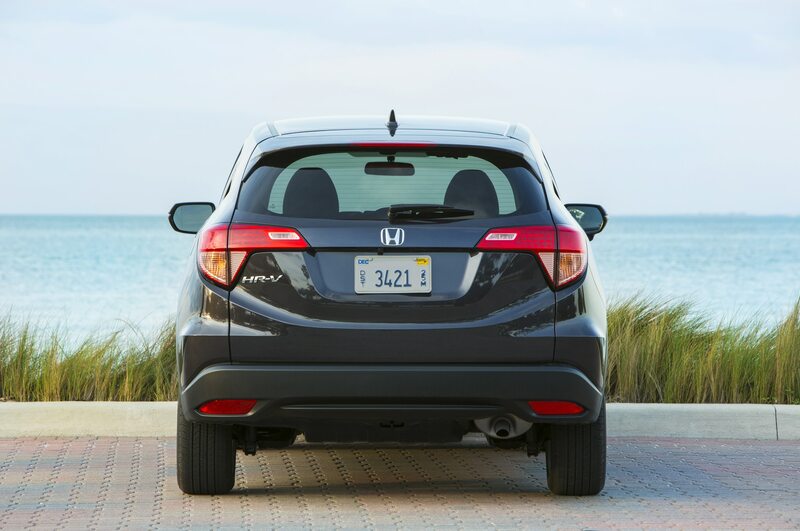 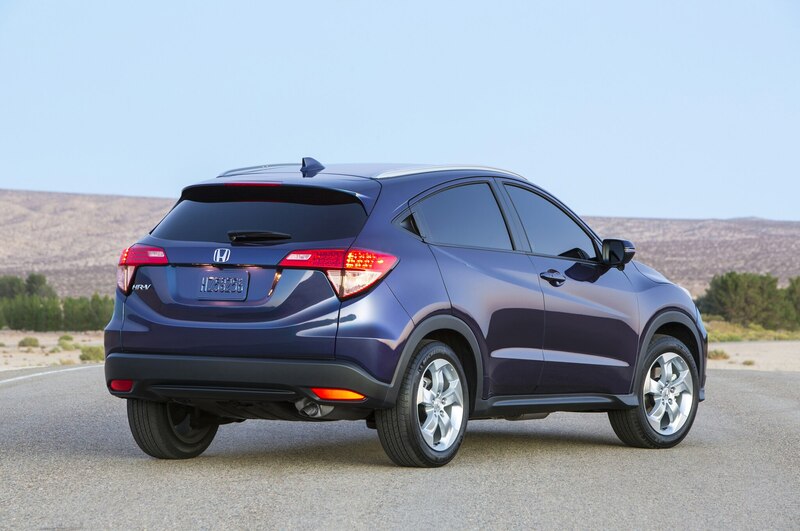 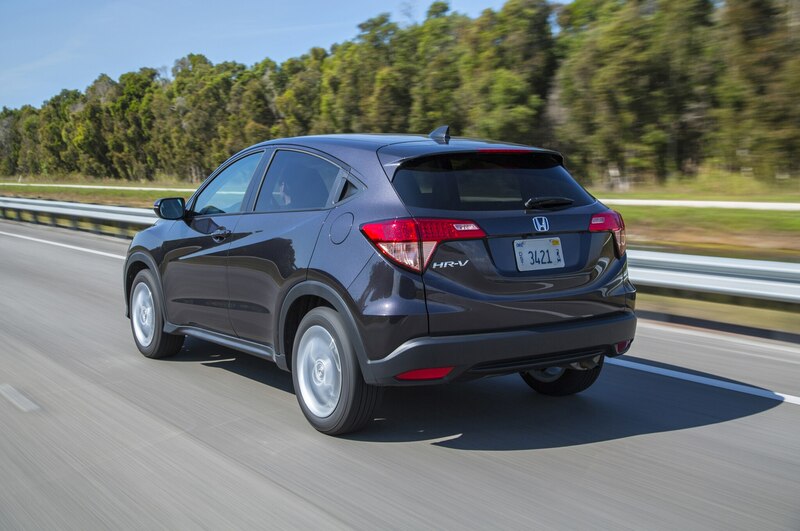 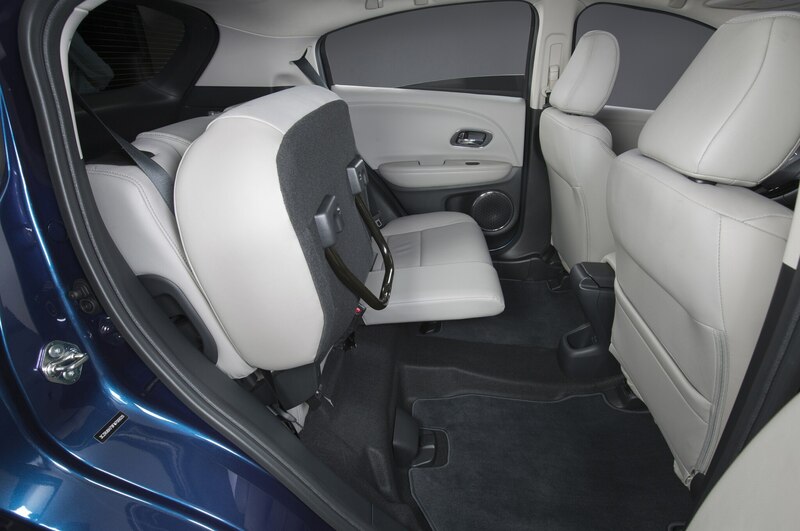 The 2016 Honda HR-V shares its platform with the smaller Fit, but has a 3.2-inch-longer wheelbase, a 2.5-inch-wider track, and a 300-plus-pound weight gain brought about by increased sound deadening, optional all-wheel drive, and a larger four-cylinder engine — more specifically, the 1.8-liter inline-four from the Civic. 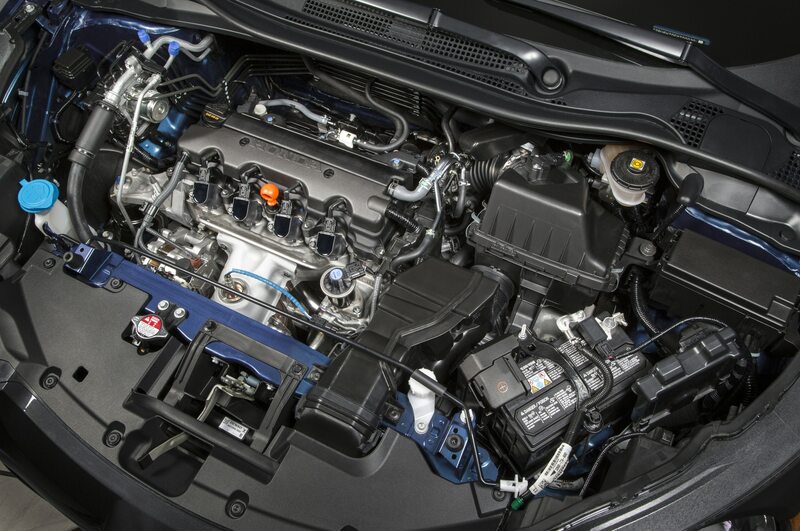 Here, it makes 141 hp and 127 lb-ft of torque. 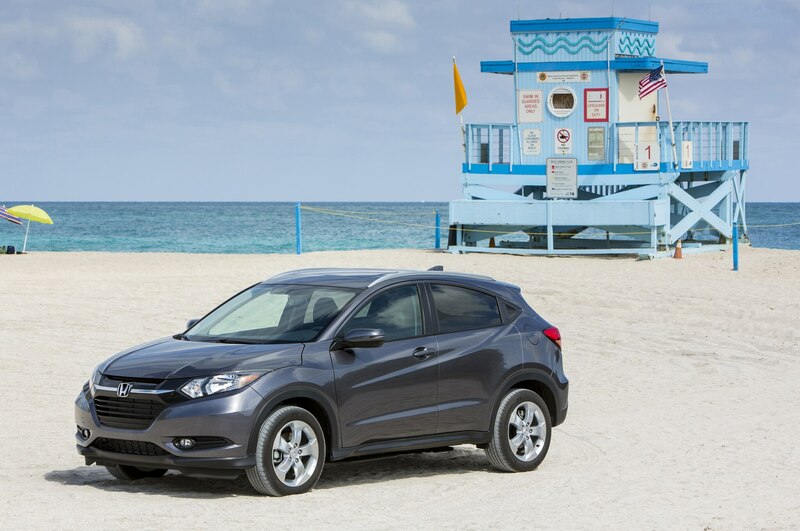 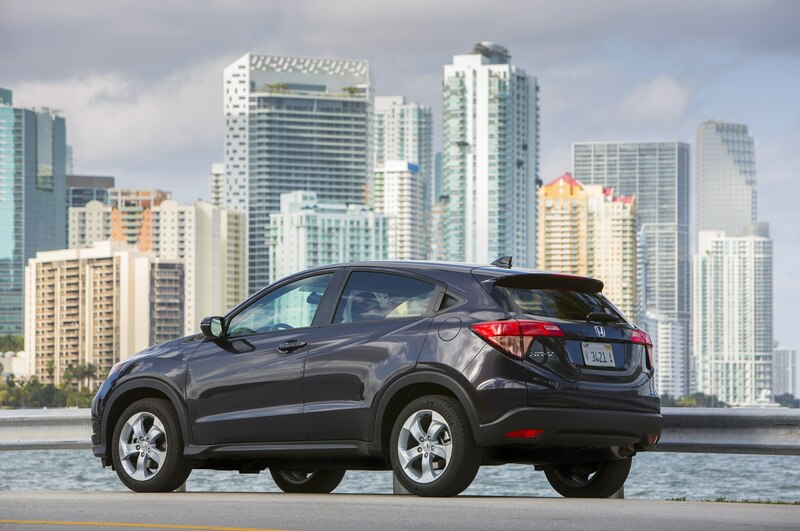 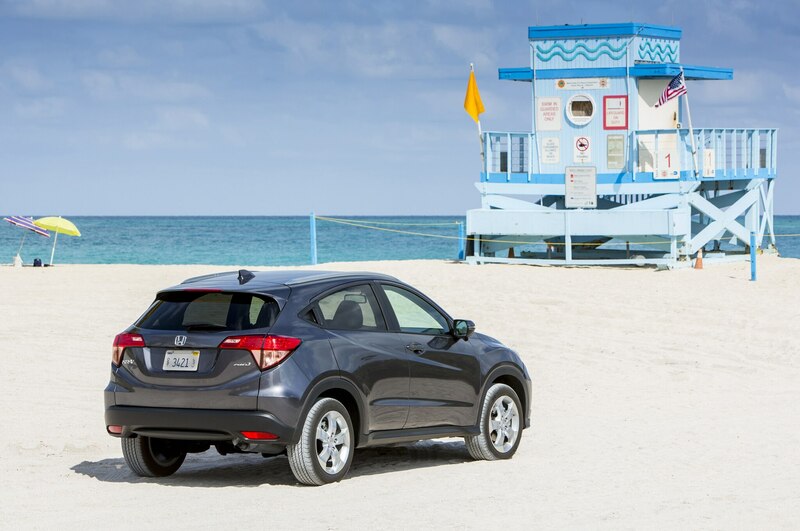 We first set out on Miami’s coastal roads in an HR-V equipped with a six-speed manual transmission, available only on front-wheel-drive LX and EX models. 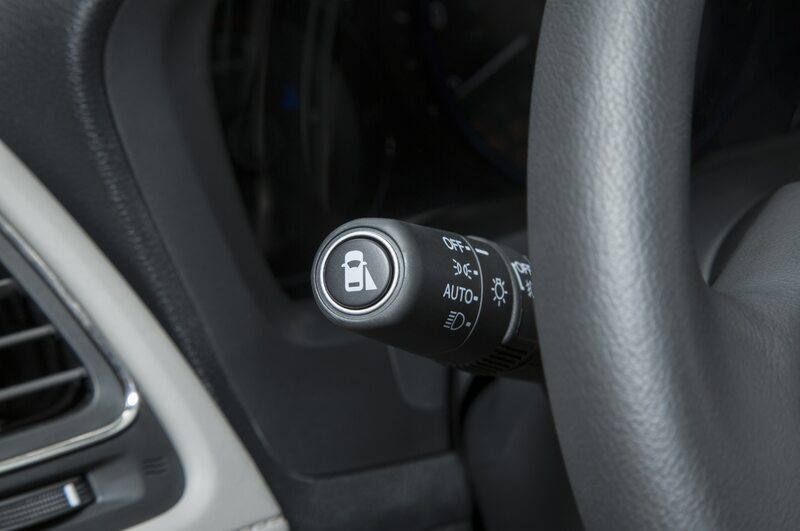 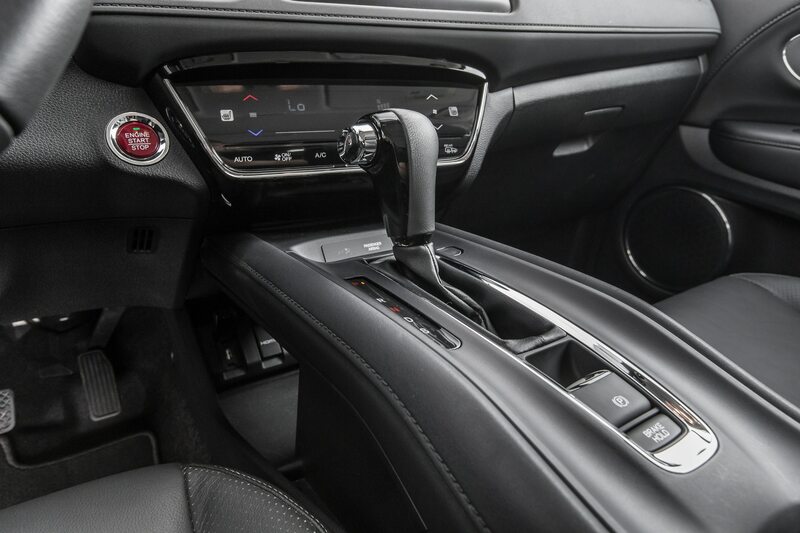 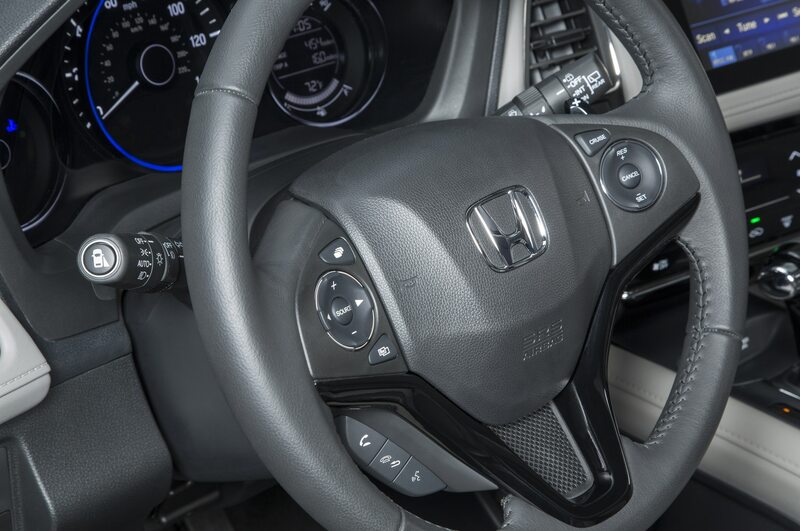 The light clutch pedal and precise shifter, Honda hallmarks, were delightful and appreciated, seeing how we had to shift often to make the most of the engine’s meager torque. 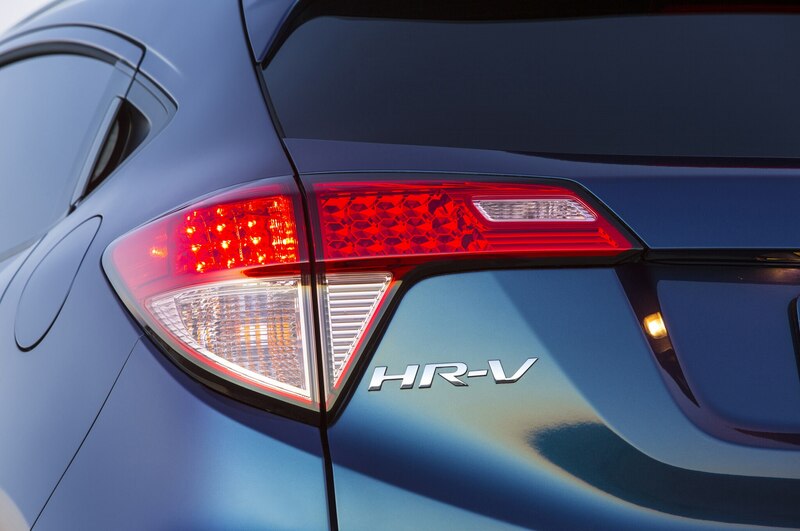 Though a bit coarse and buzzy at times, the four-cylinder engine provided adequate power for the relatively lightweight, 2,900-pound HR-V. We could squirt in and out of gaps in traffic so long as we kept the revs up. 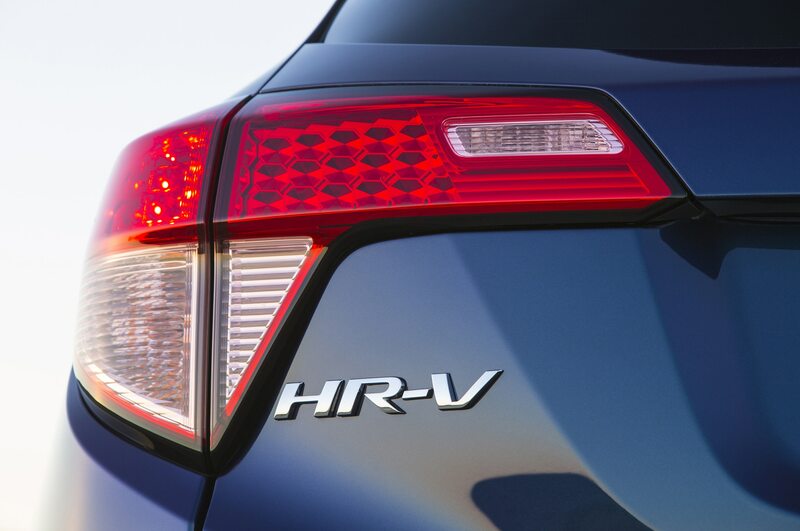 Then we tried the optional continuously variable transmission in a fully loaded, all-wheel-drive HR-V EX-L. CVT-equipped HR-Vs will account for about 90 percent of the crossover’s sales mix. 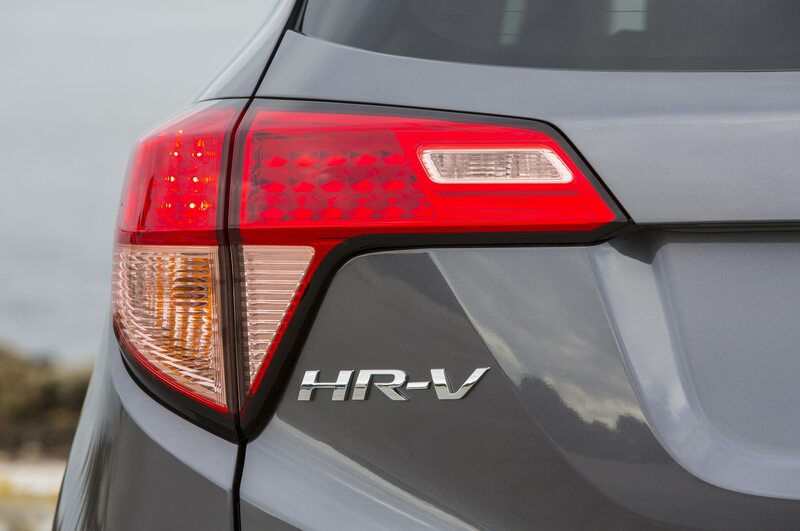 Surprisingly, the CVT-equipped HR-V felt peppier than the manual-transmission HR-V, particularly off the line. 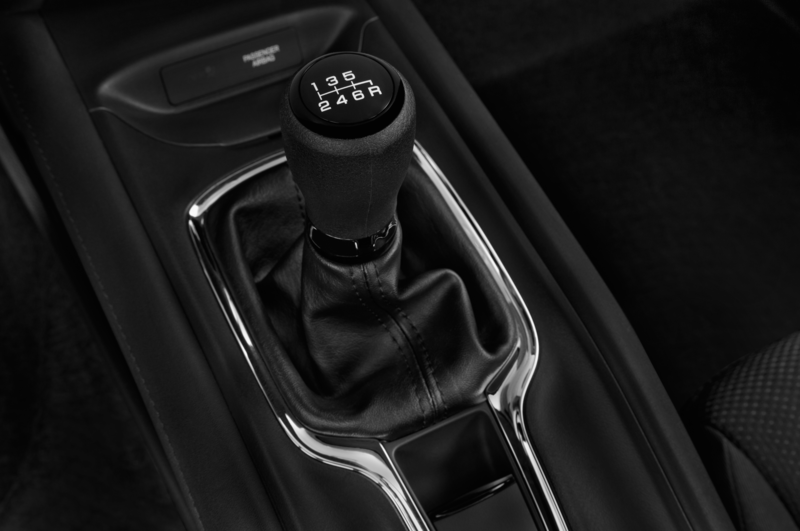 The CVT does a good job of modulating the revs to make the most of the engine’s torque while still providing significantly better fuel economy: 31 mpg combined versus the stick shift’s 28 mpg. 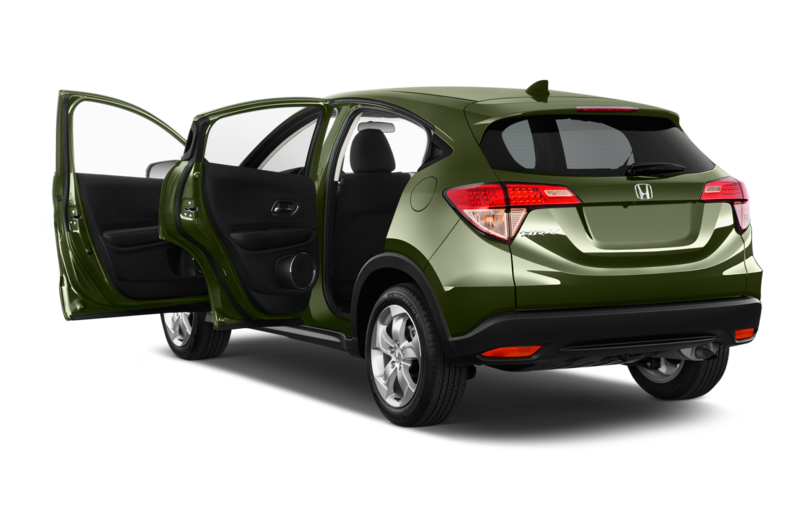 As much as we appreciate Honda offering a manual, it’s hard to argue with the CVT’s effectiveness in this application. 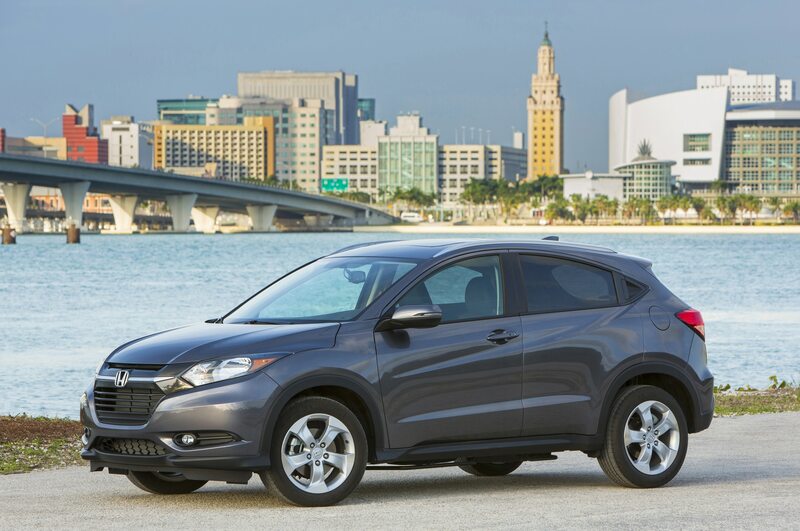 The 2016 Honda HR-V’s balanced, taut yet supple suspension provides a sporty, firm ride while also managing to soften harsh road impacts. 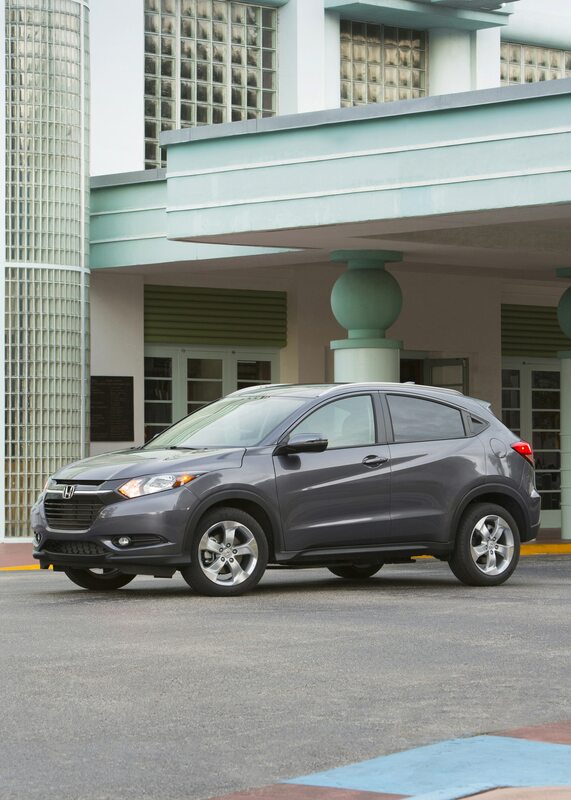 The HR-V is quieter and feels more planted on the highway than the Fit it’s based on, and its light steering and well-controlled body motions make it more maneuverable than the CR-V. It’s not exciting by any means, but the HR-V is responsive and agile, which makes it ideal for darting around town and scooting into tight parking spots. 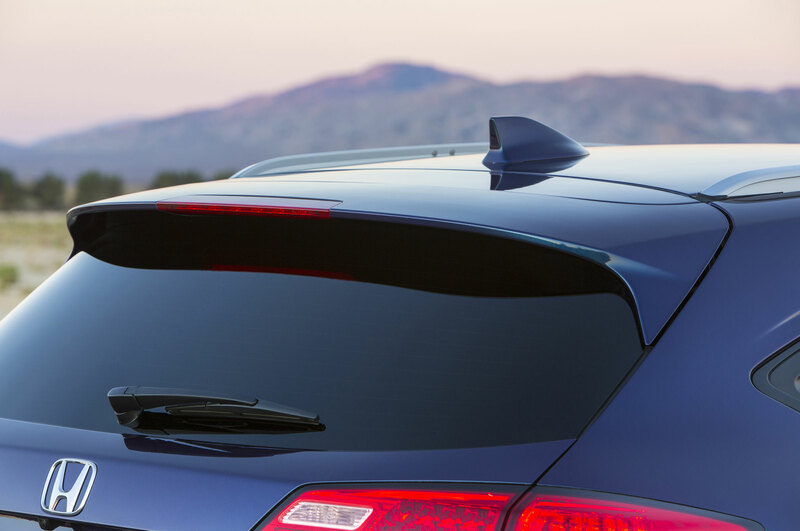 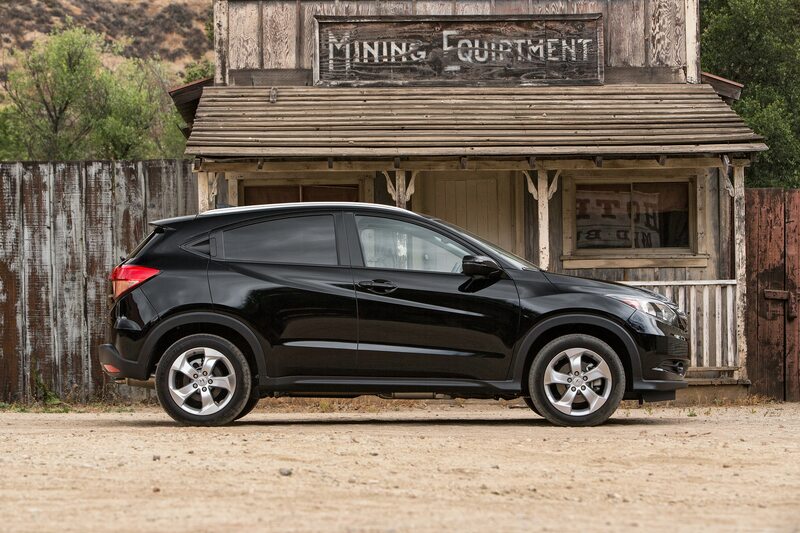 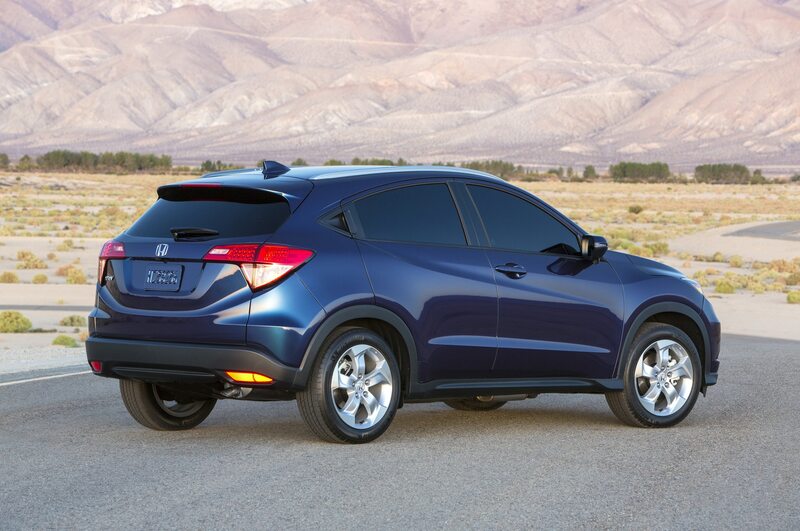 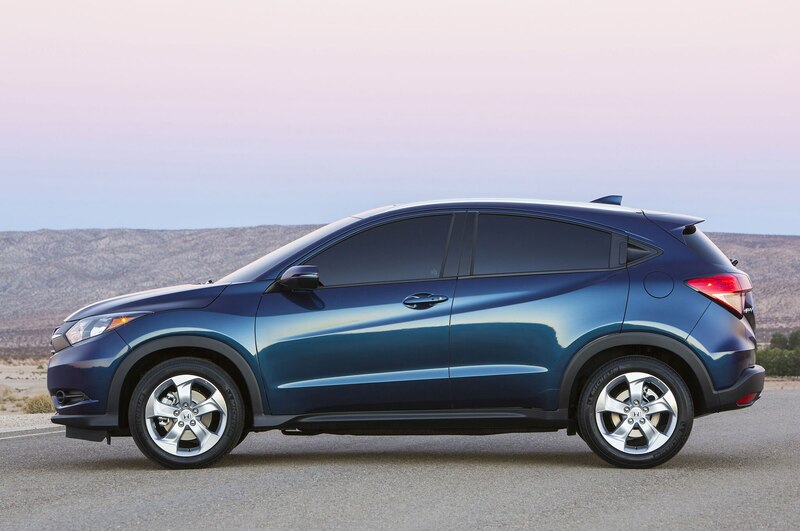 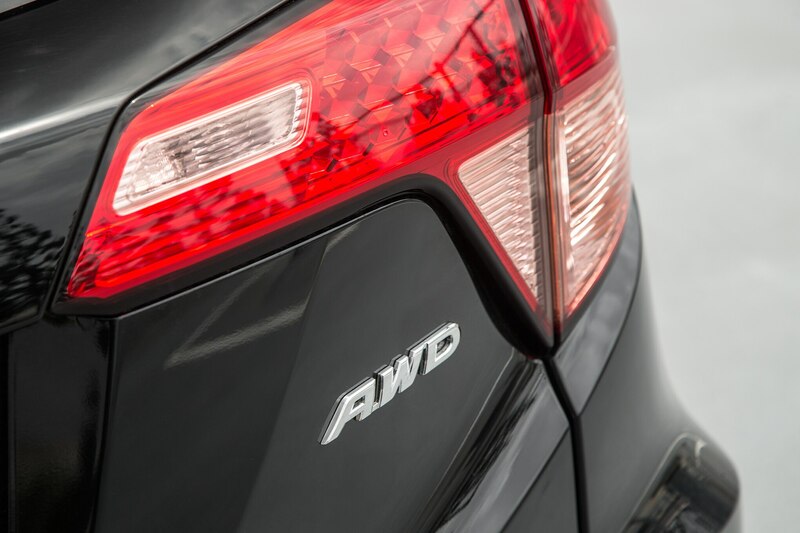 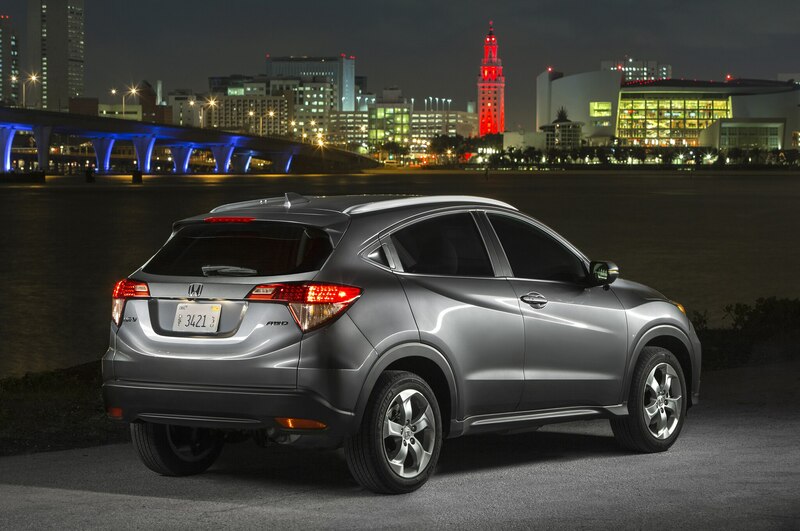 Honda designers stayed well within their comfort zone when penning this crossover. 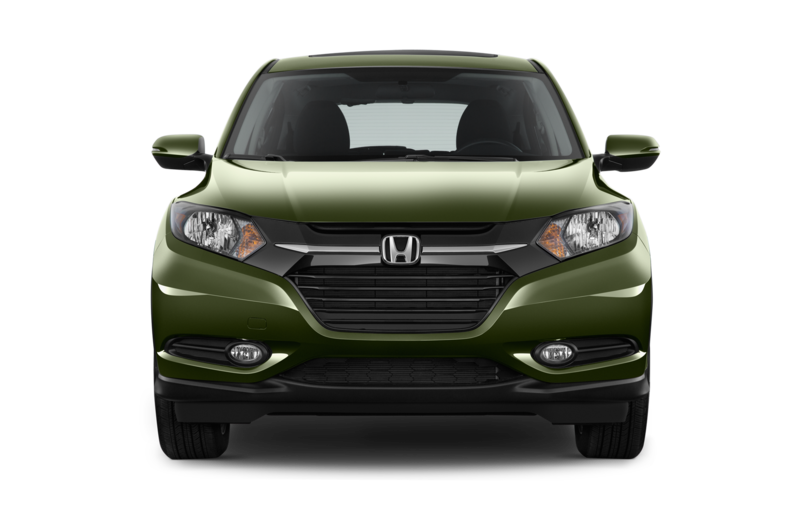 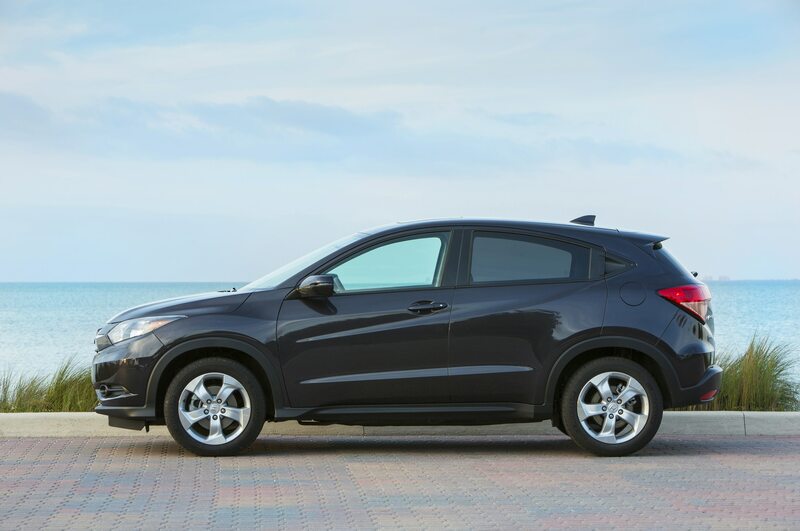 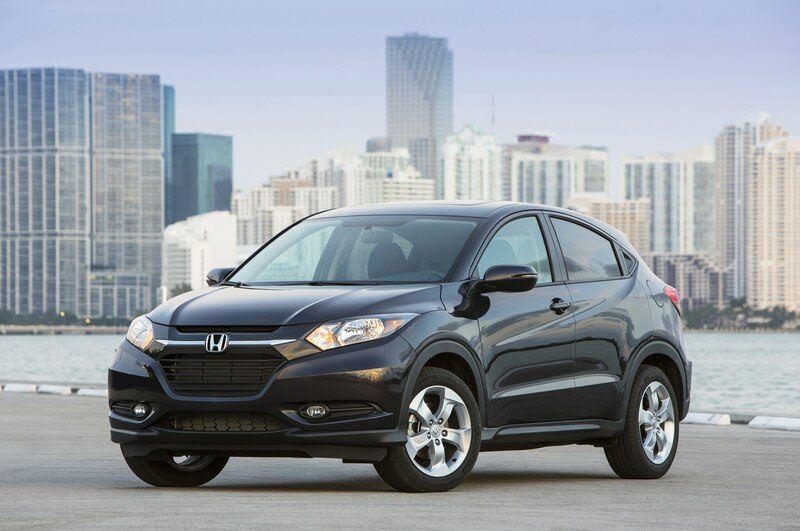 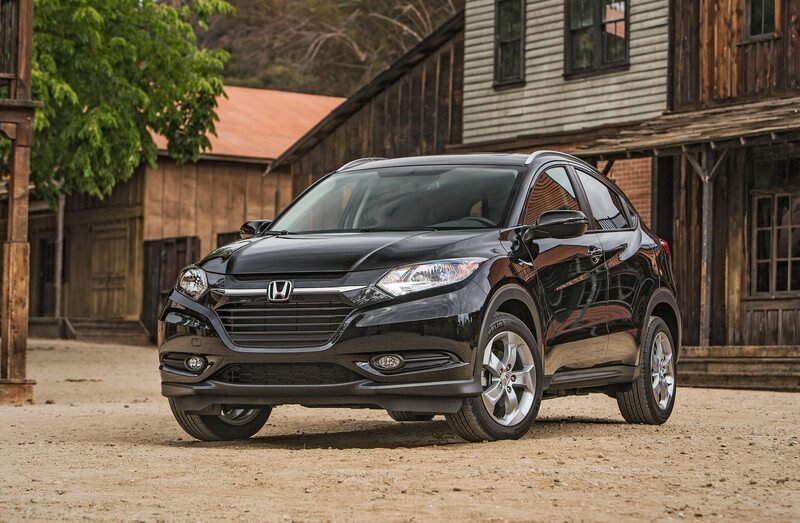 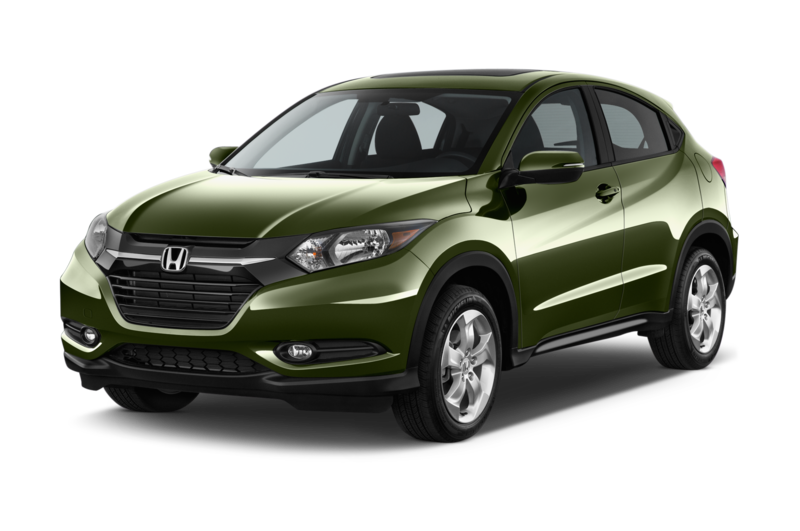 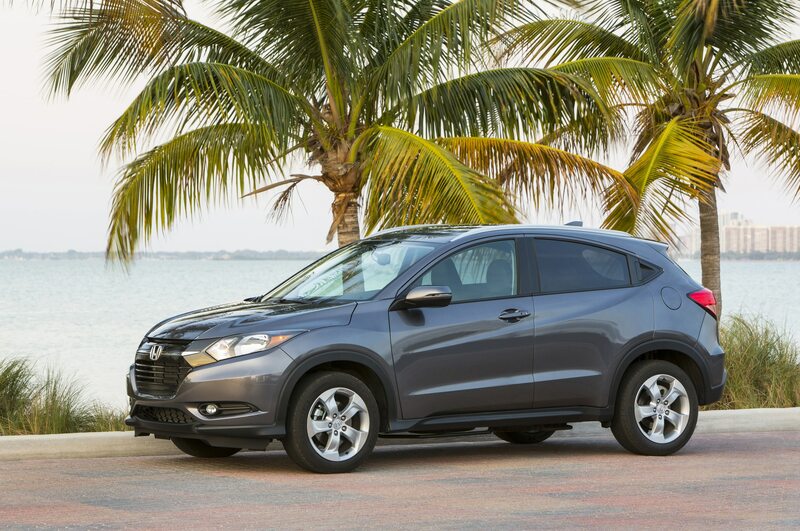 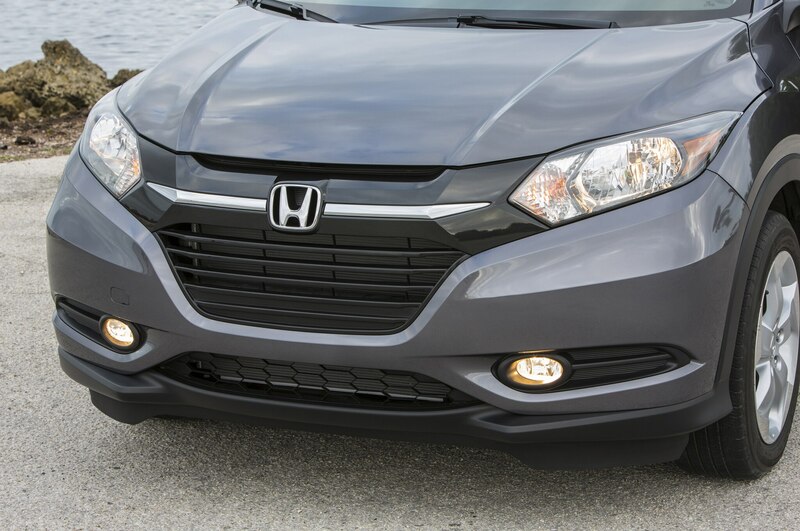 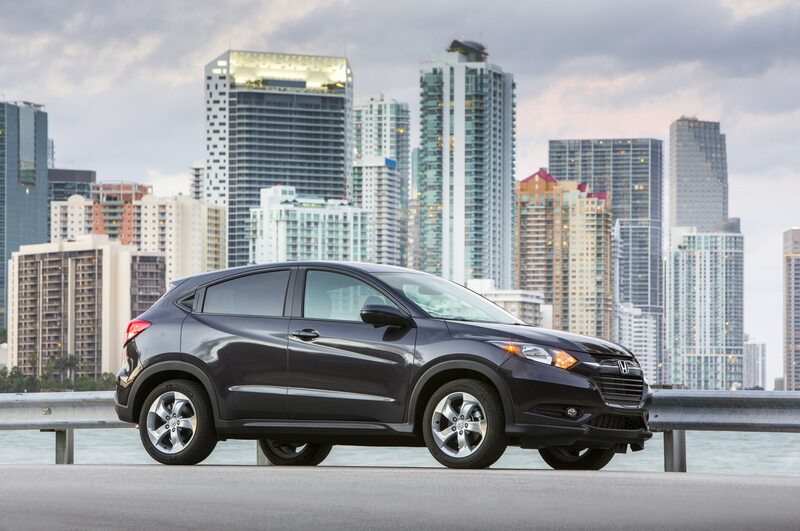 The 2016 Honda HR-V looks like a shrunken CR-V complete with the same corporate grille and greenhouse shape, as well as similar black plastic cladding for that all-important “rugged” look. 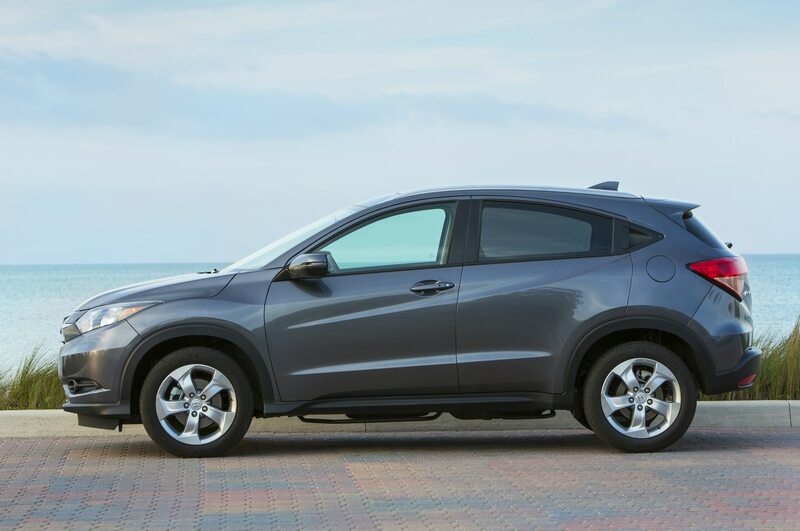 Compared to sharp-looking, distinctive competitors such as the Jeep Renegade and Mazda CX-3, the HR-V’s bland, drab design lets the Honda disappear in parking lots full of other nondescript crossovers. 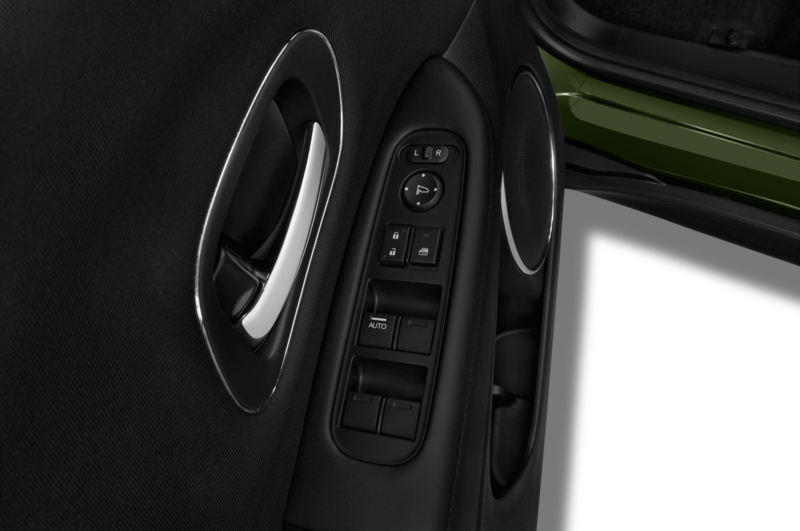 The interior, though, is a different story. 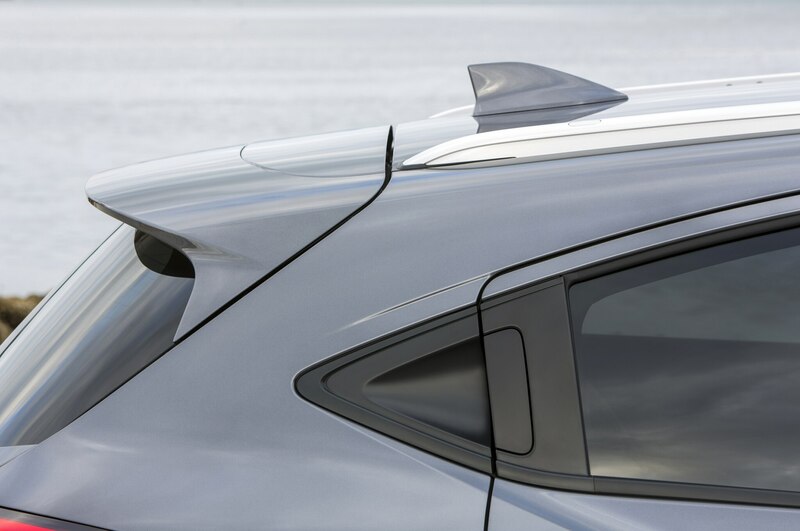 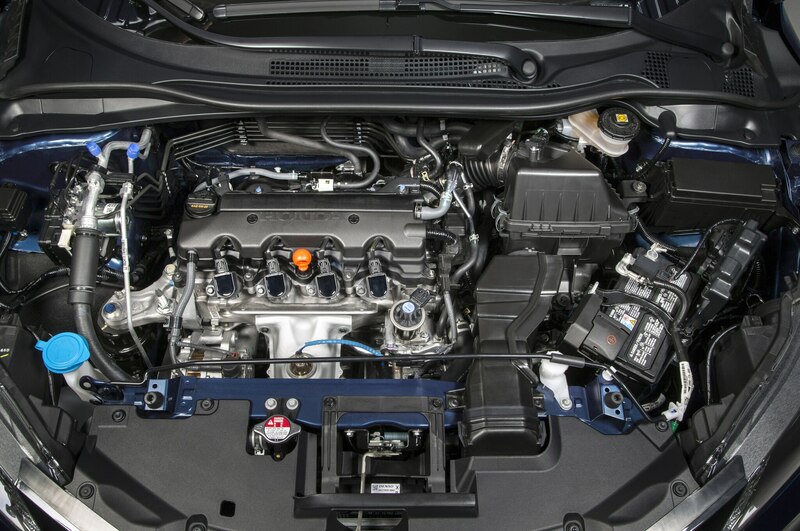 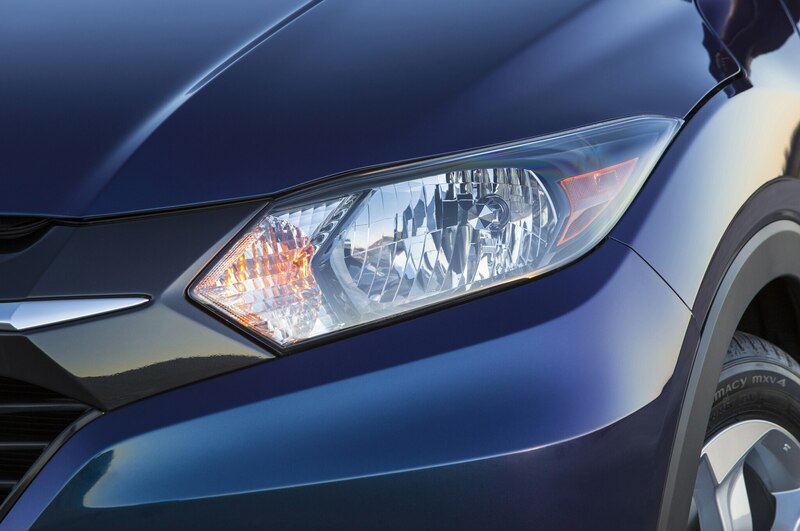 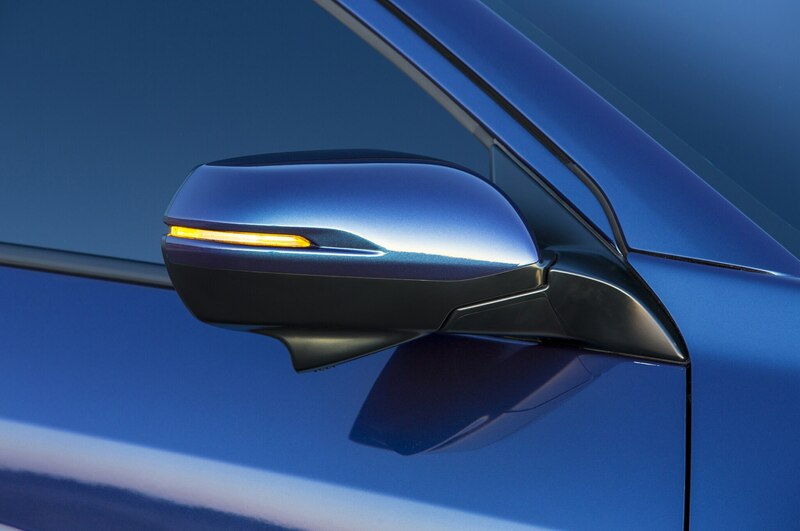 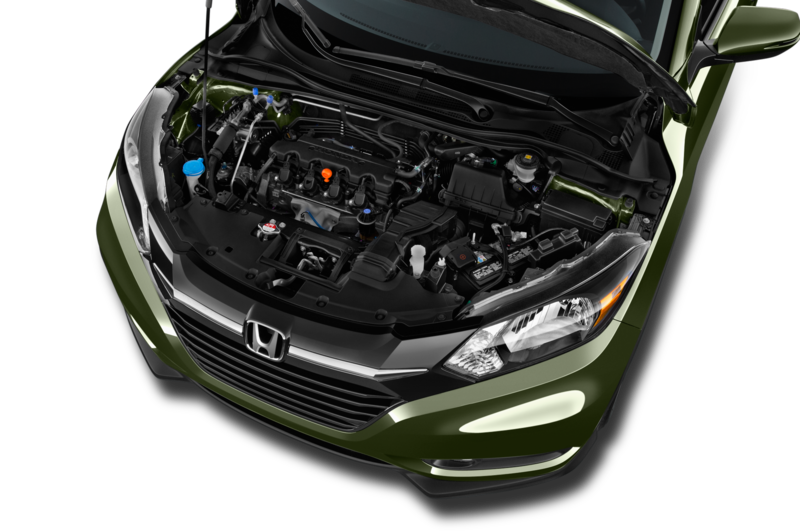 The best bits come from Honda’s unsurpassed packaging know-how. 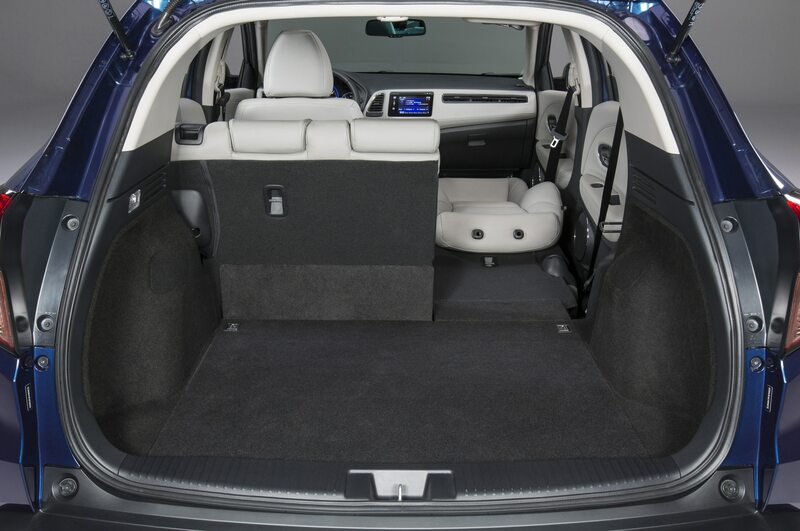 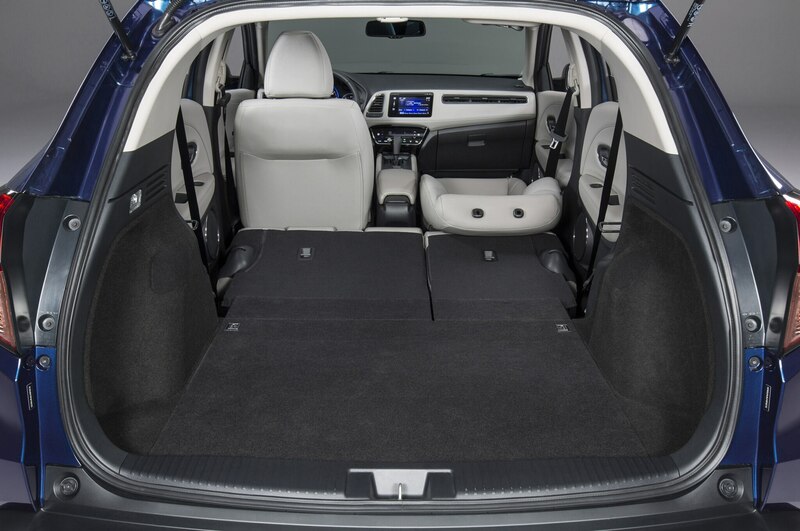 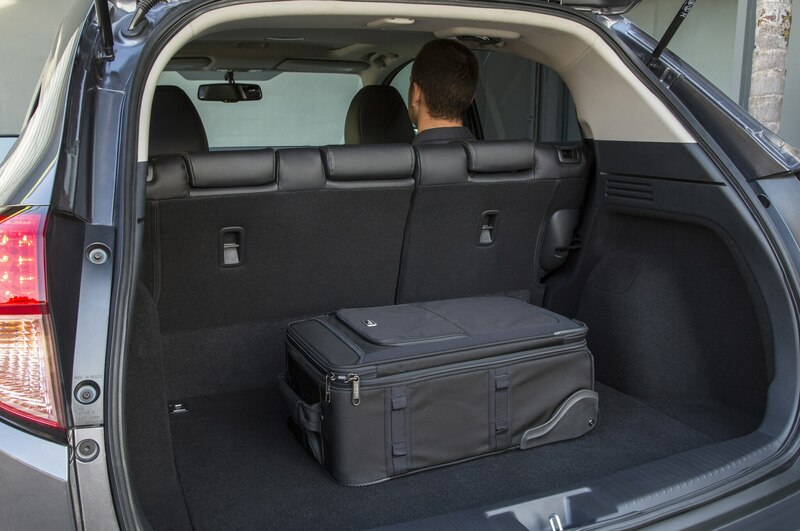 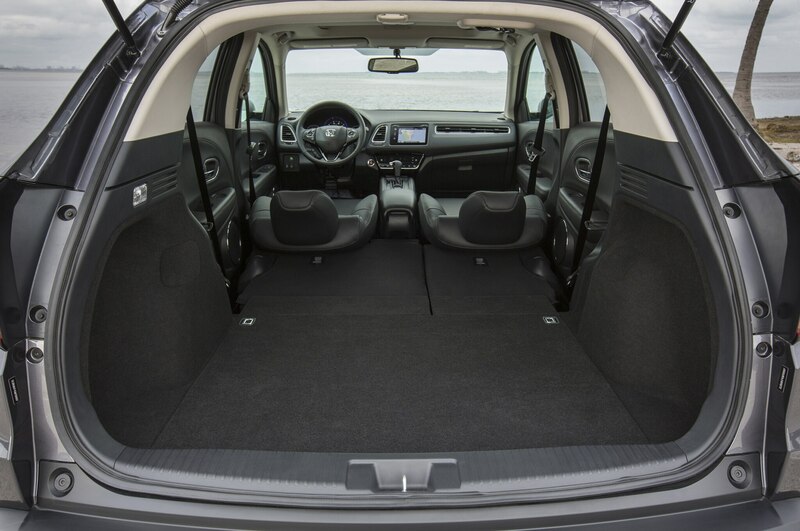 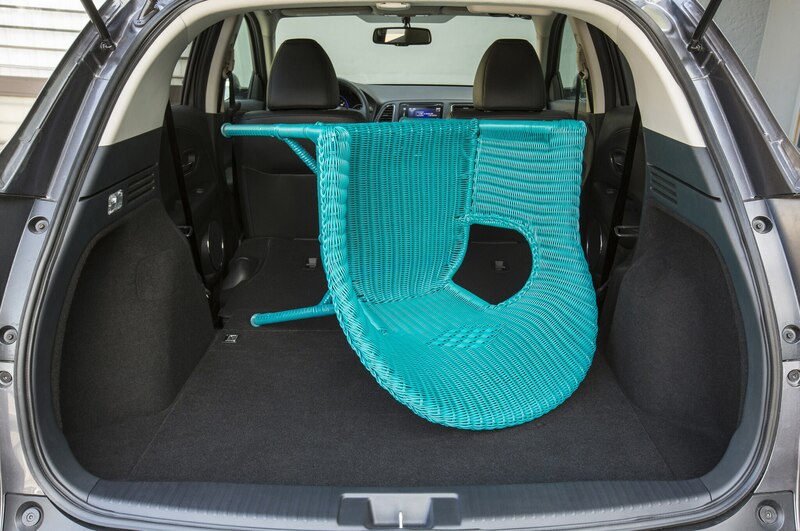 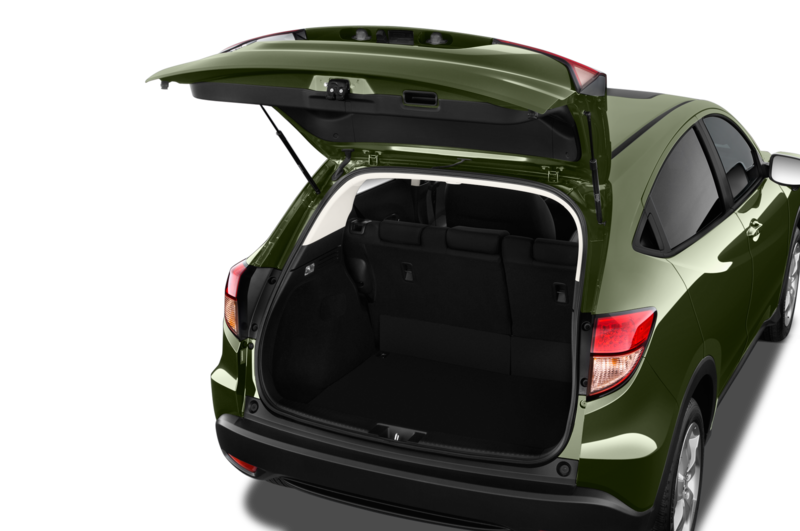 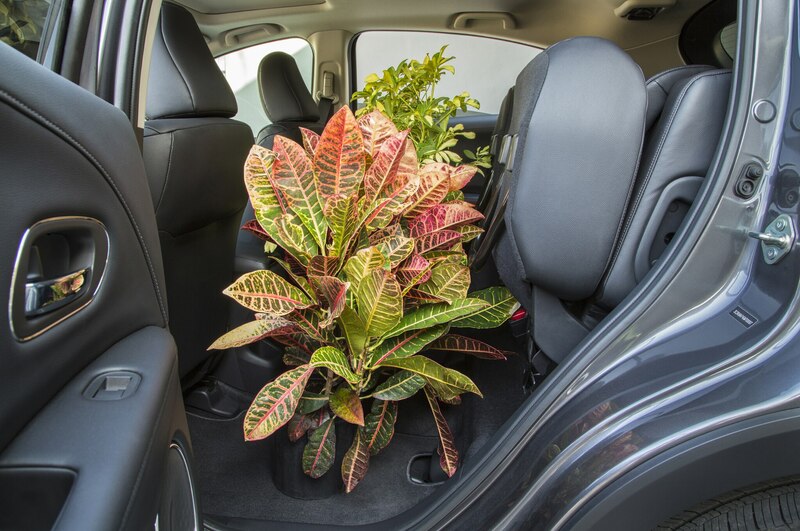 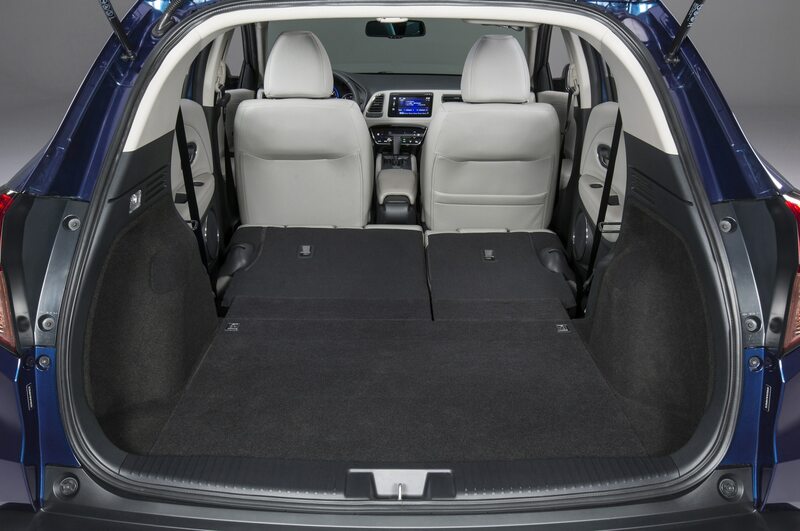 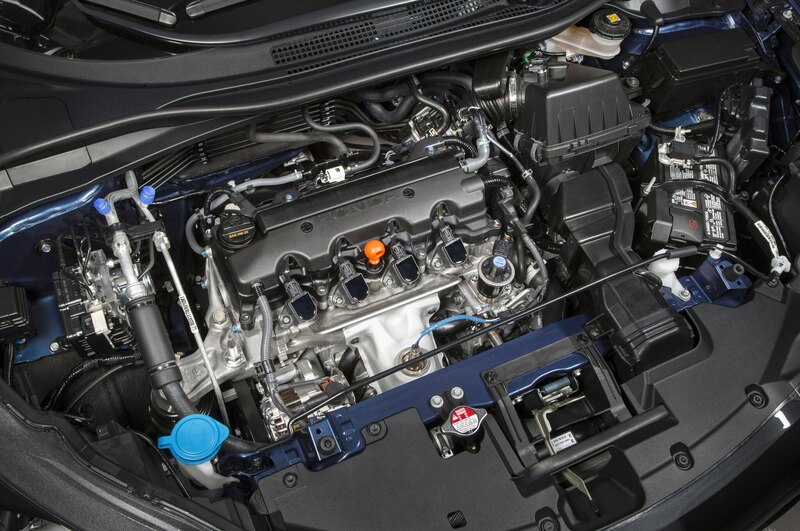 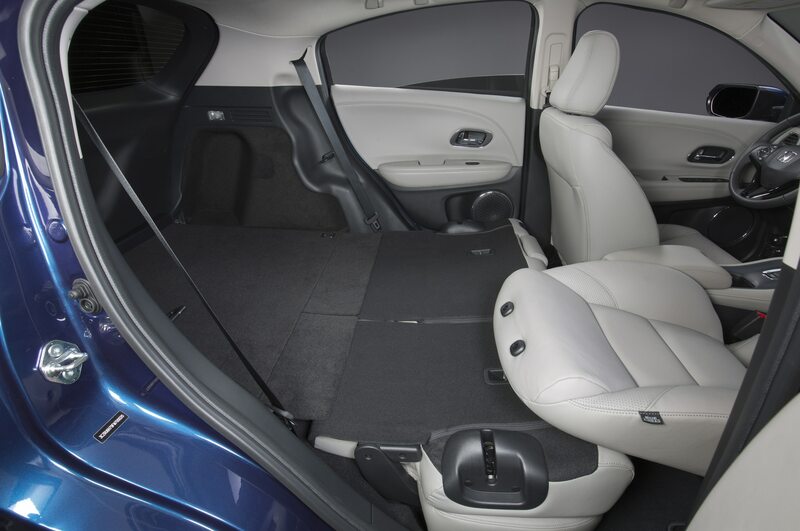 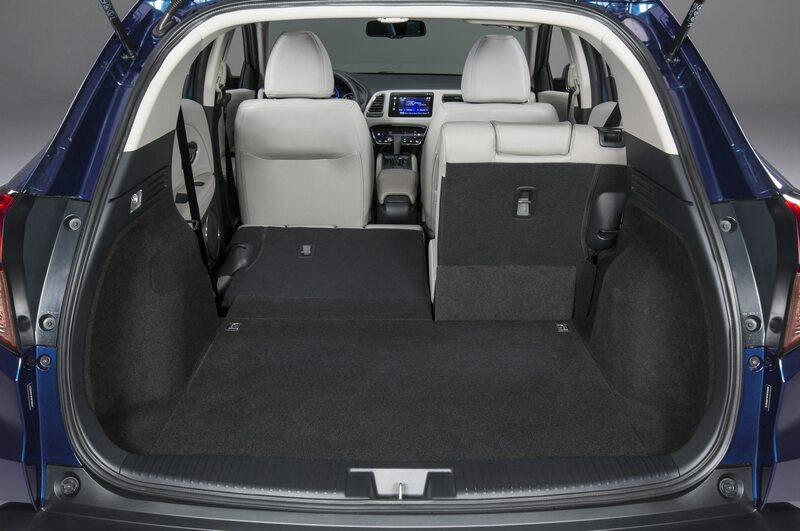 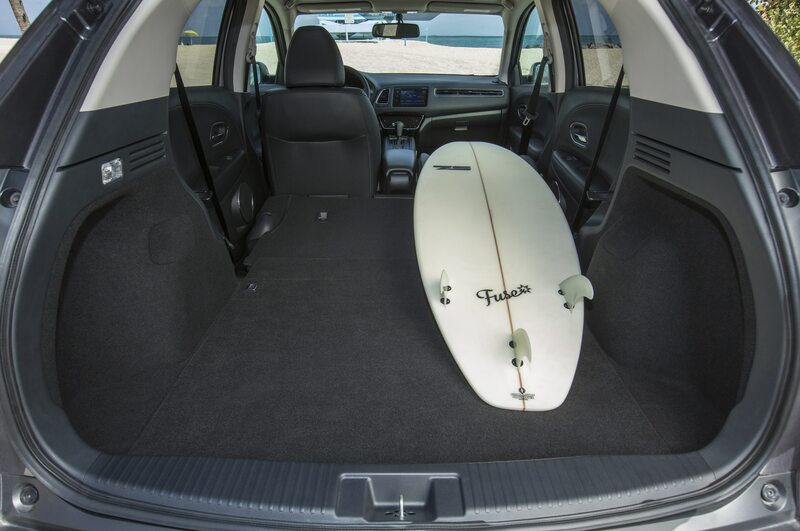 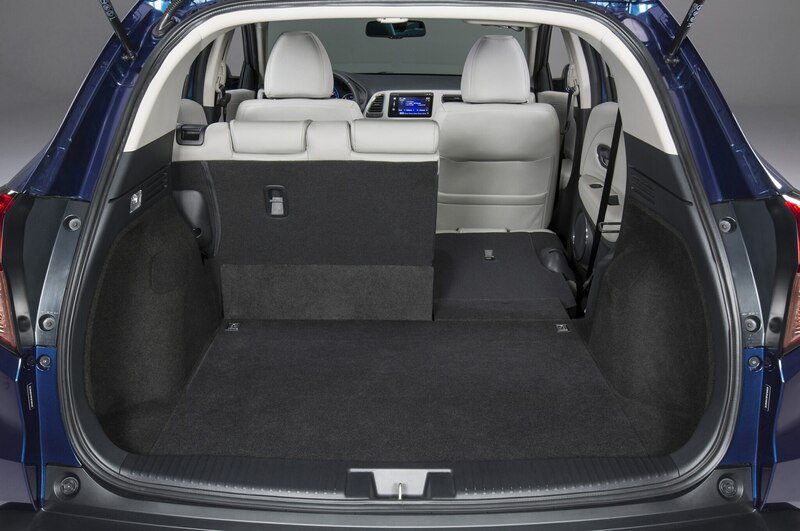 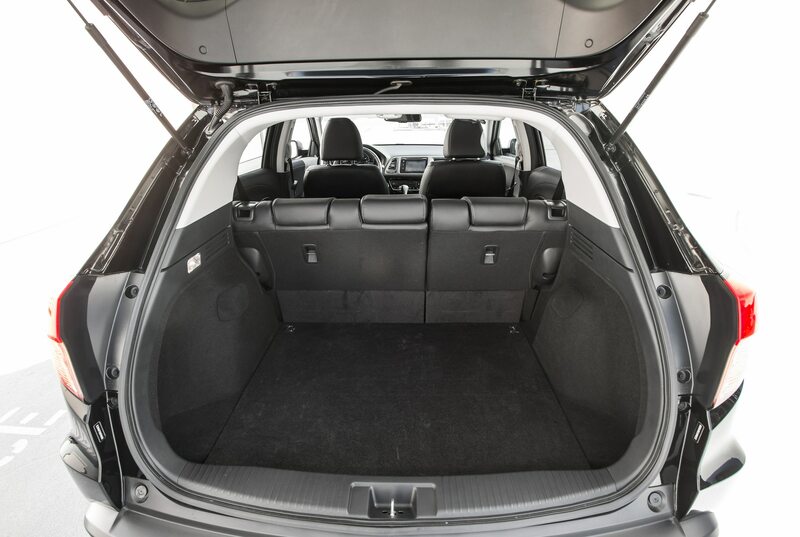 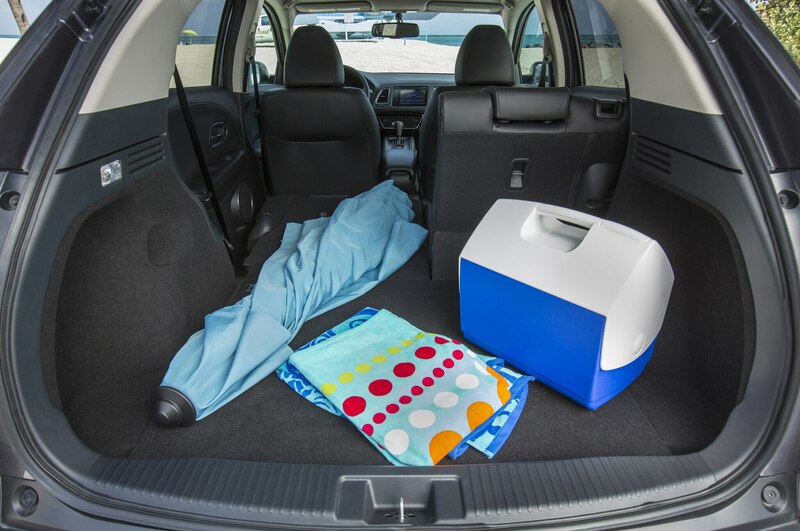 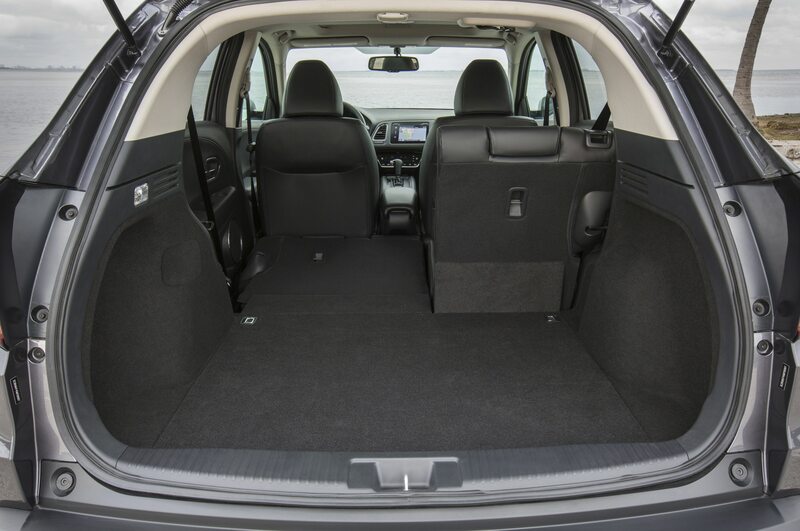 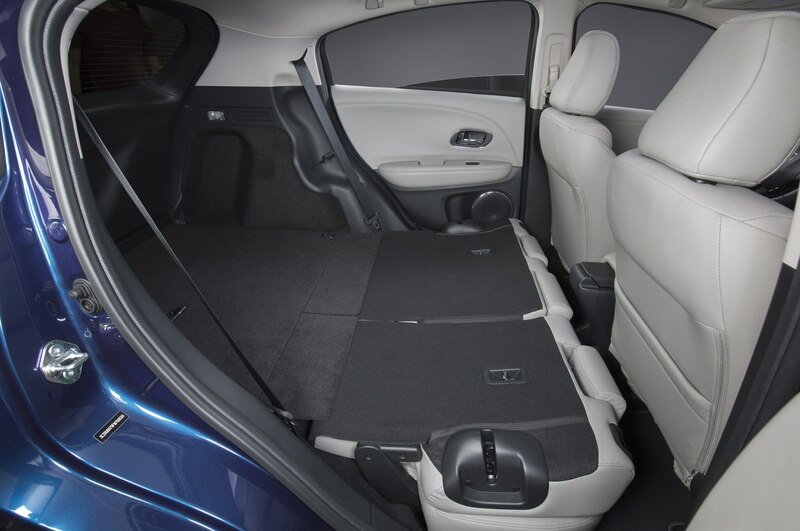 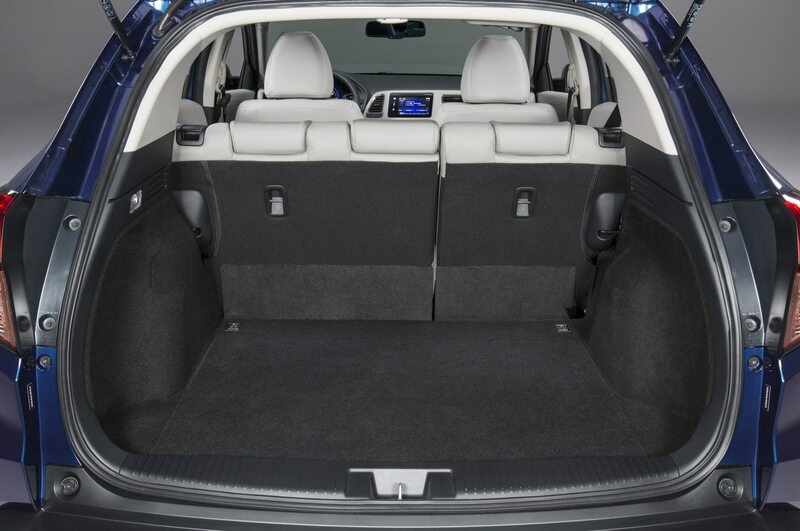 The HR-V’s center-mounted fuel tank layout affords a low, flat cargo floor, which helps make every square inch of the 58.8 cubic feet of maximum cargo capacity usable. 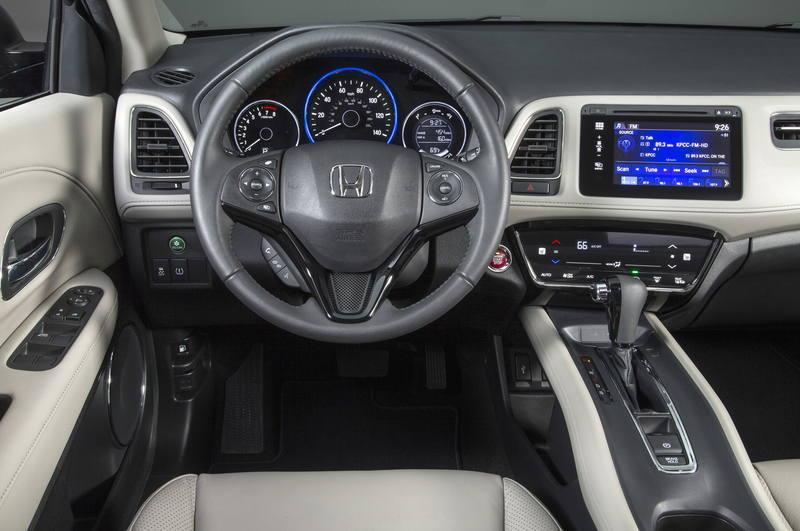 The driver-oriented dash also creates a sportier, cockpit-like atmosphere that avoids the CR-V’s open layout that makes it feel like a minivan. 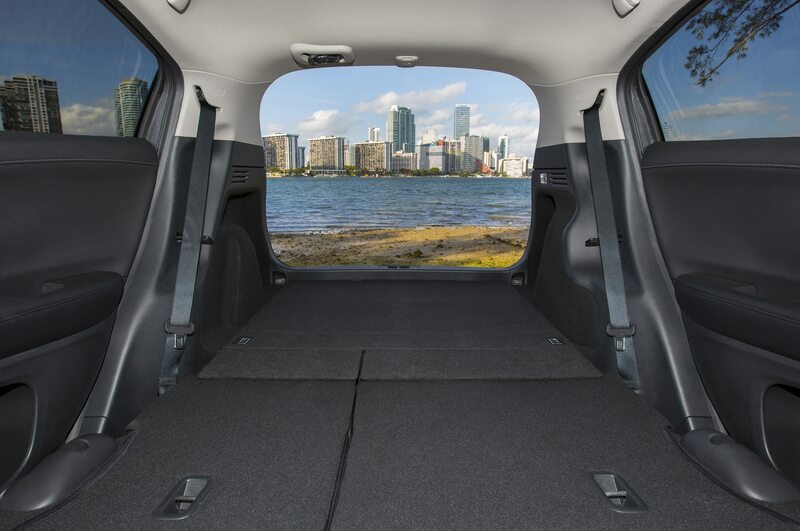 Visibility is still uncompromised, with a clear view out front and rear thanks to a relatively low beltline and large windows. 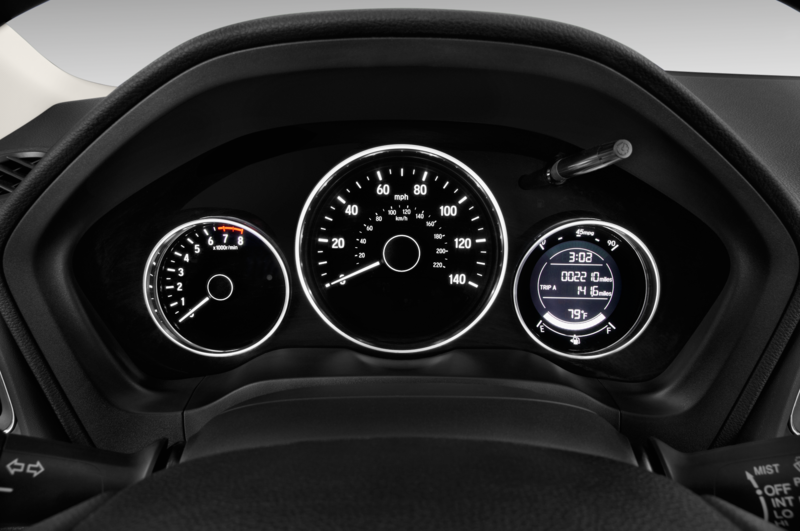 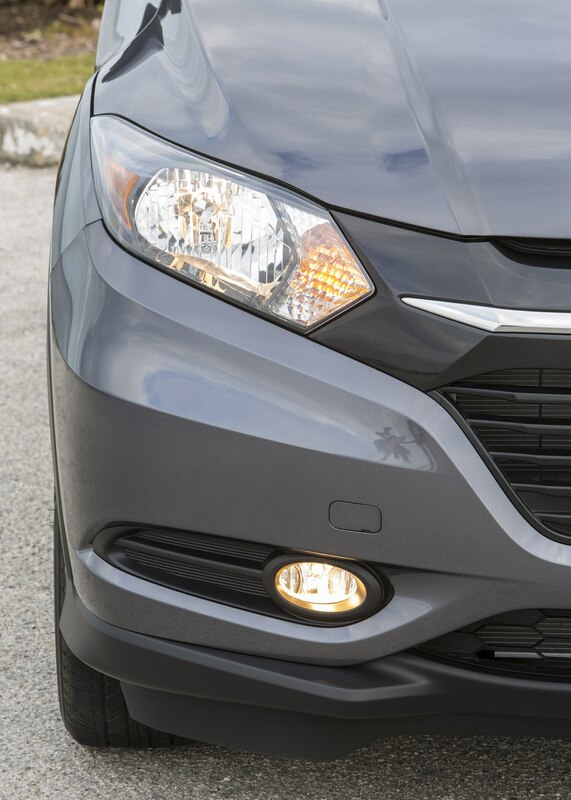 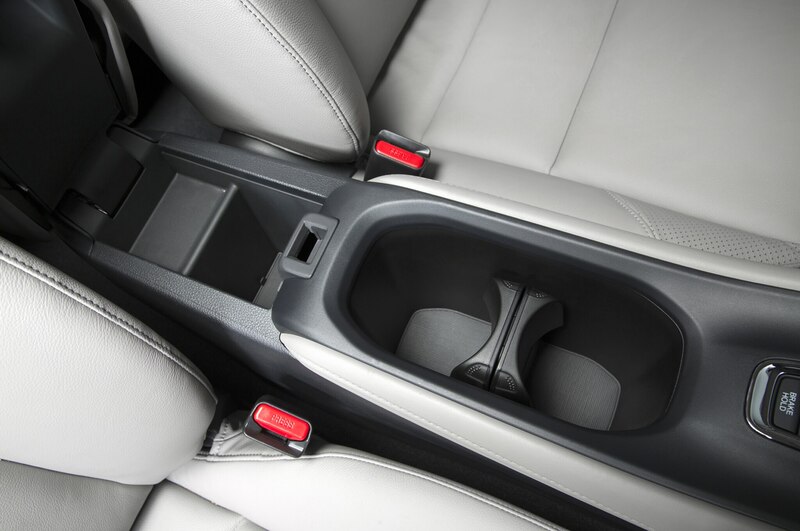 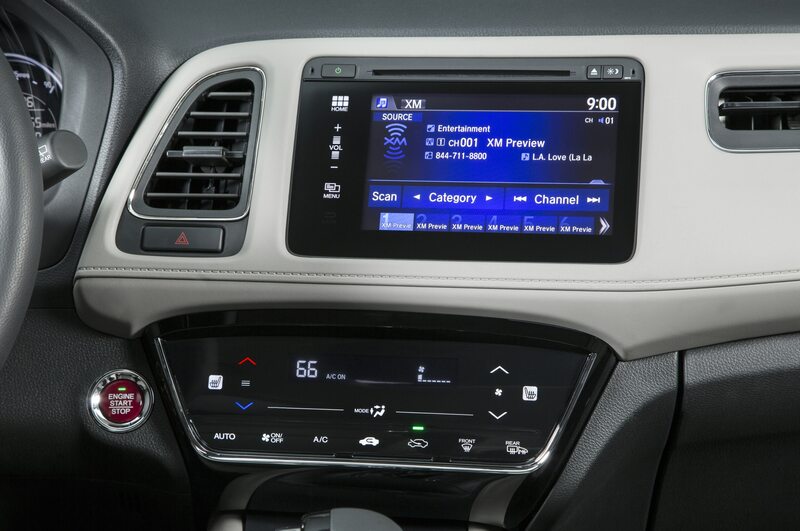 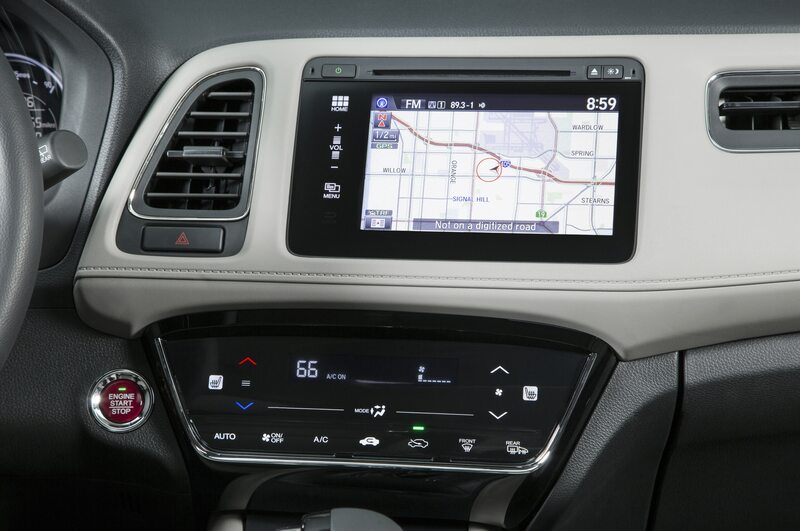 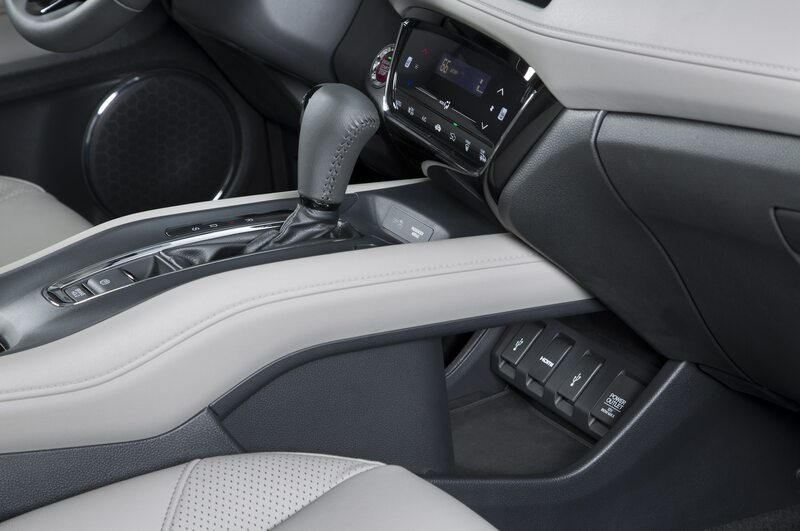 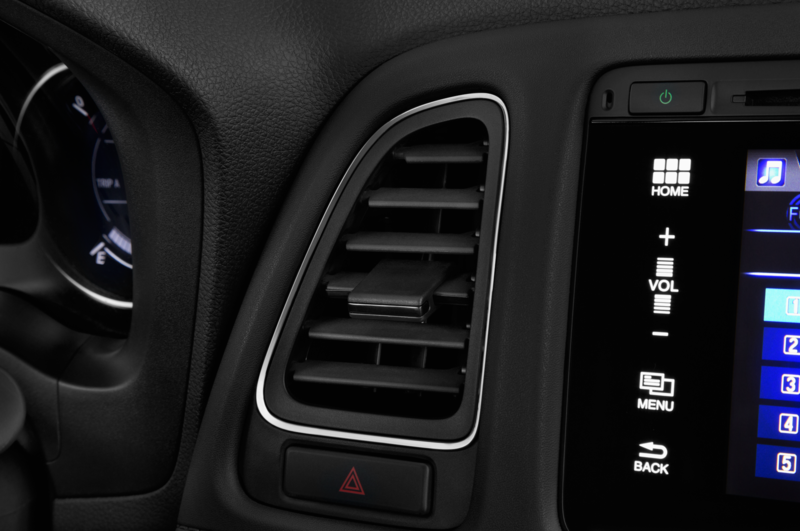 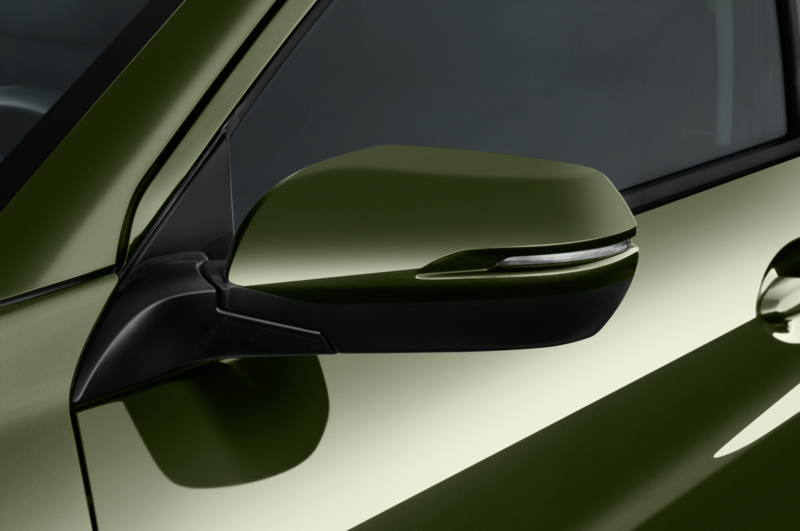 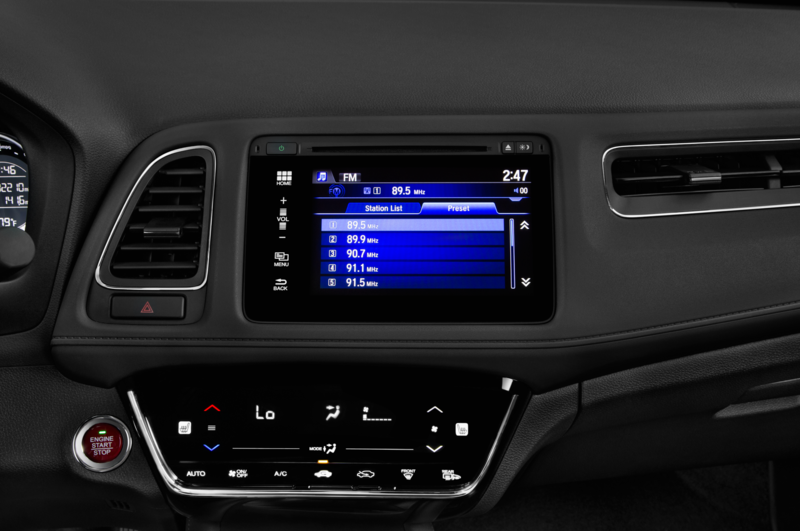 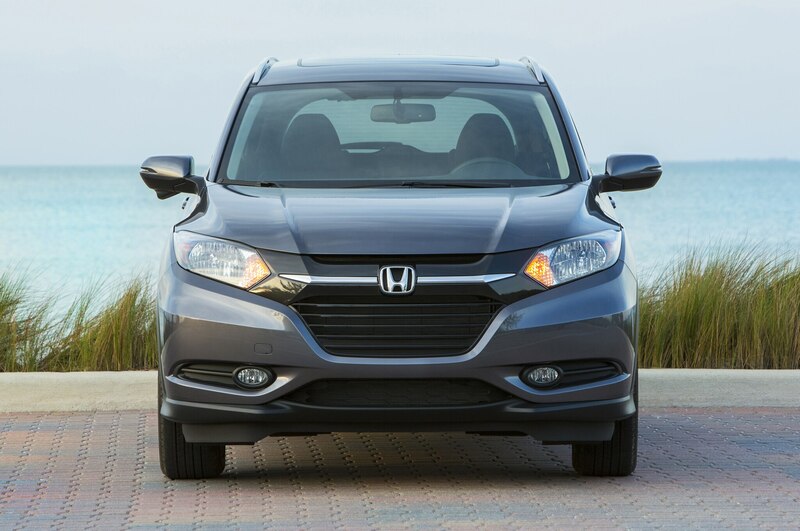 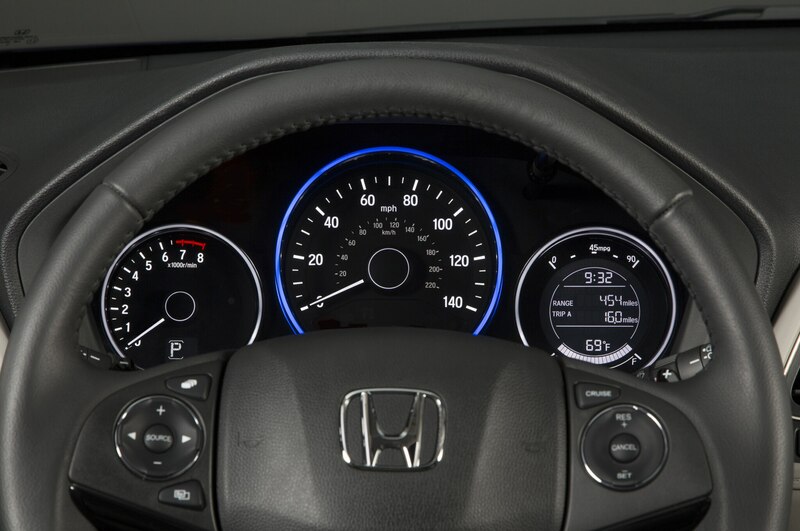 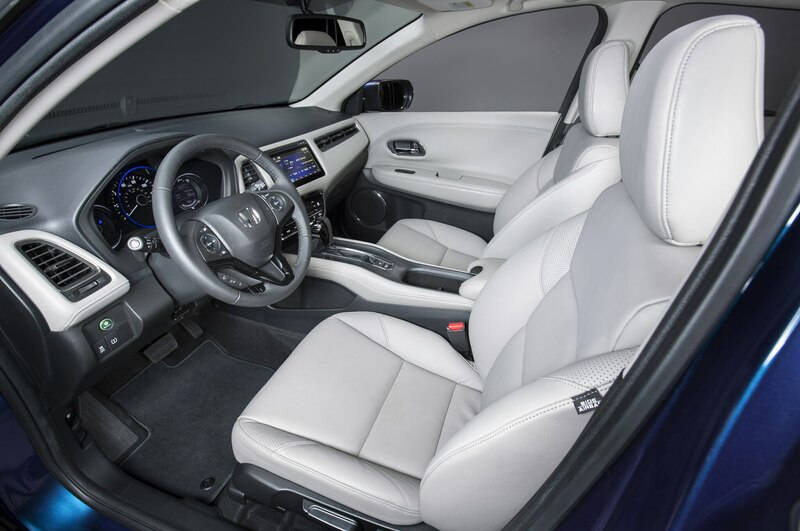 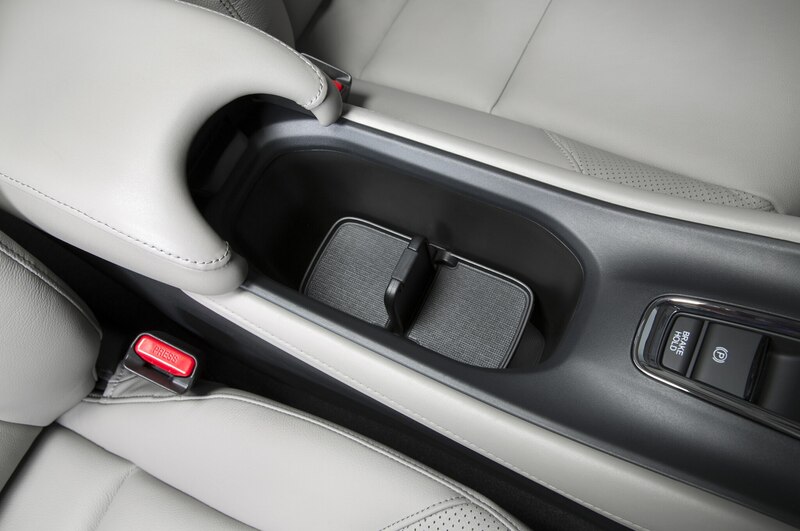 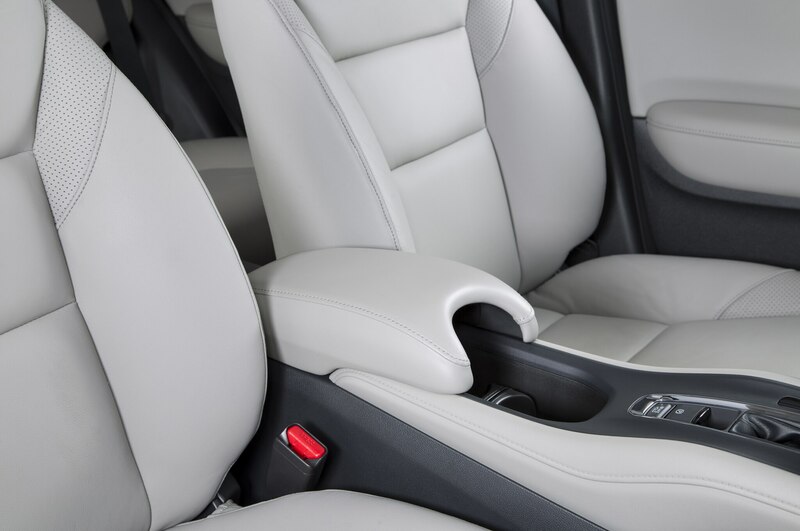 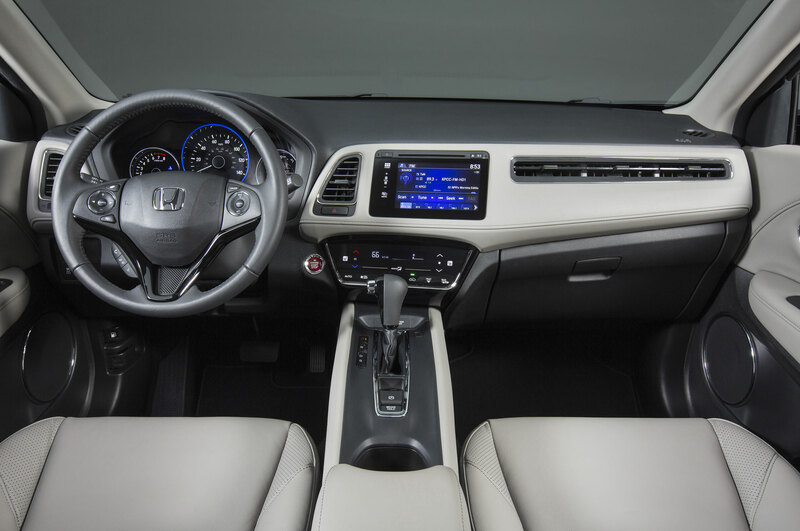 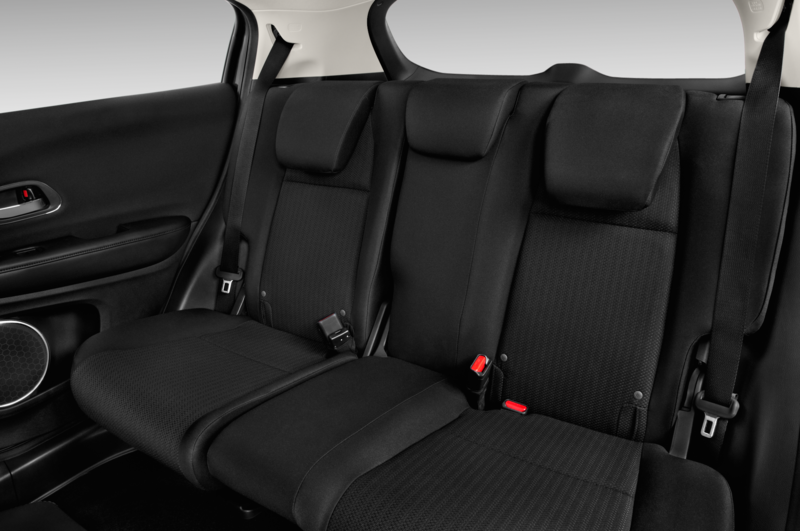 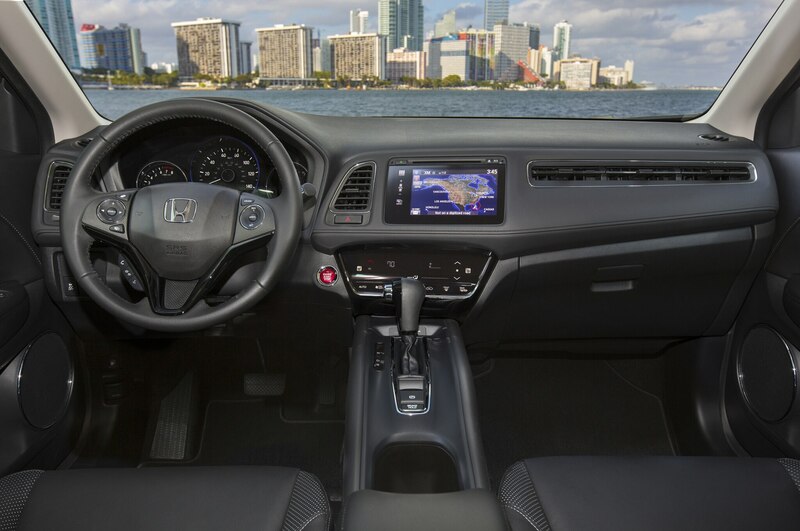 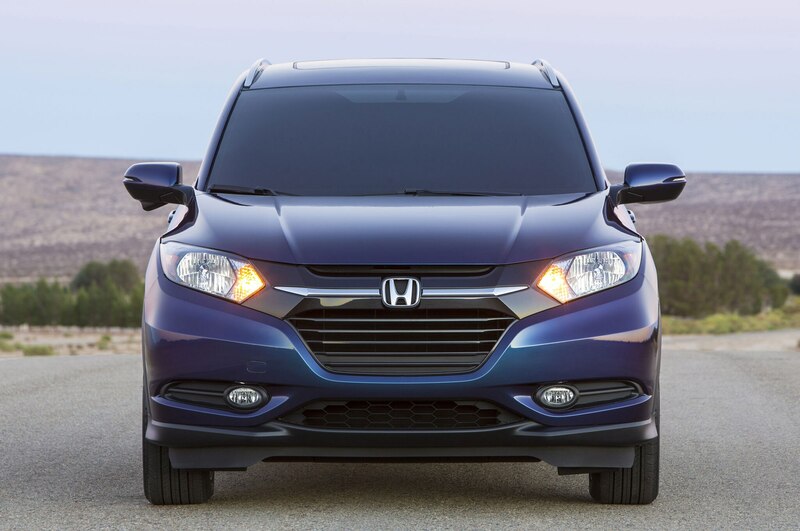 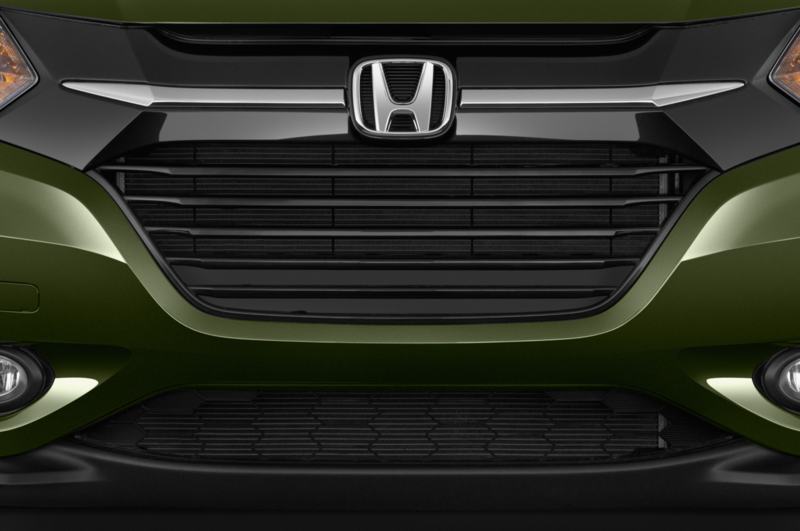 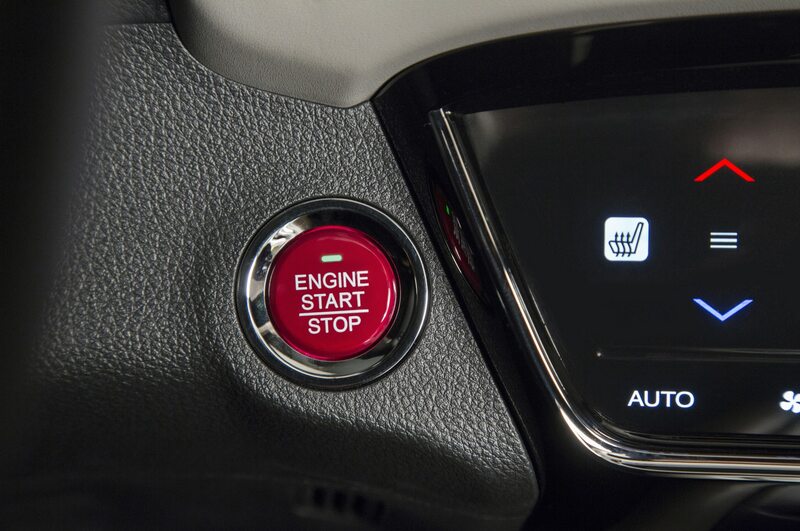 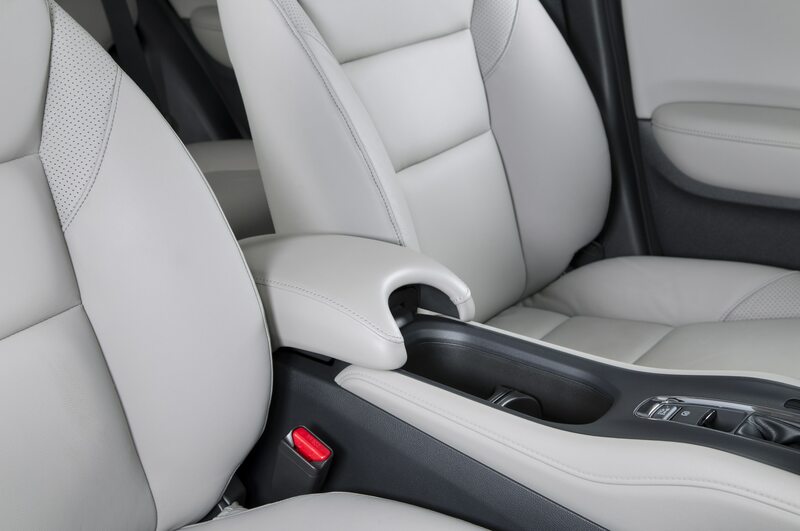 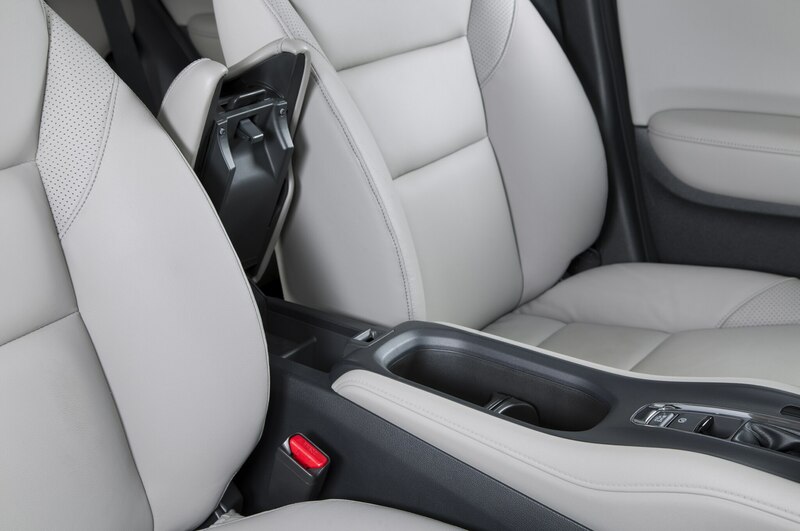 Soft-touch plastics and nice stitching surround the HR-V’s button-free console. 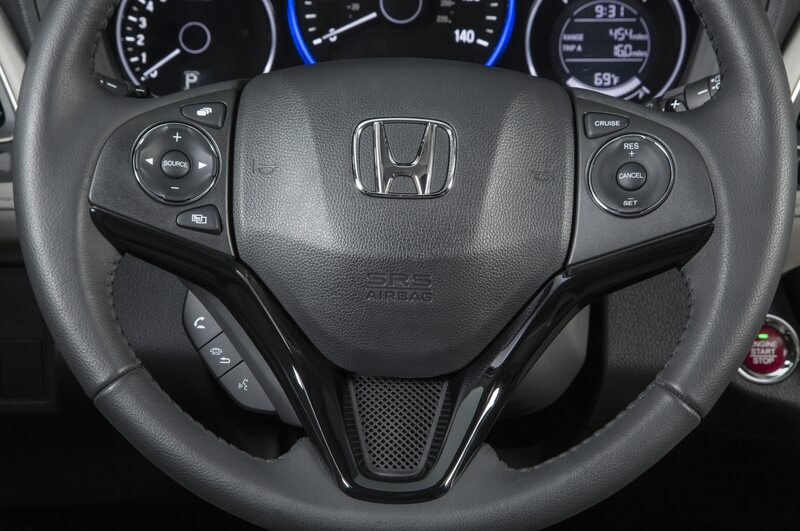 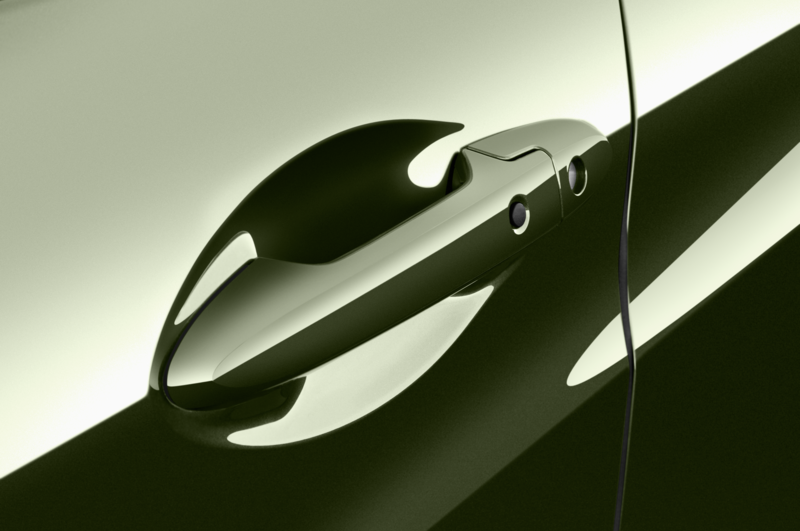 It looks sleek and futuristic, but the modern appearance is not worth its inconveniences. 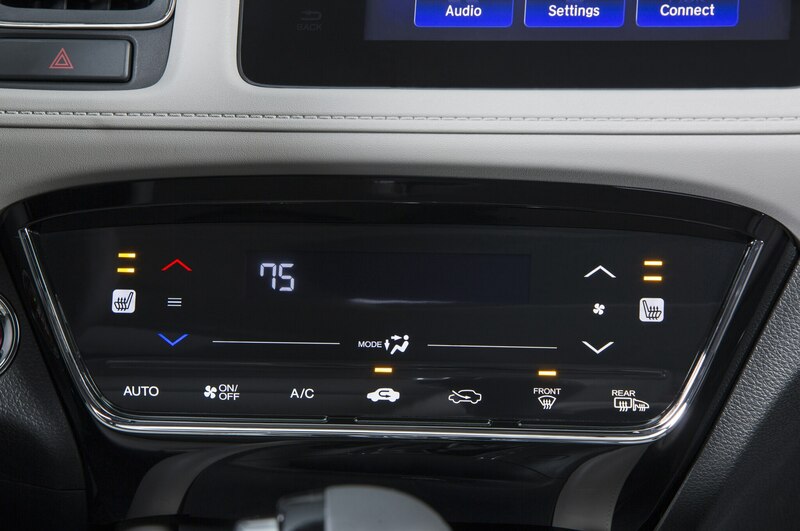 Seemingly simple tasks, like changing the volume or adjusting the temperature, are overcomplicated and distracting. 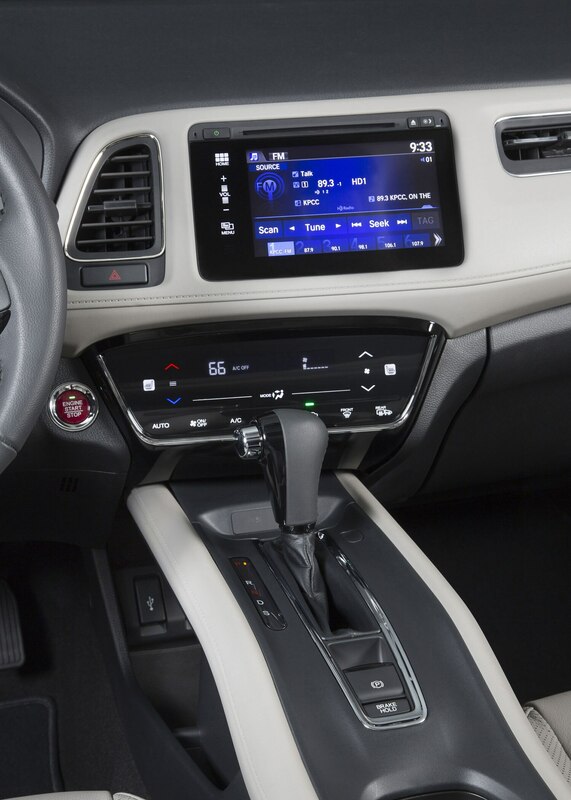 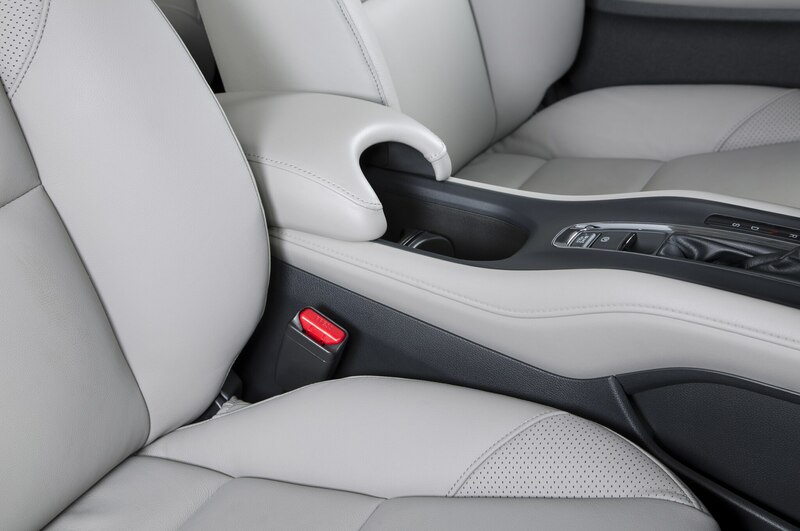 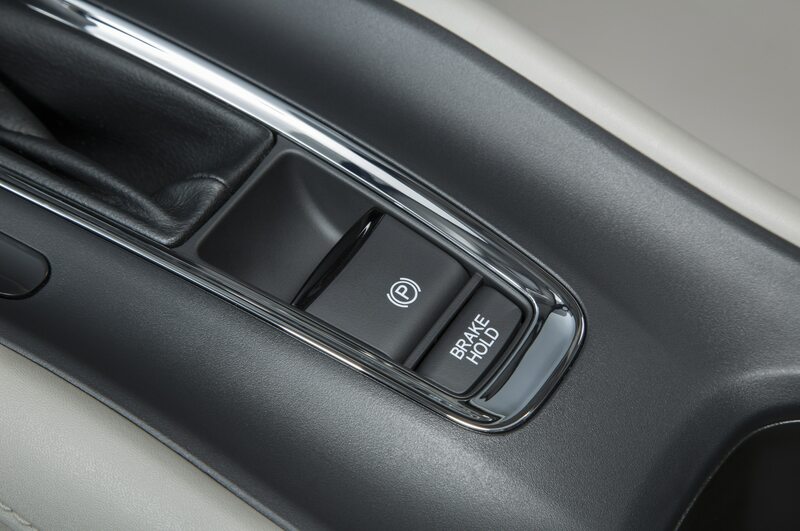 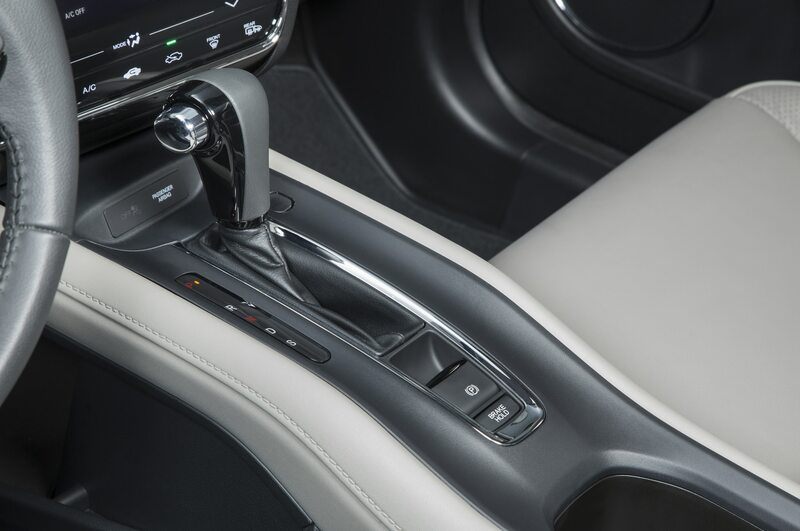 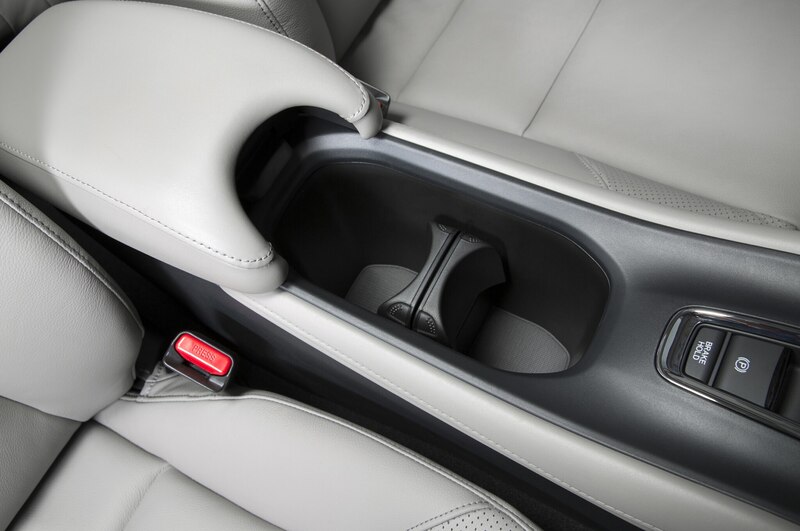 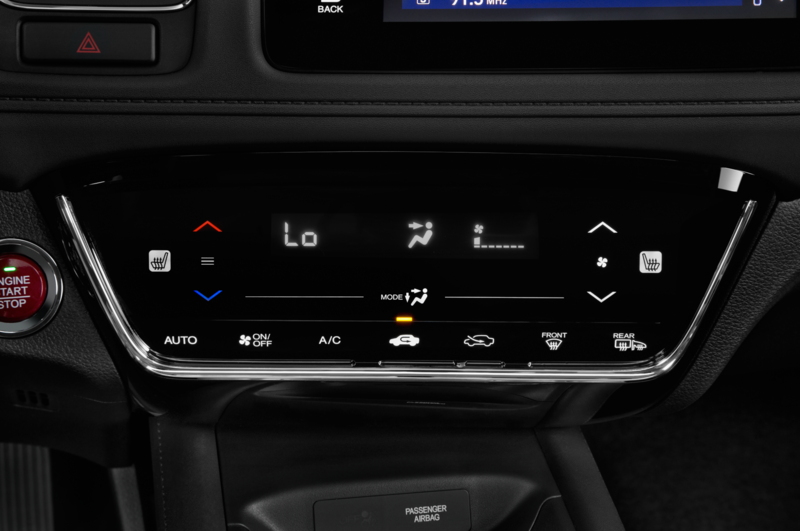 We would gravitate toward the base LX model, which does away with the trying touch-sensitive controls altogether. 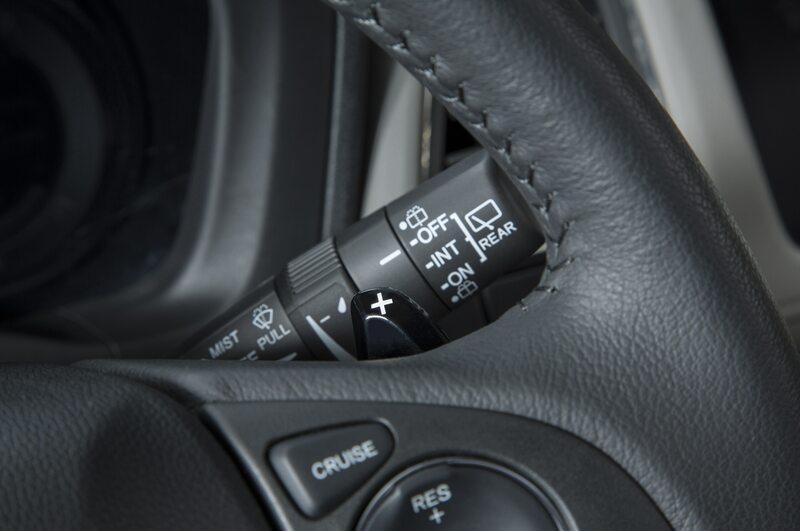 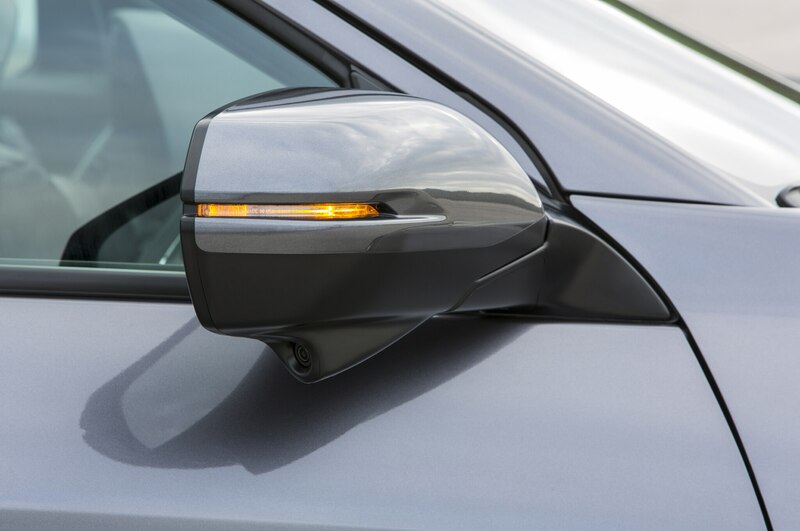 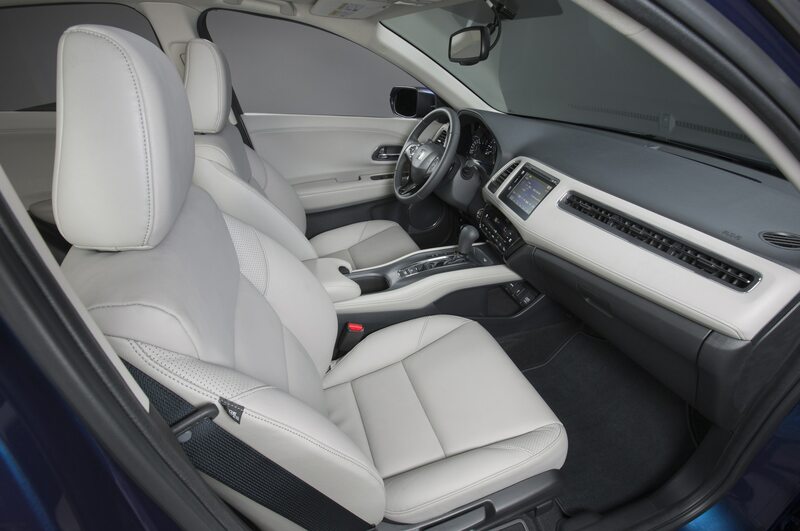 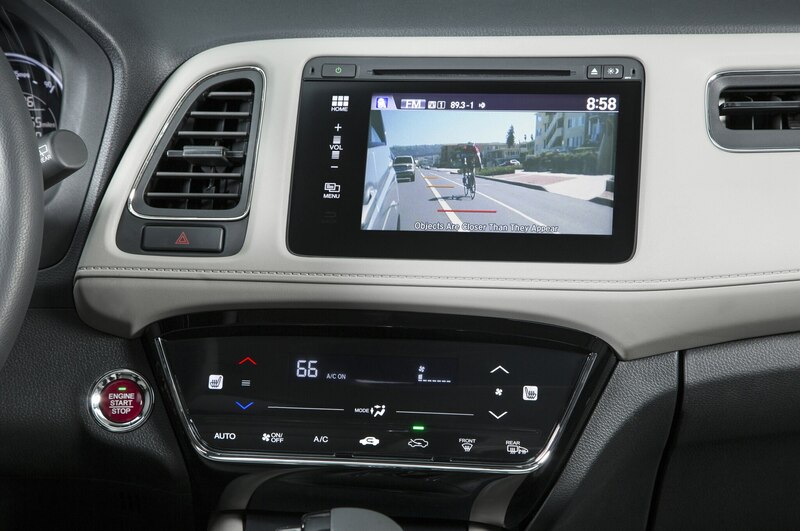 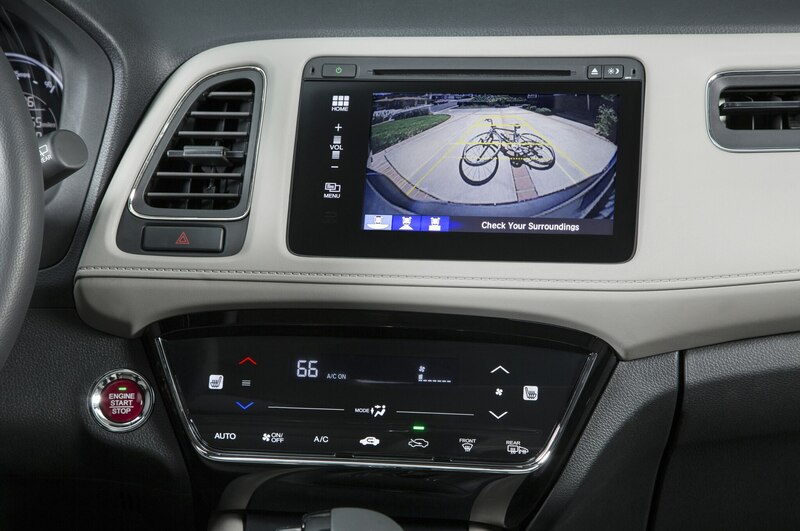 The LX still has plenty of equipment, including a backup camera, Bluetooth, a USB port, and cruise control, and it doesn’t look like other base models clad with cheap-looking wheels and black plastic trim. 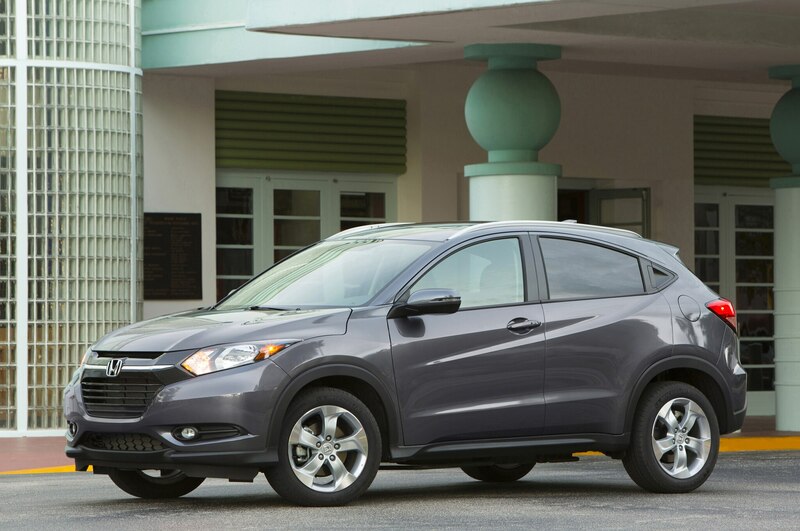 Its starting cost of just under $20,000 also means that the HR-V LX is about the same price as a Civic sedan. 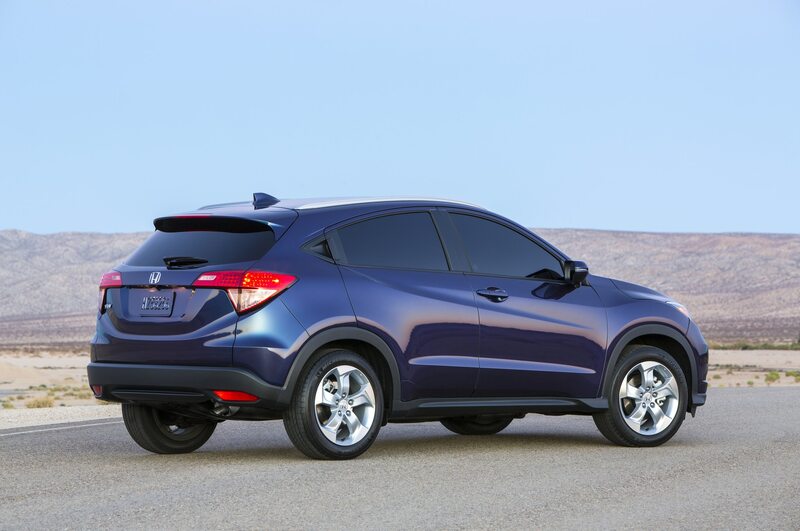 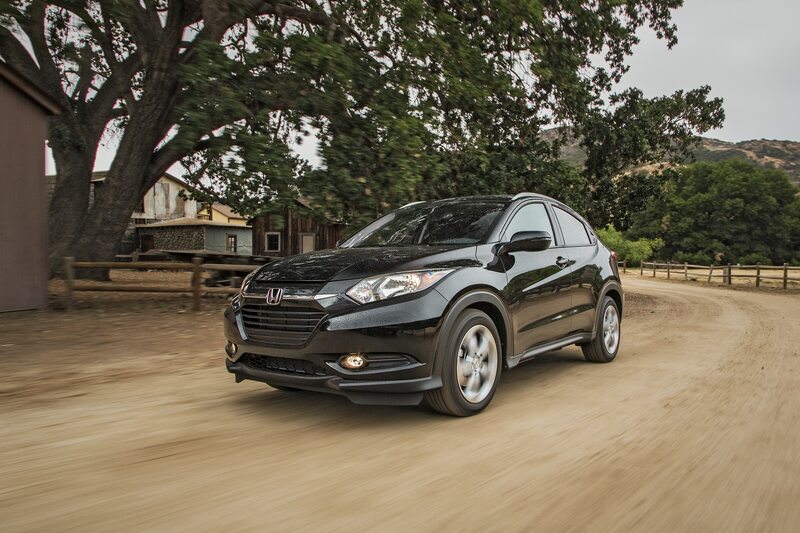 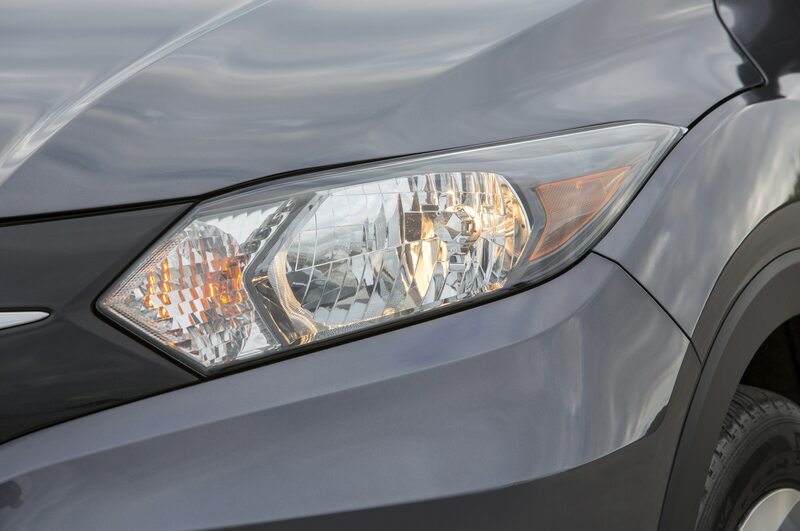 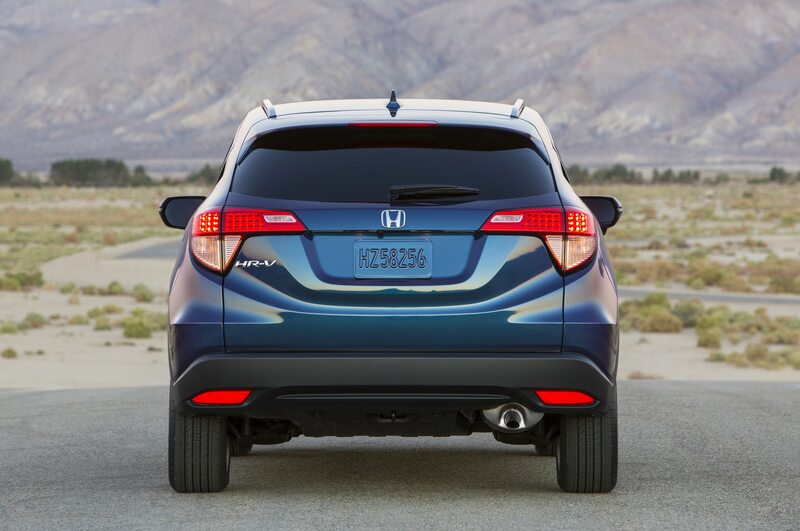 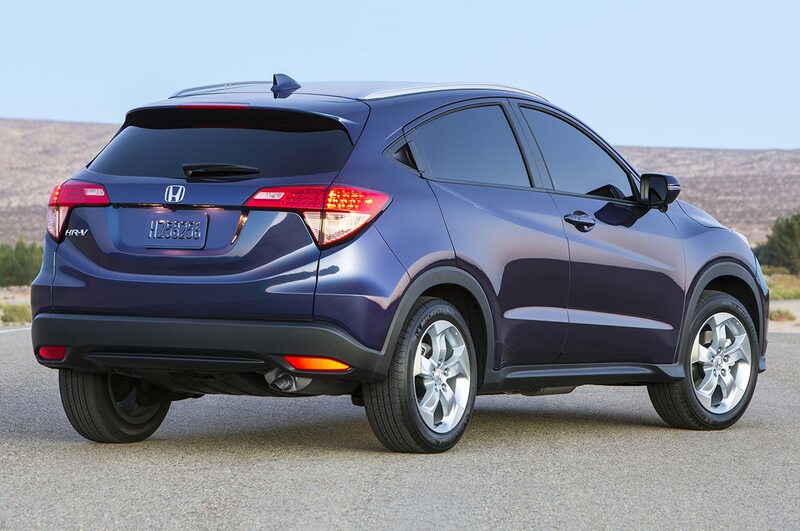 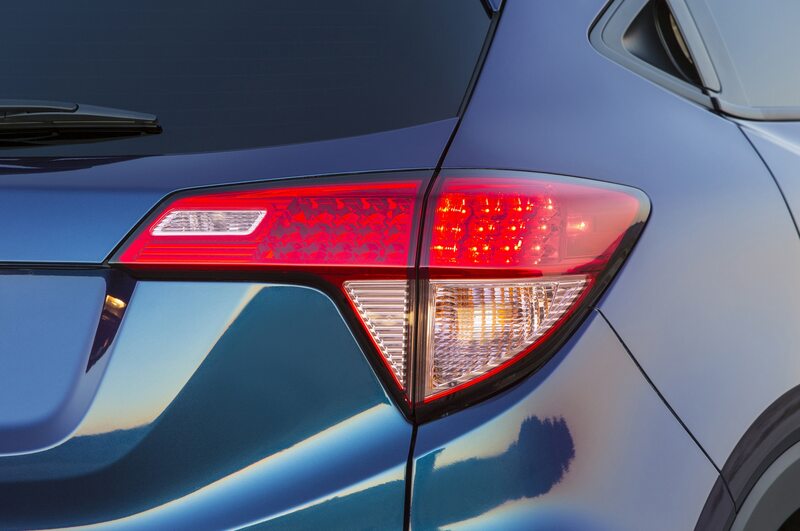 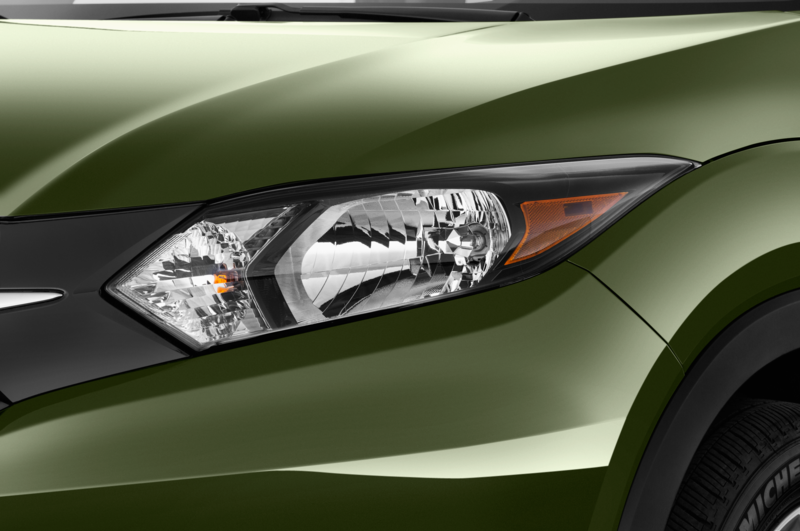 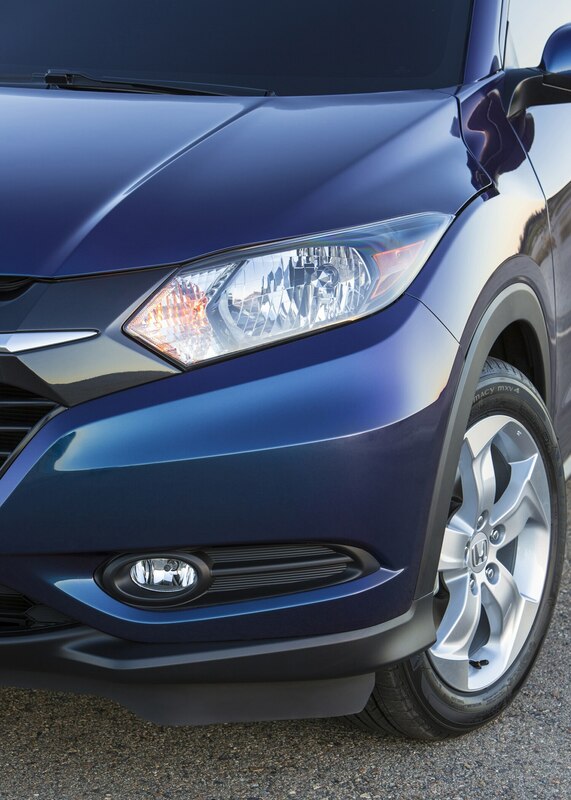 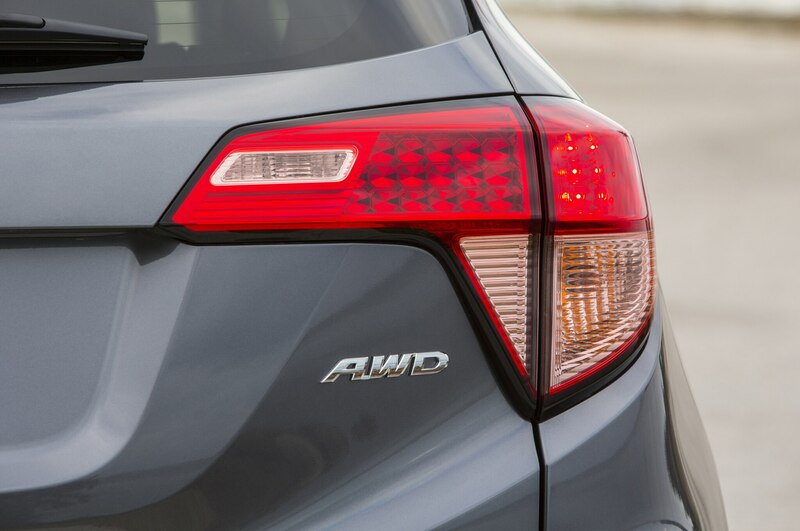 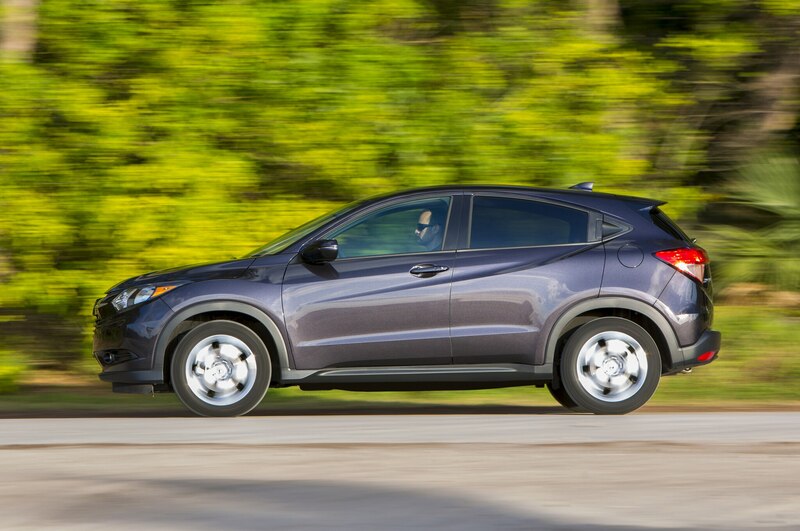 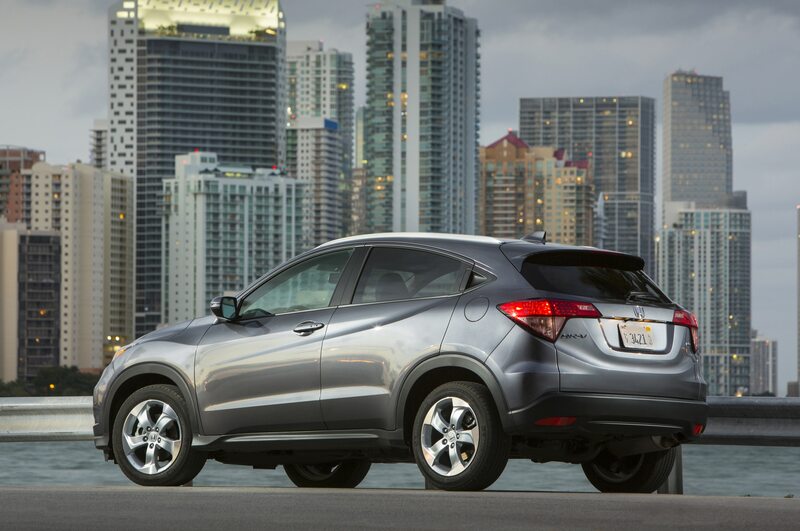 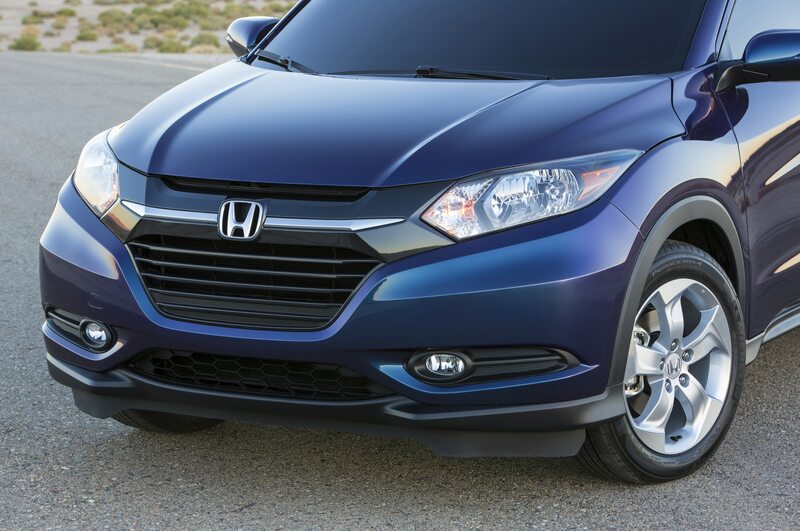 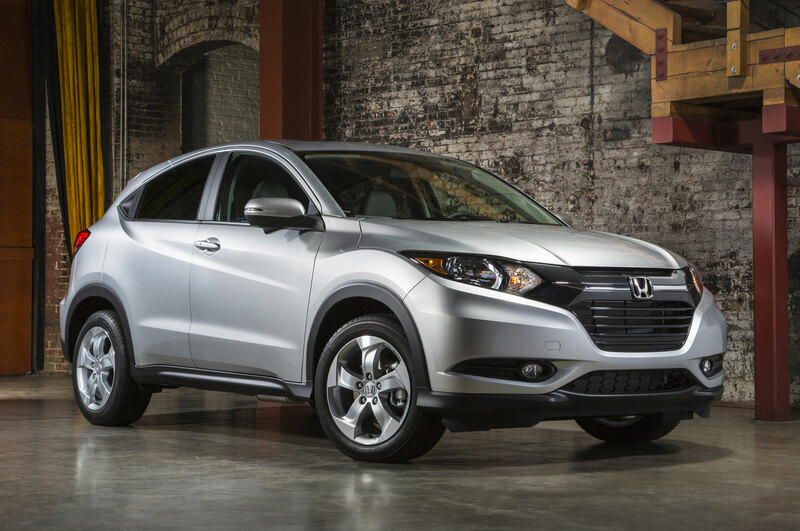 The more you look at the 2016 Honda HR-V in the context of Honda’s lineup, the more compelling it gets. 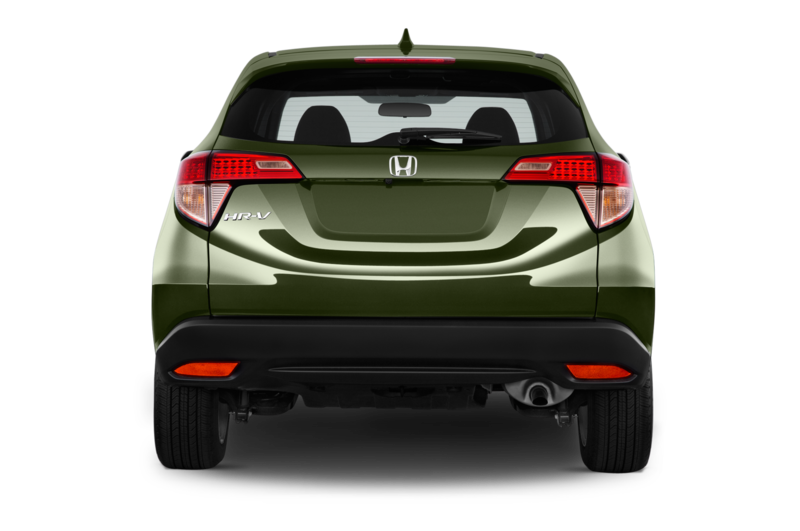 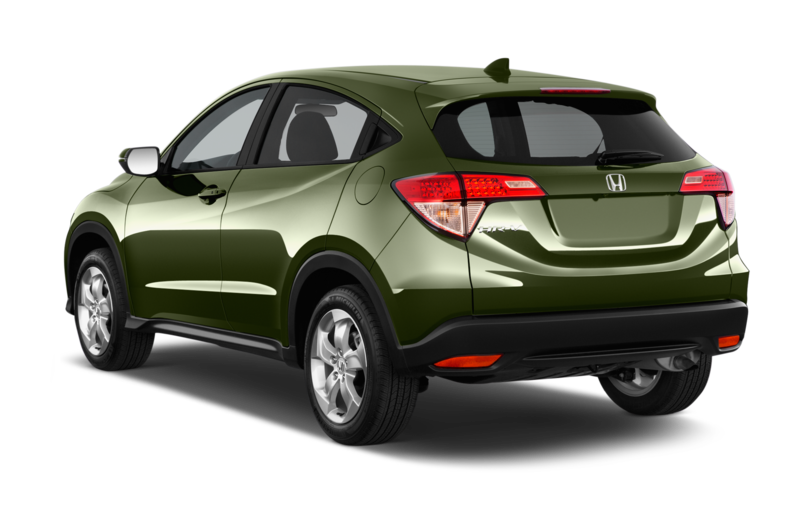 For a similar price and only a small fuel-economy penalty compared with the Civic or the Fit, the 2016 Honda HR-V offers more cargo space, available all-wheel drive, a high seating position that everyone seems to love, and a more cocooned driving experience. 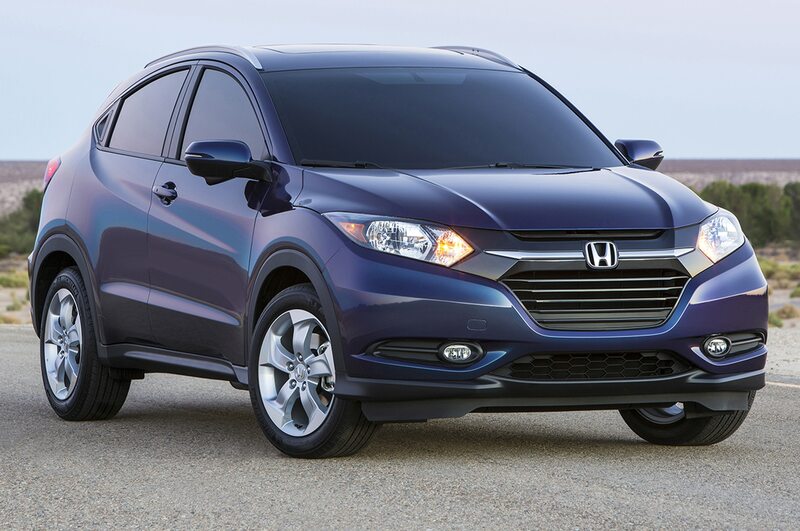 It’s also more maneuverable, more efficient, and less expensive than the CR-V. 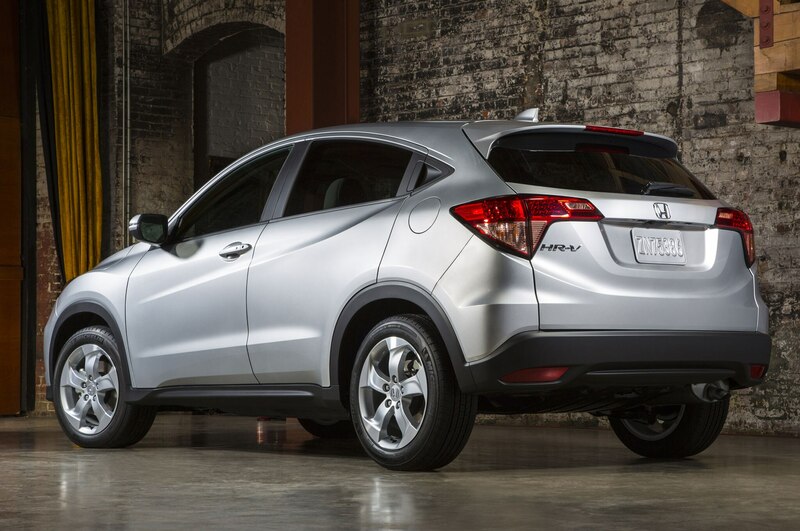 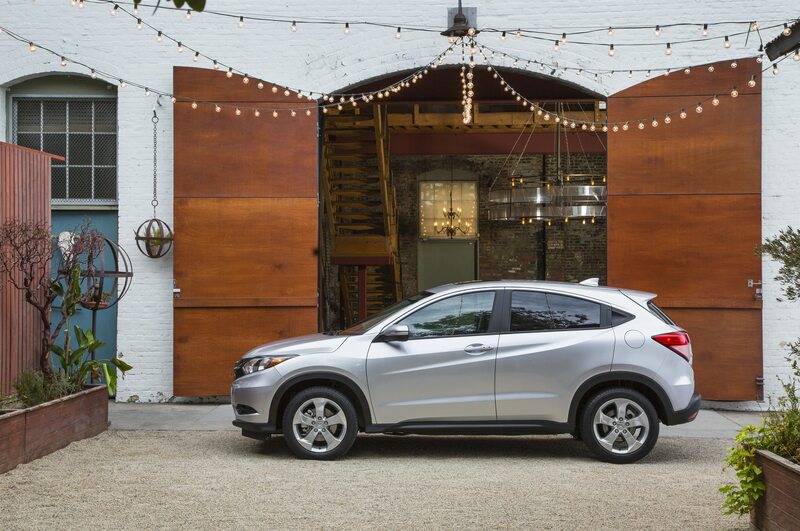 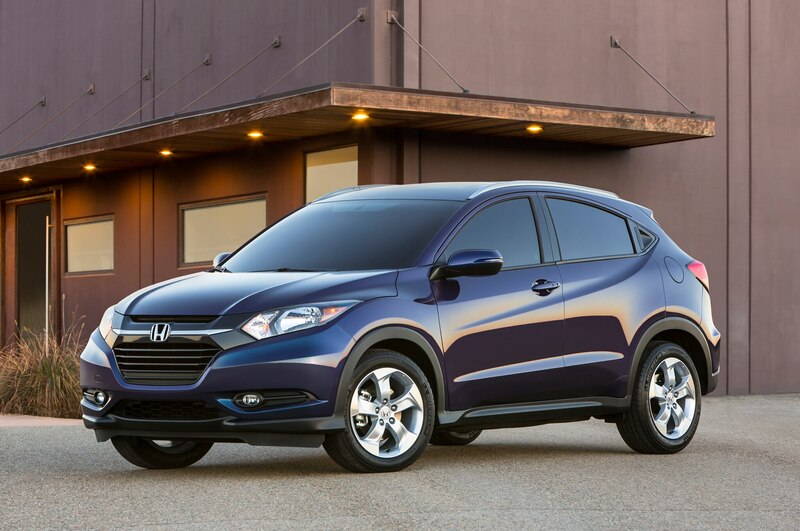 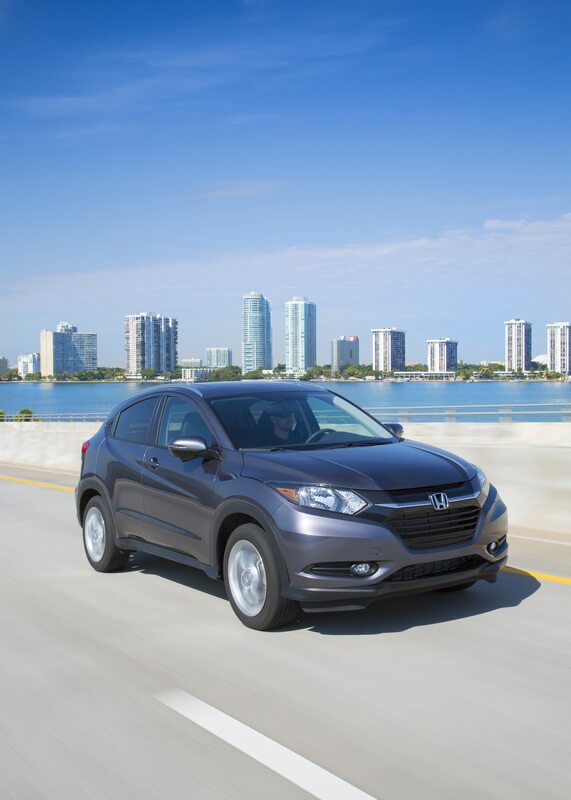 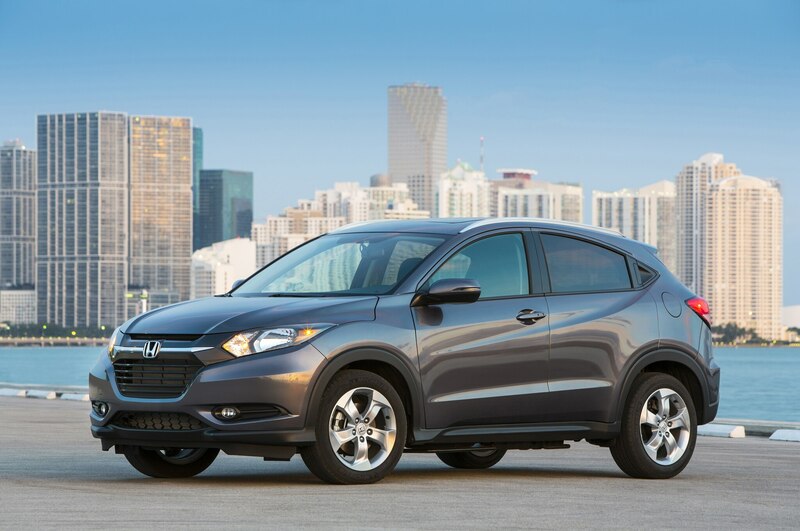 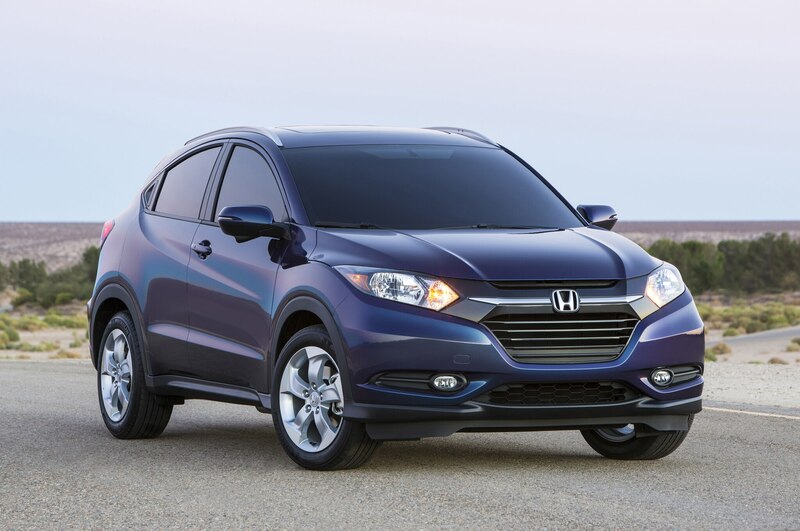 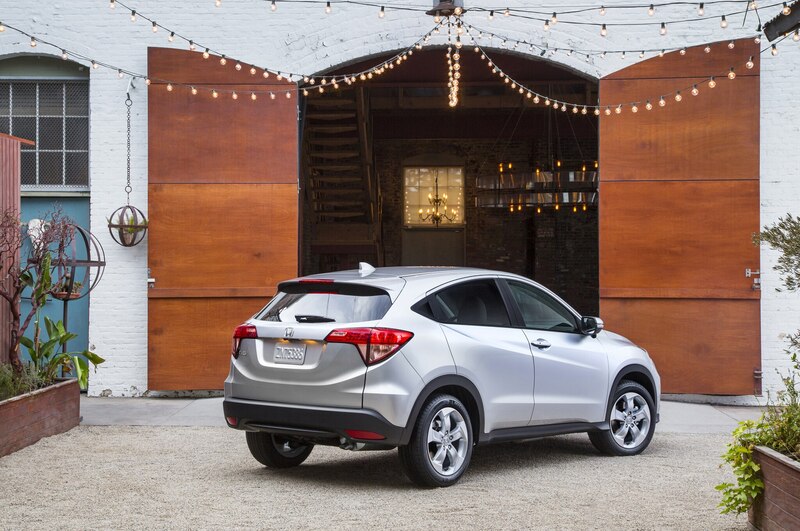 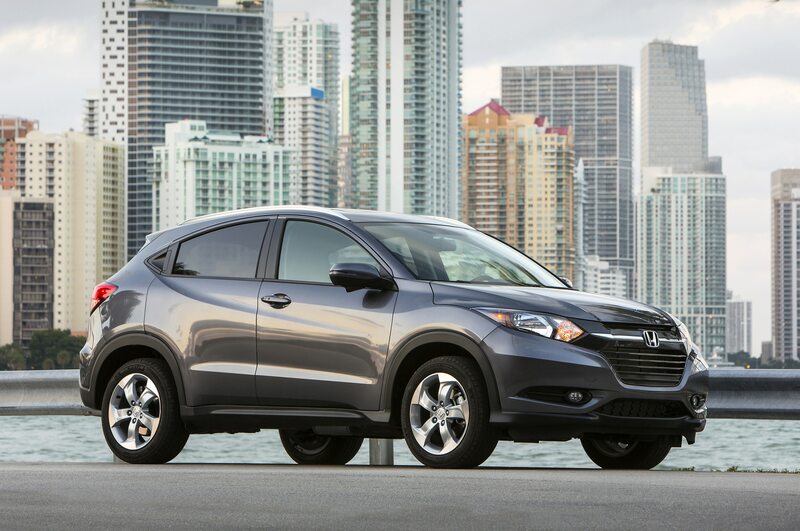 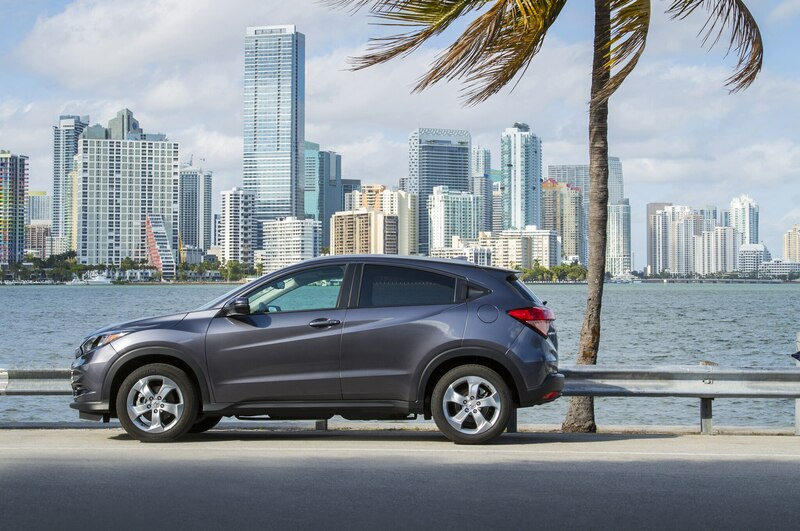 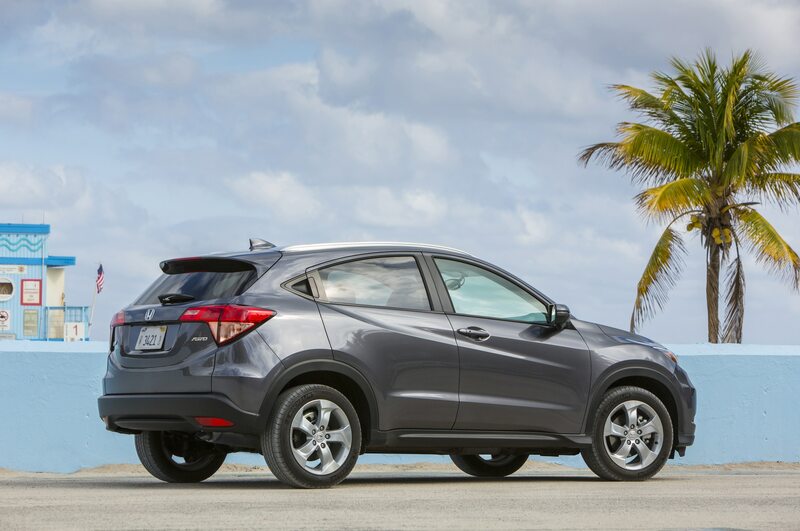 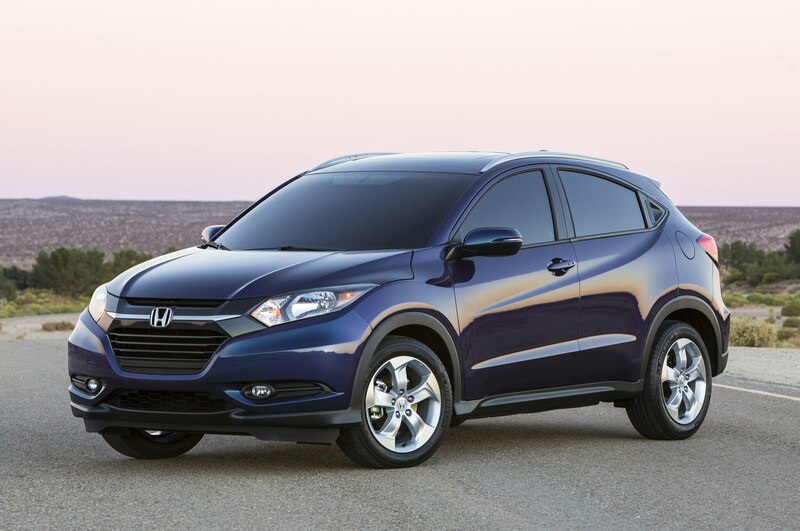 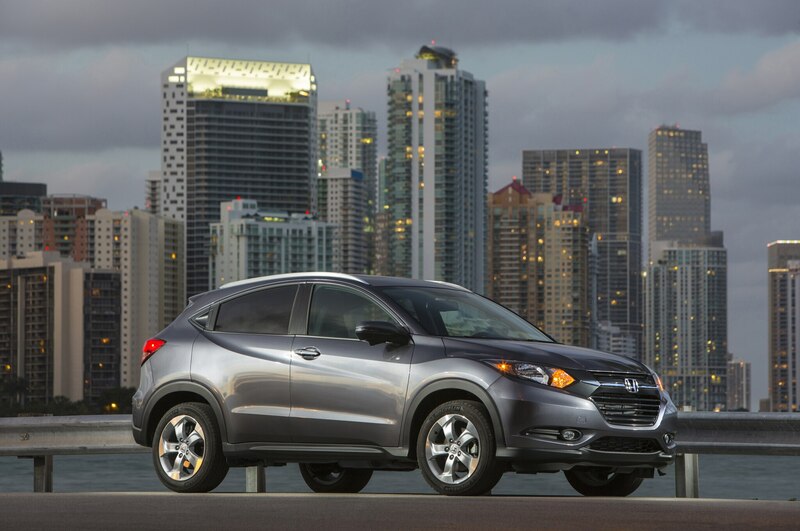 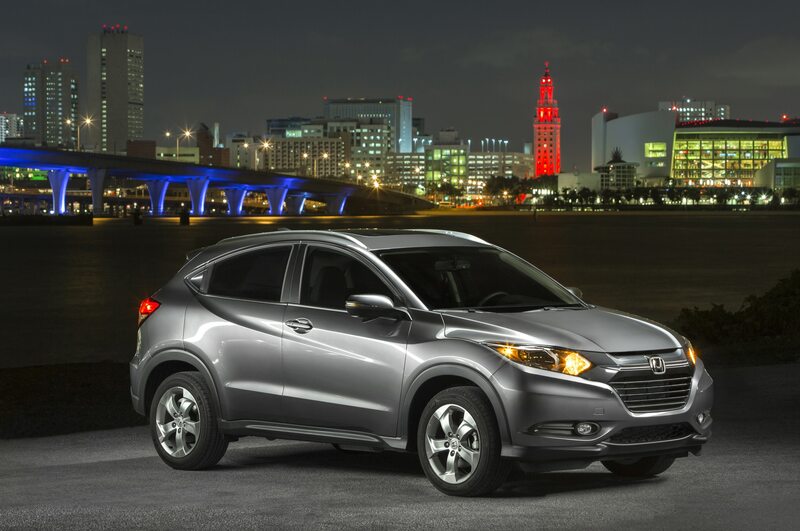 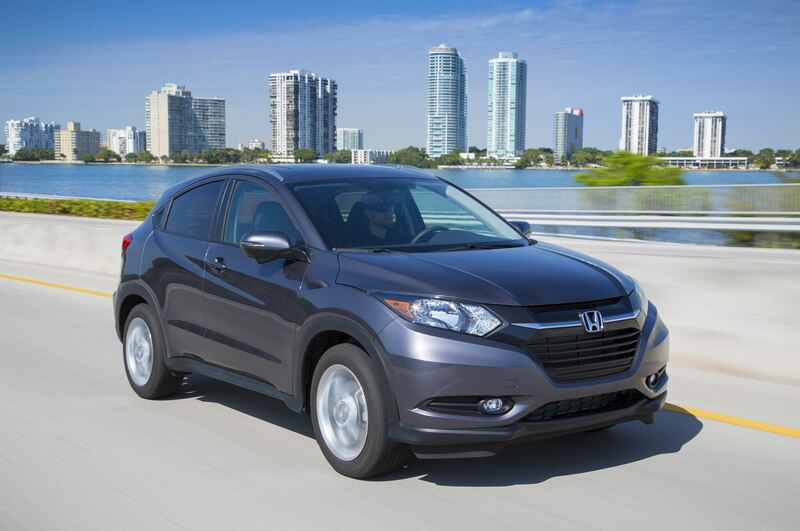 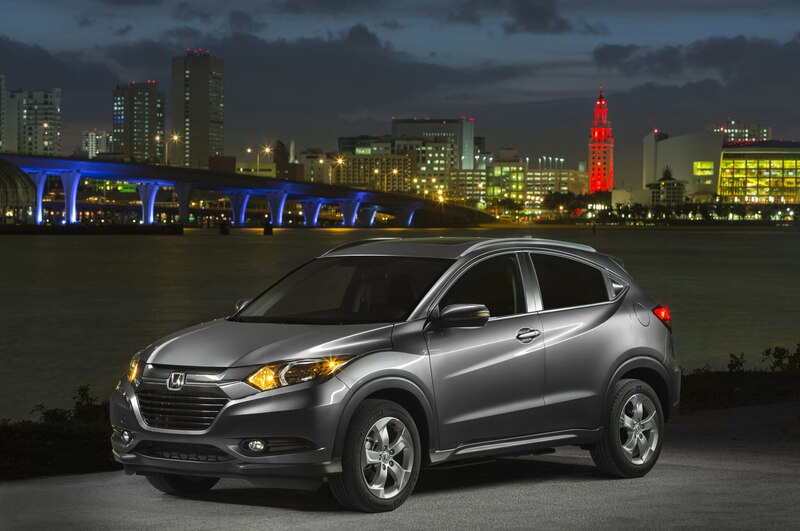 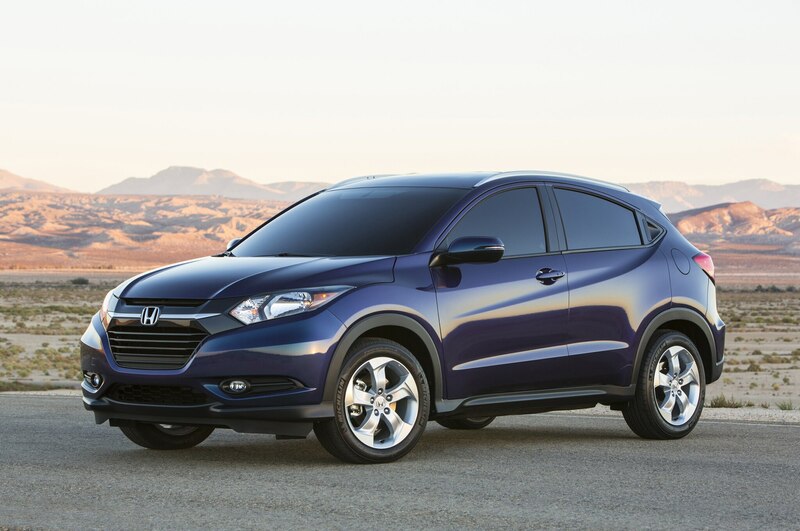 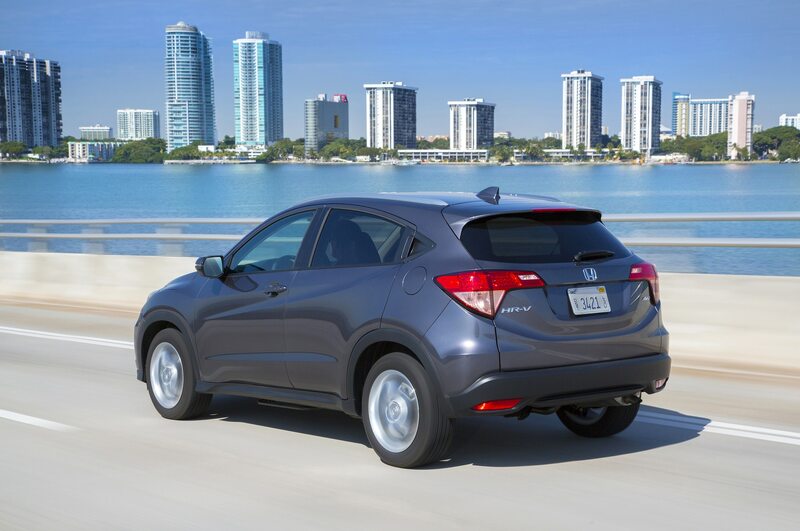 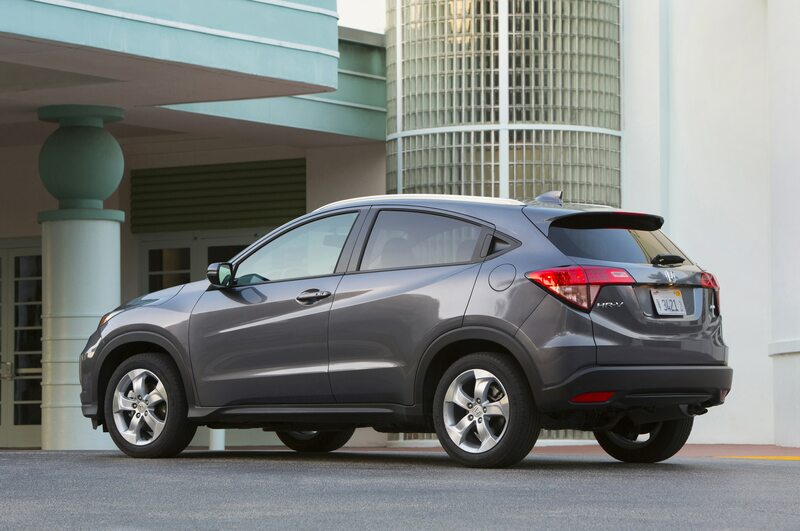 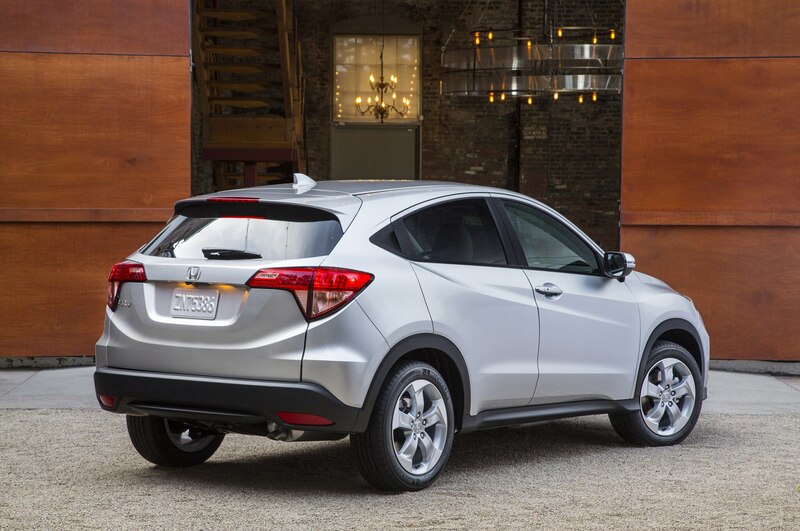 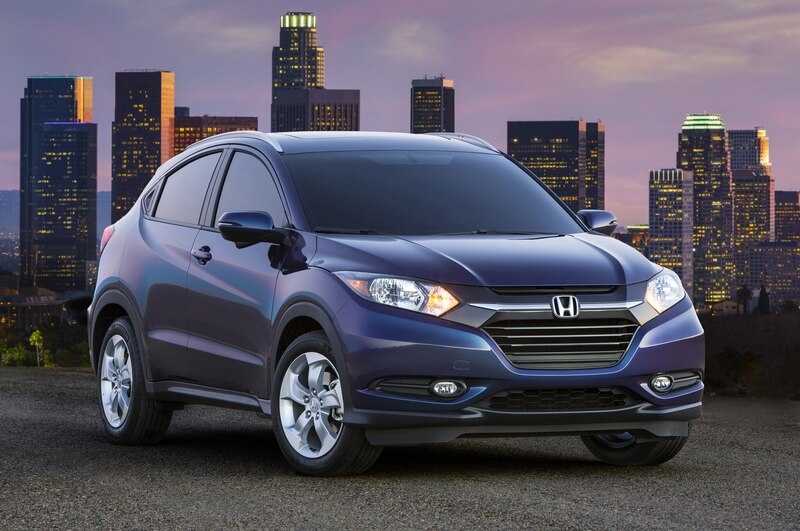 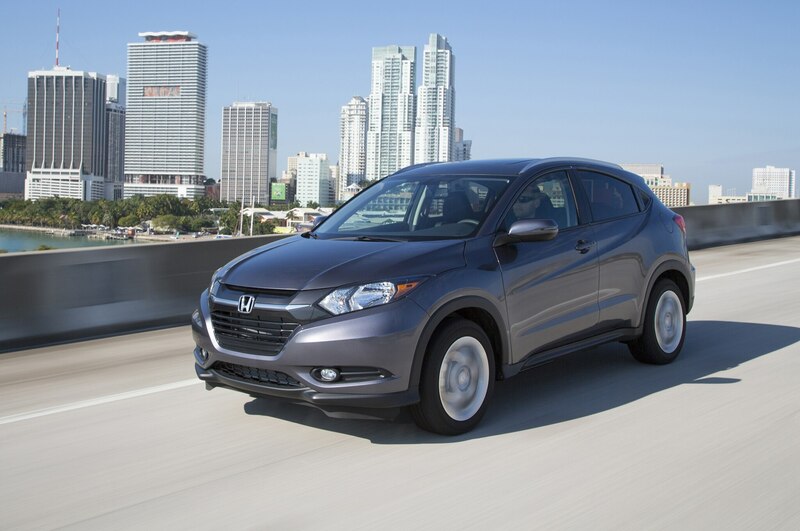 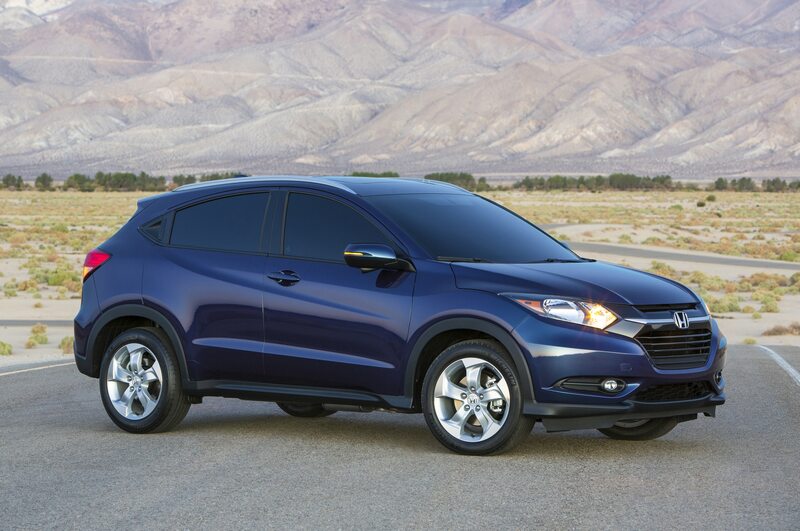 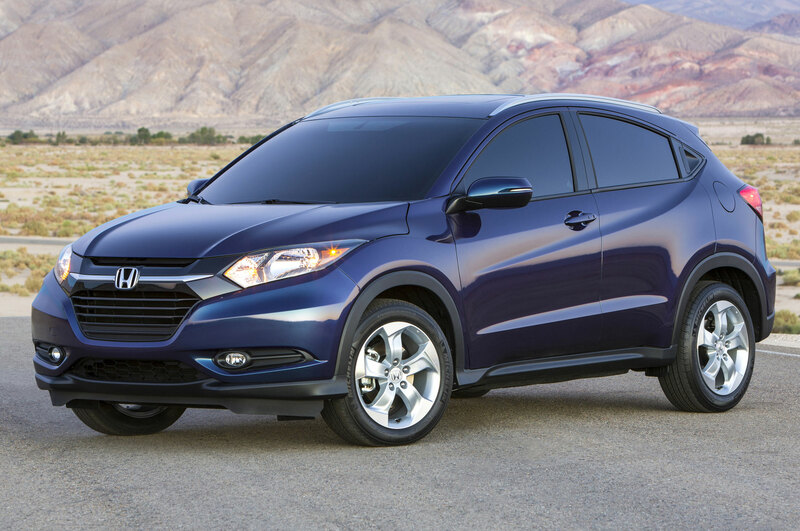 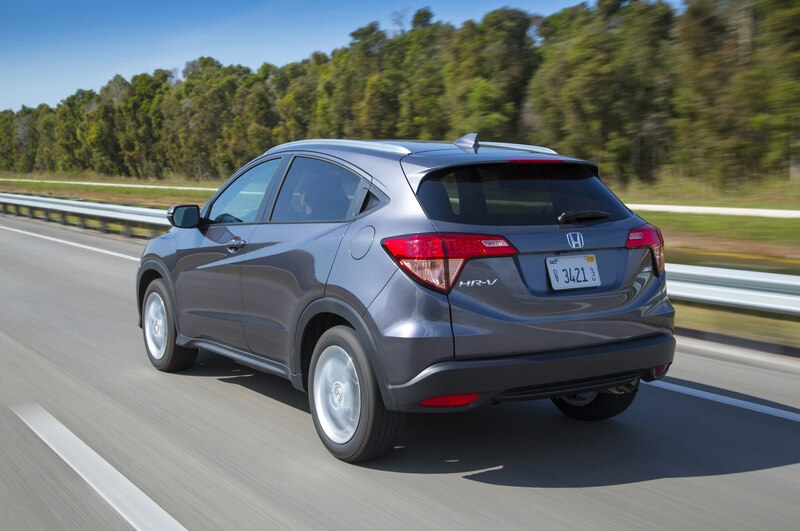 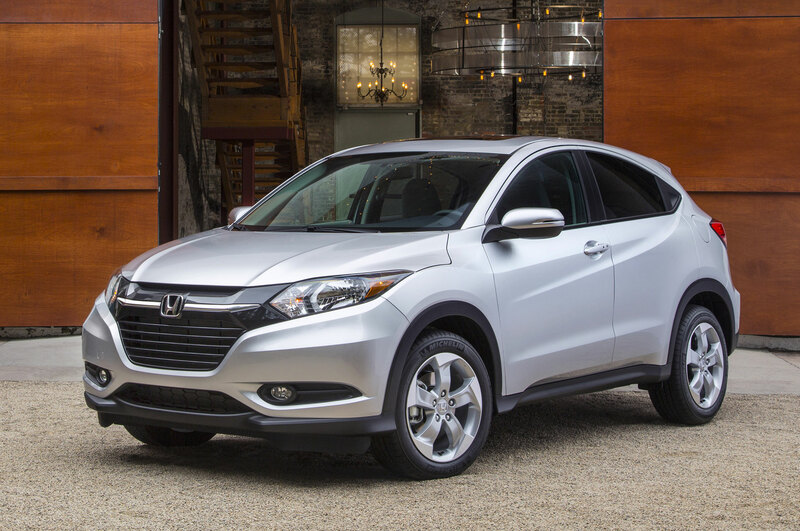 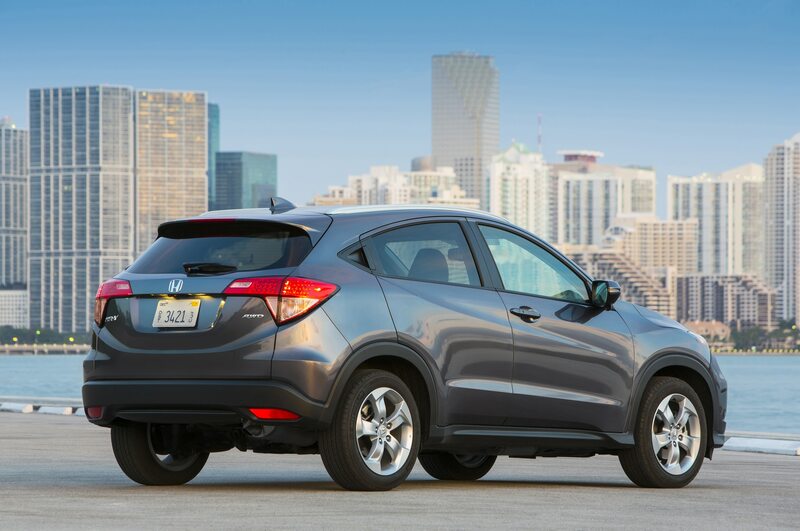 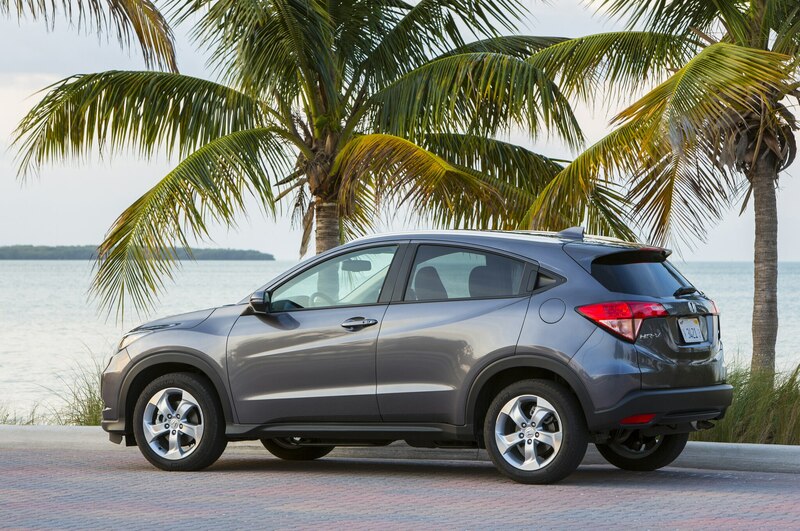 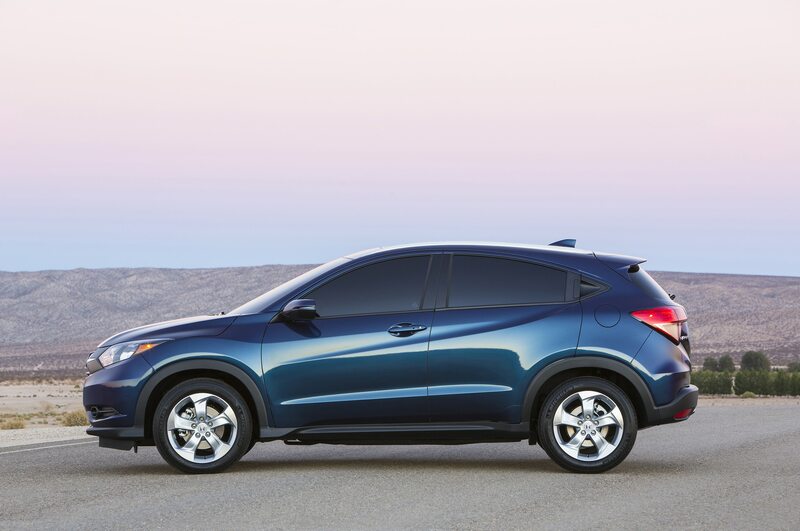 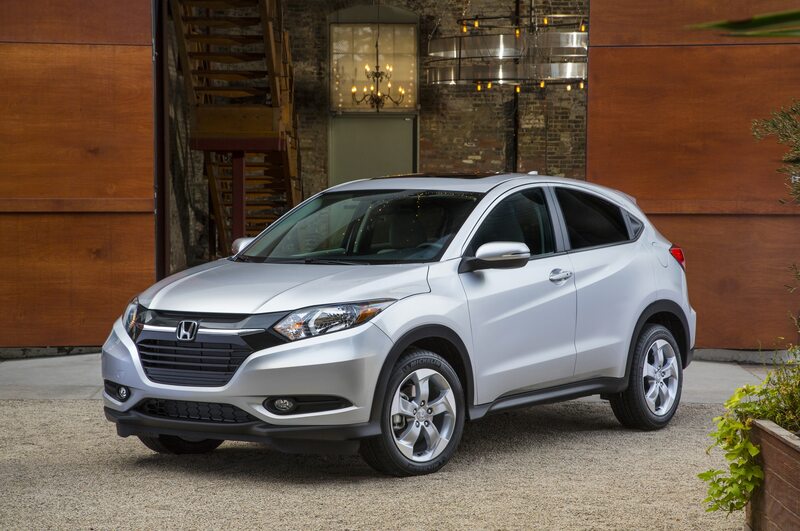 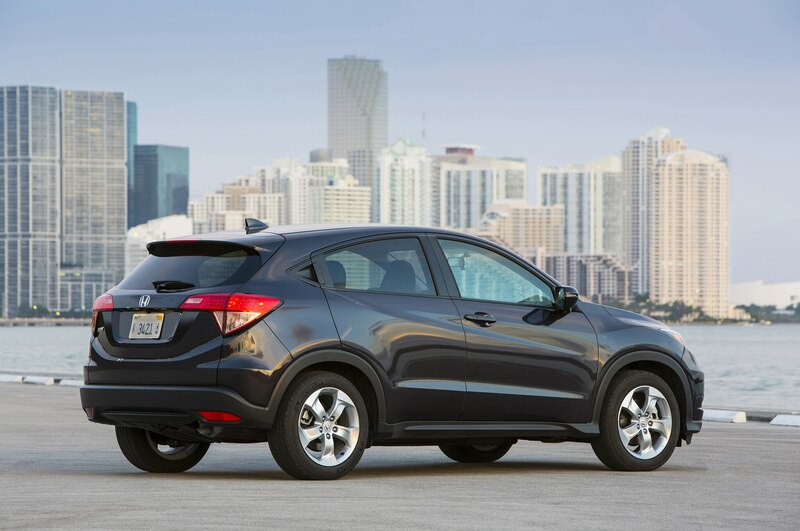 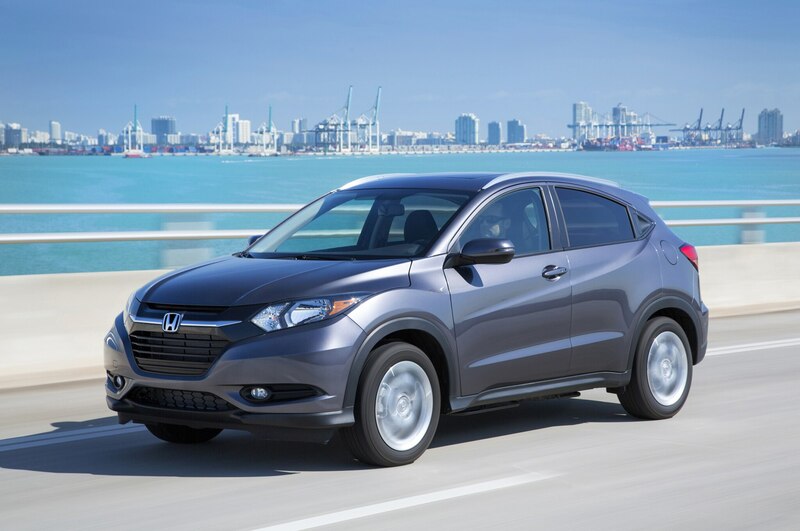 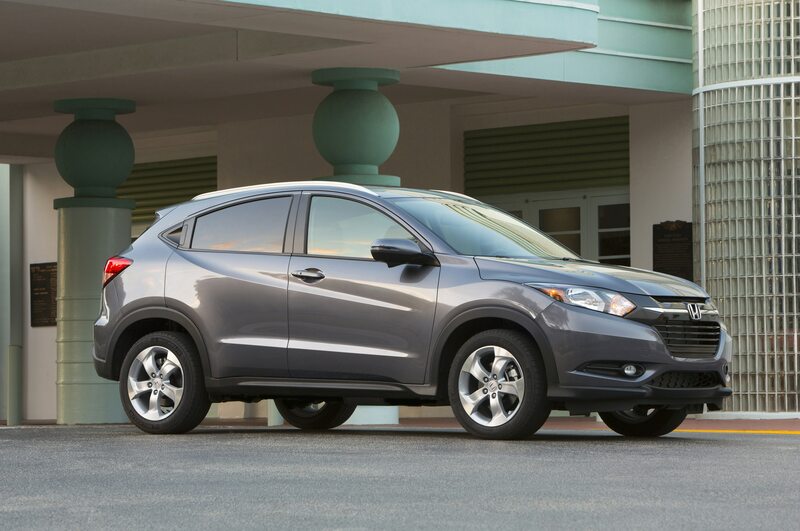 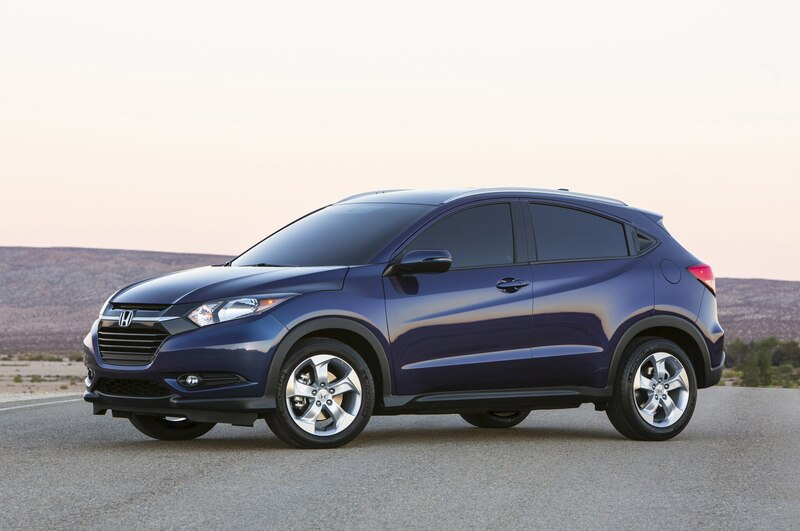 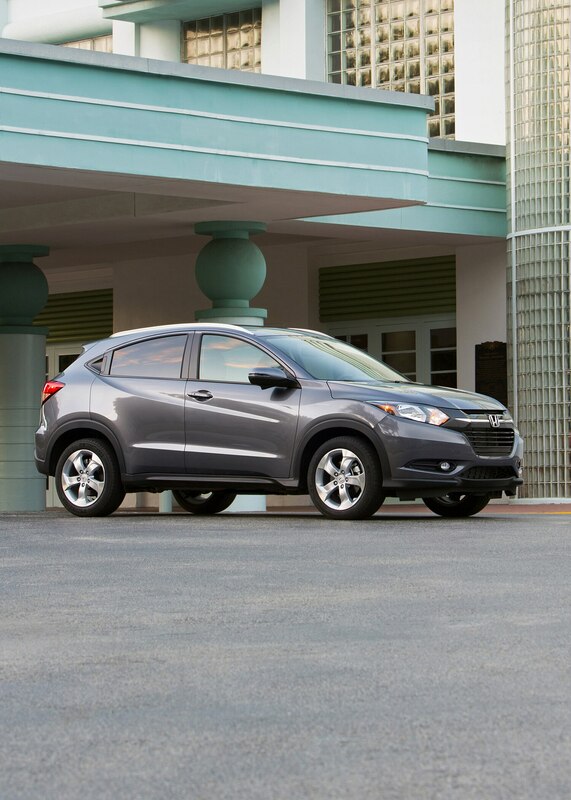 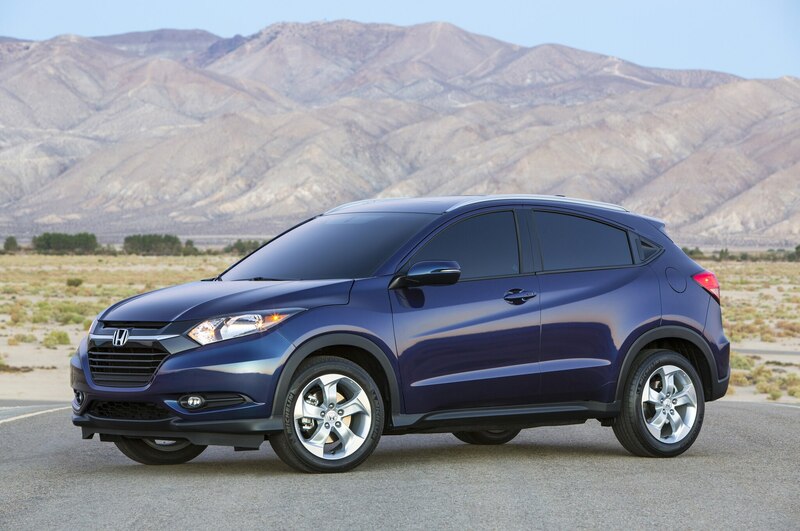 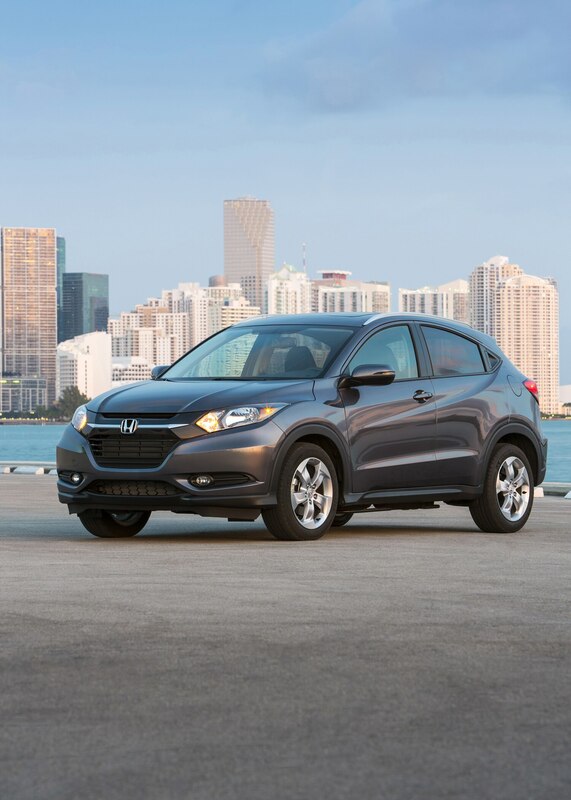 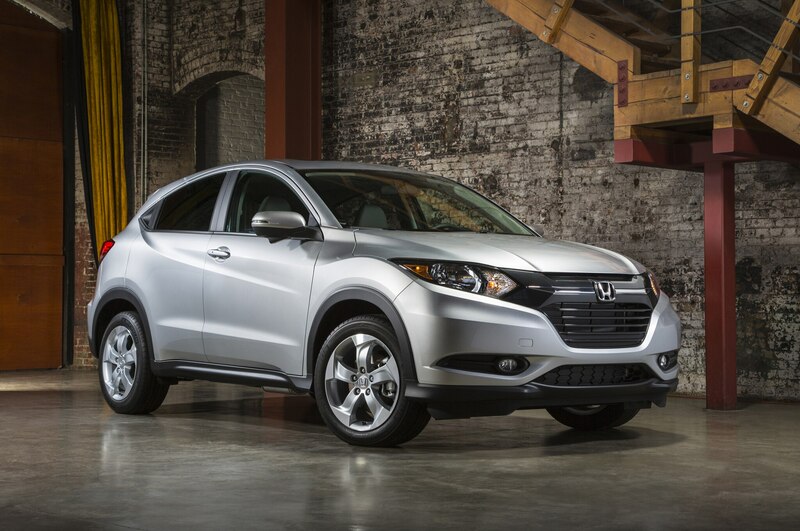 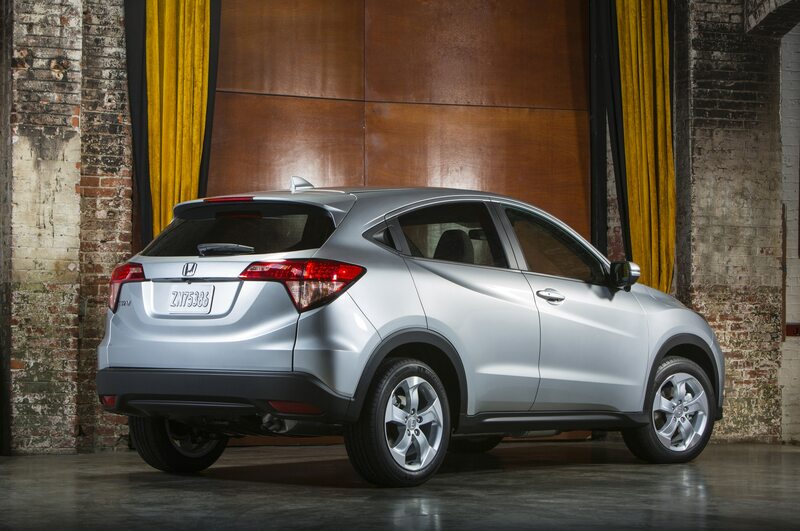 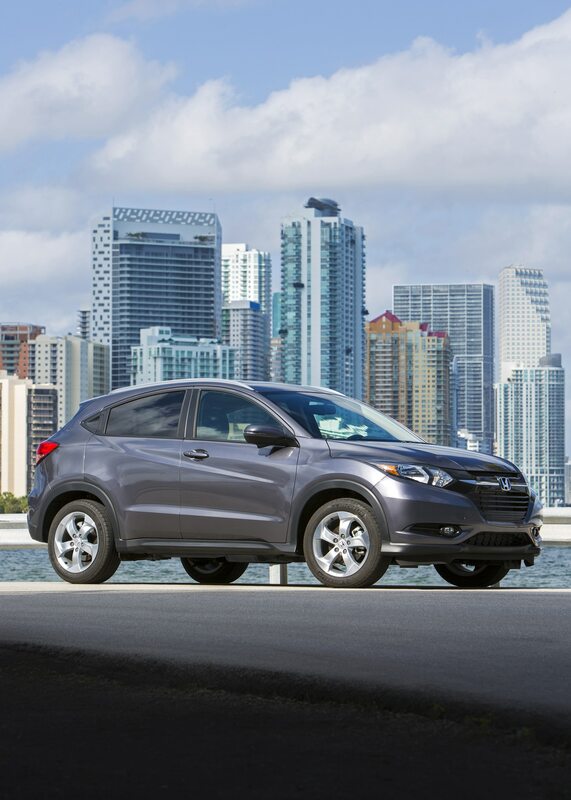 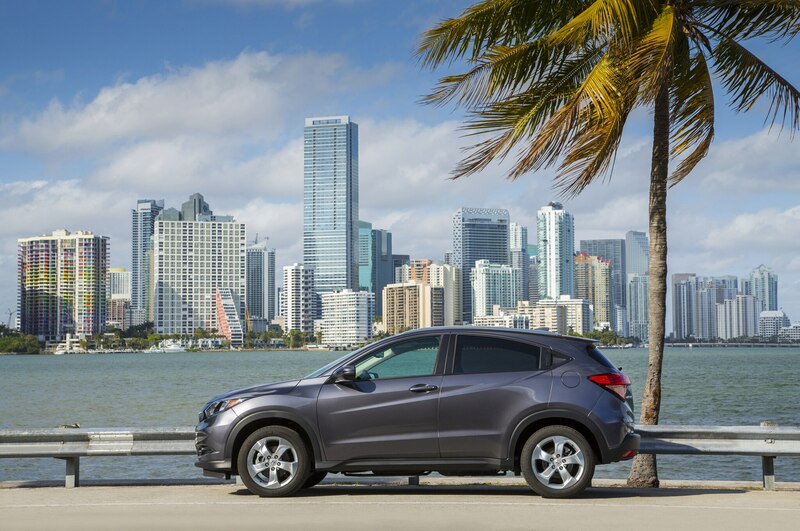 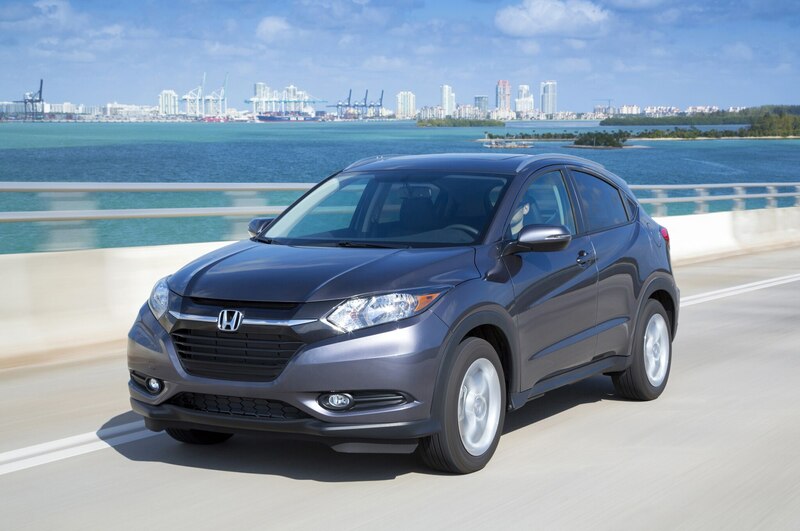 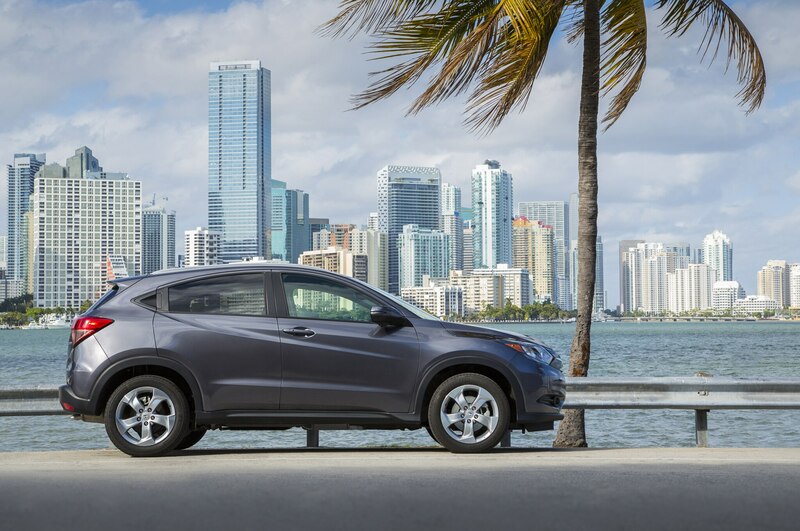 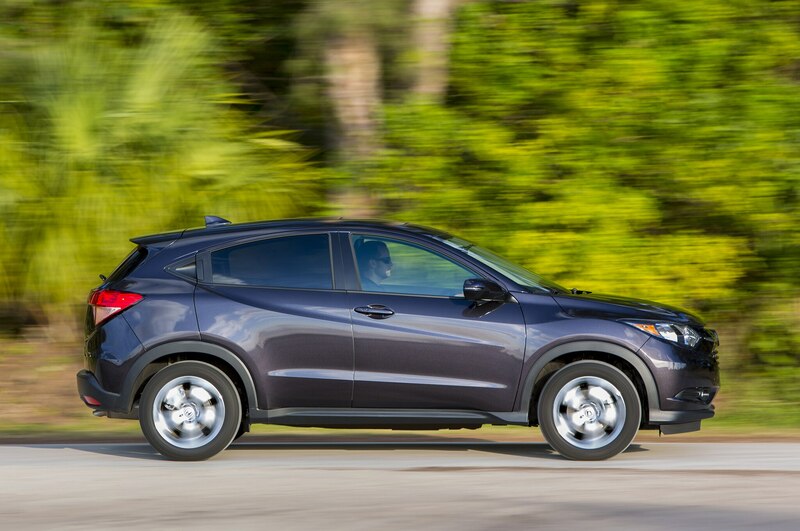 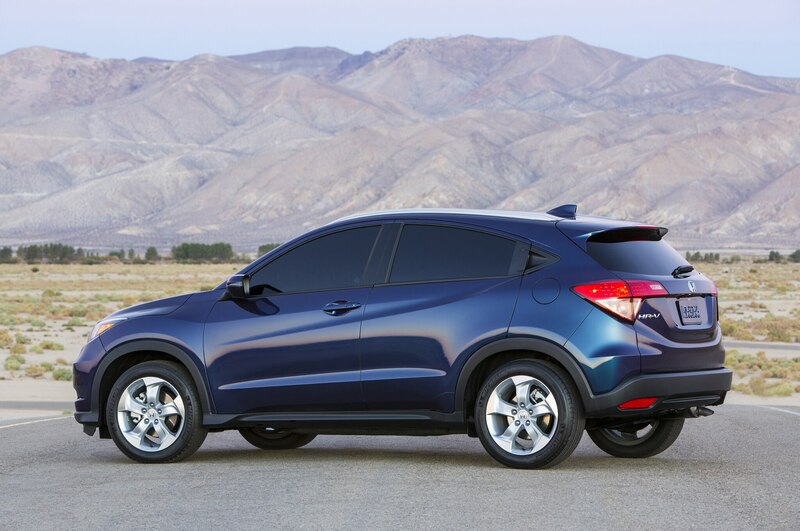 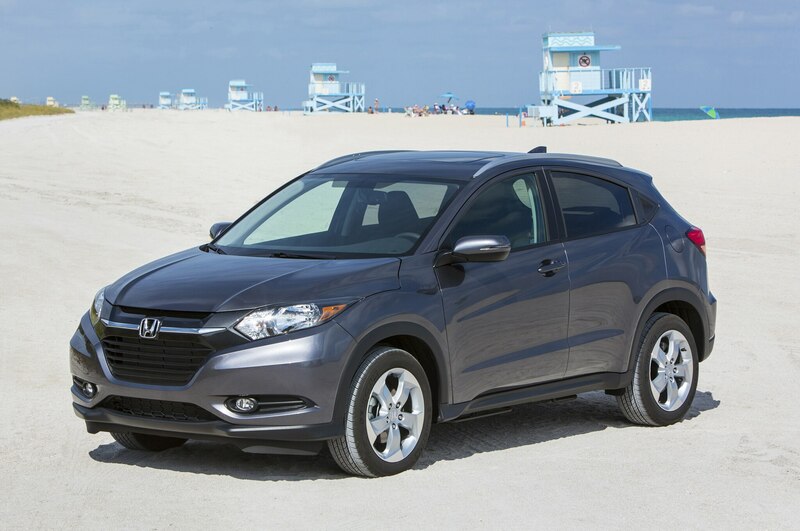 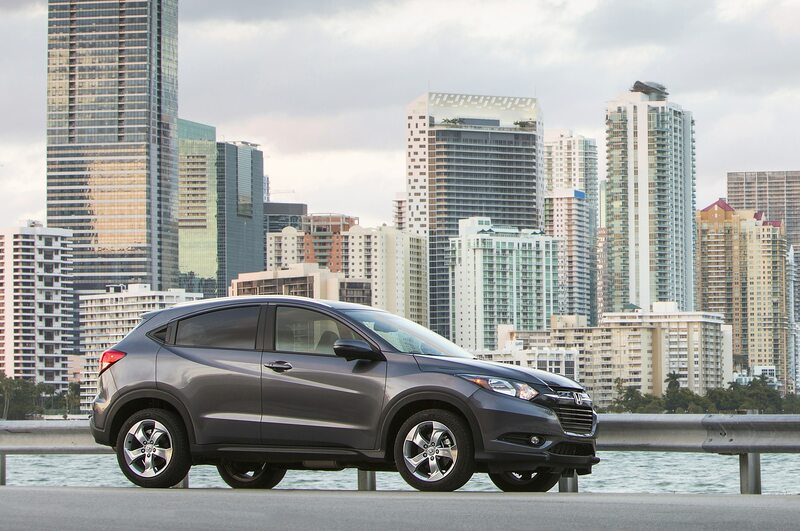 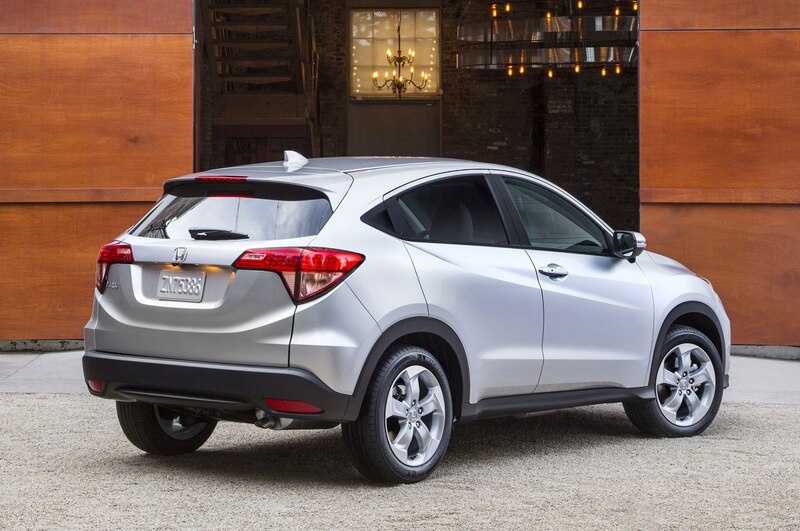 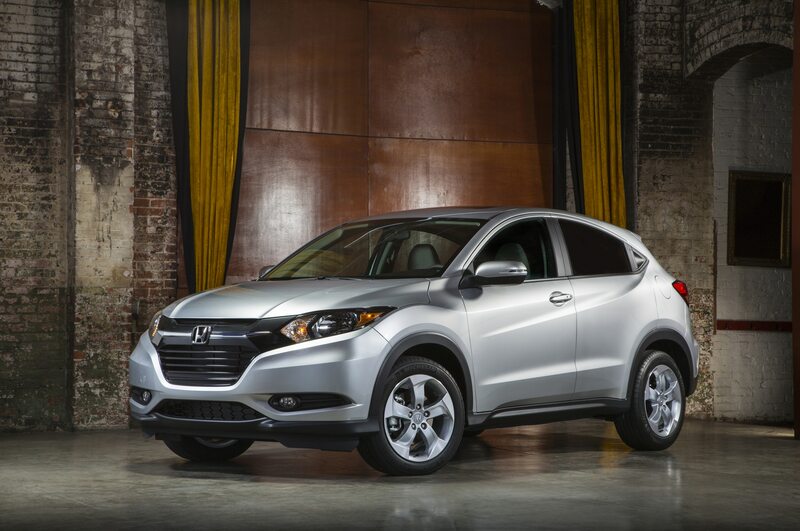 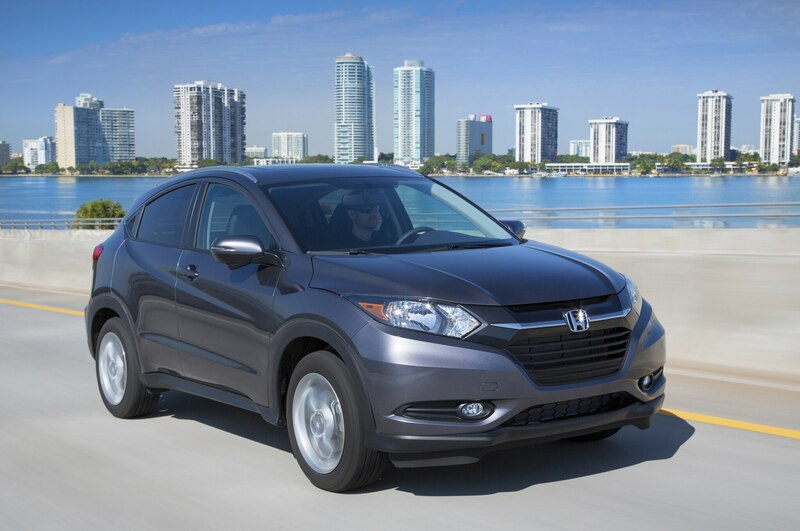 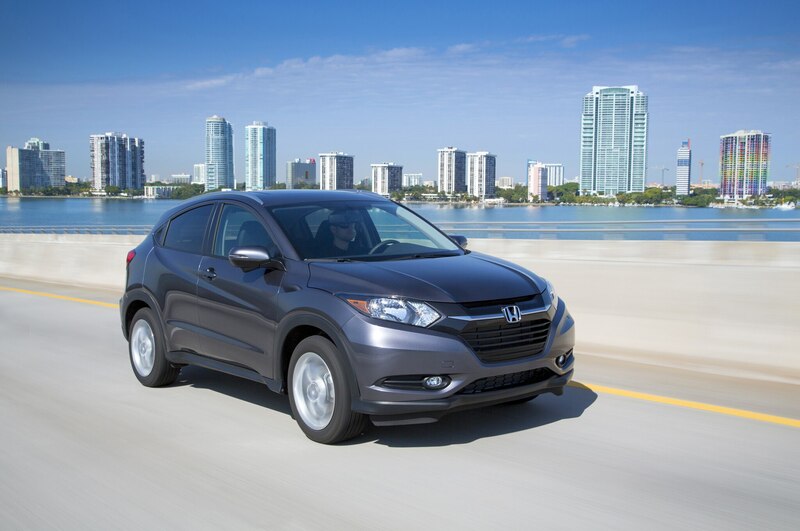 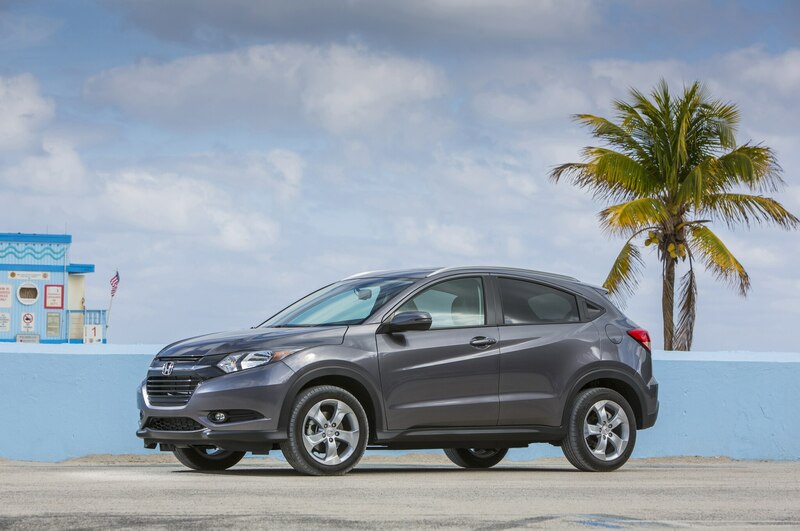 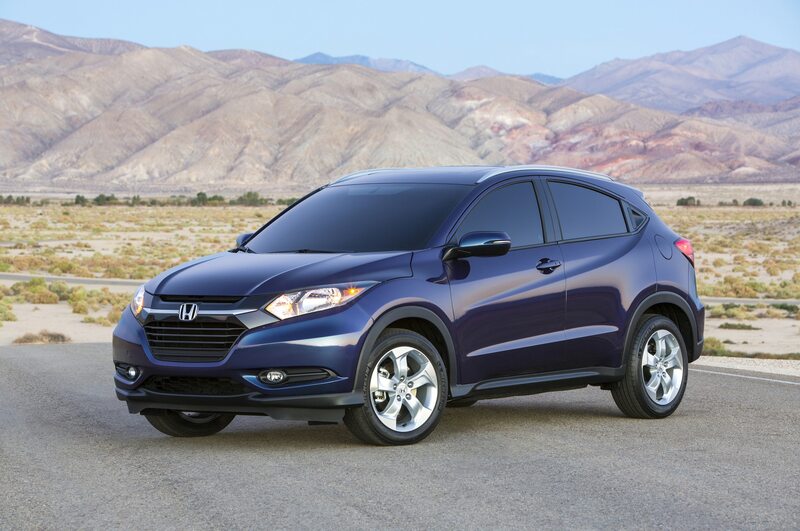 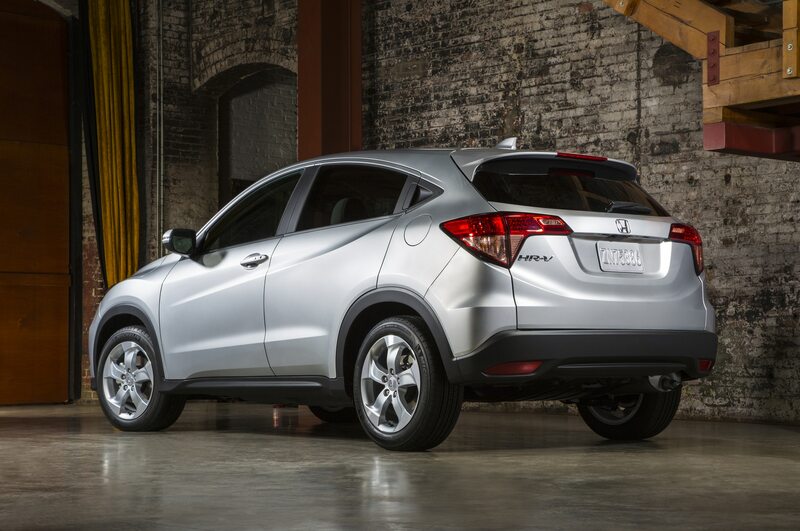 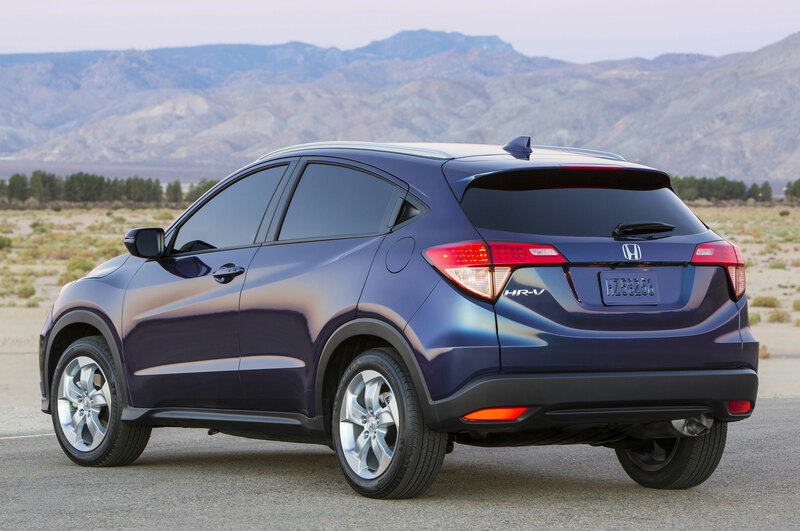 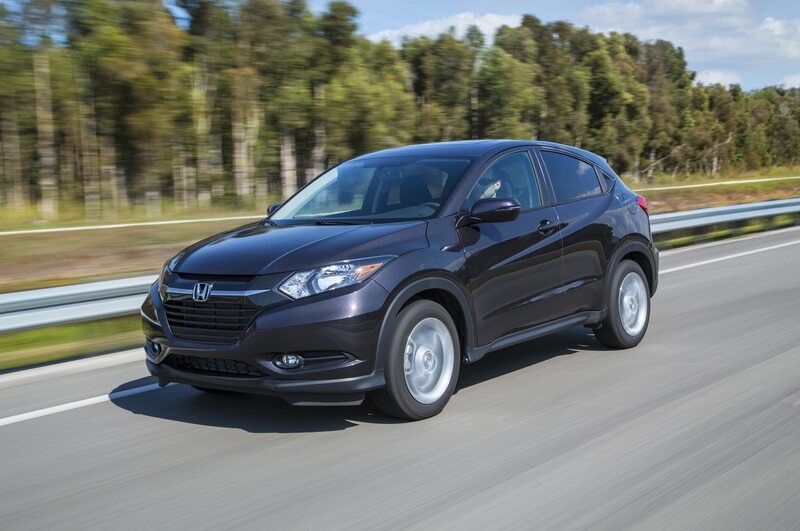 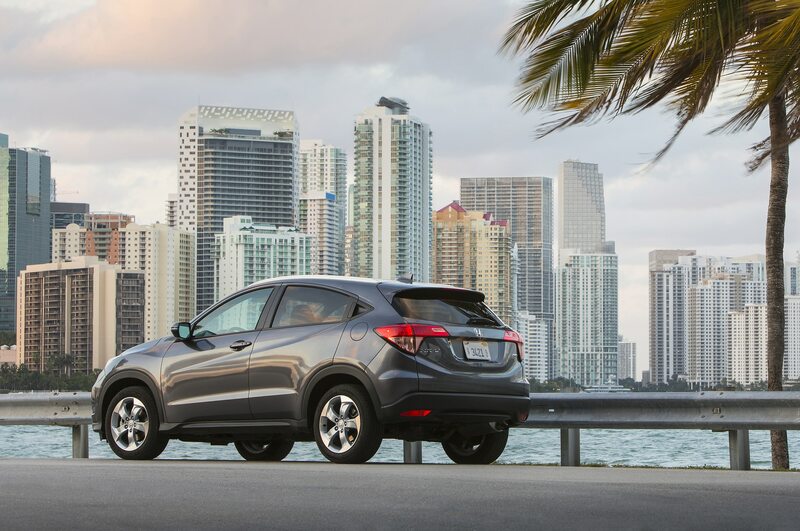 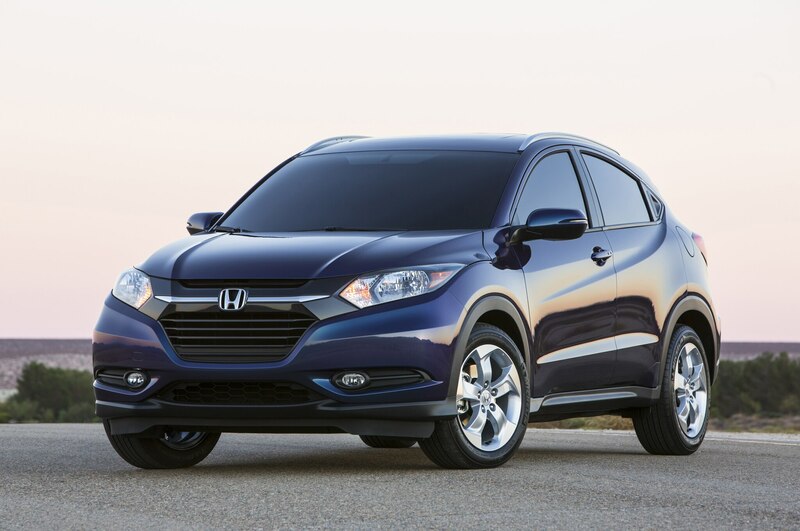 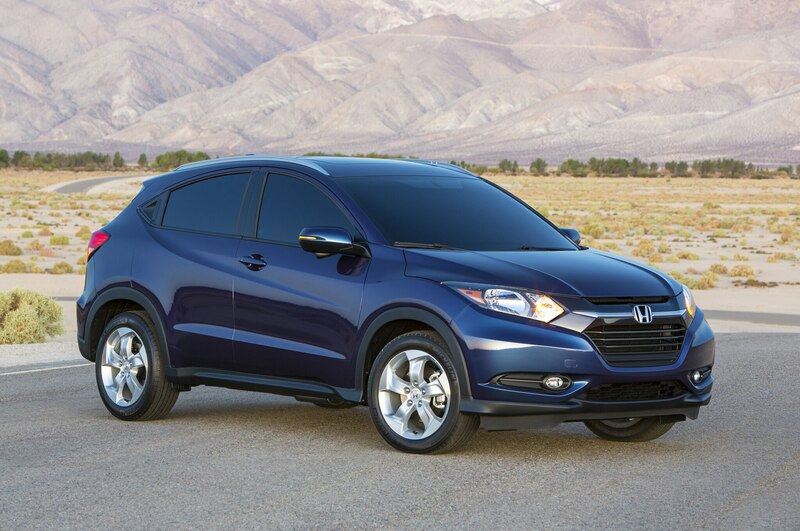 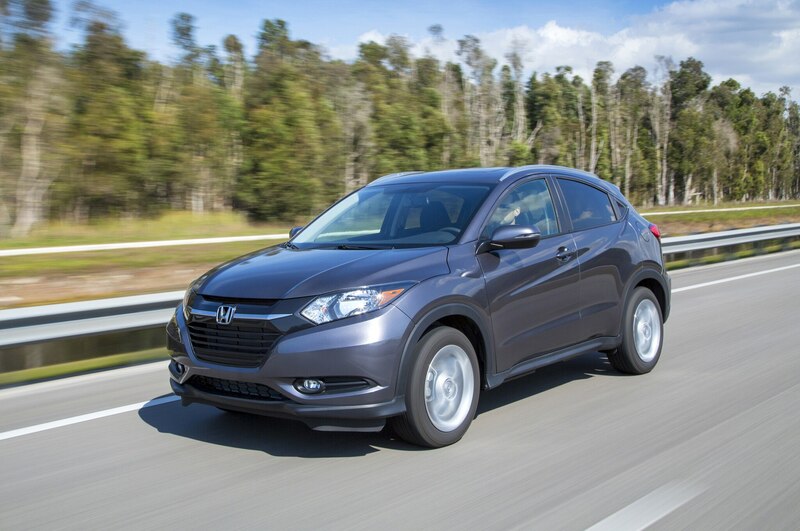 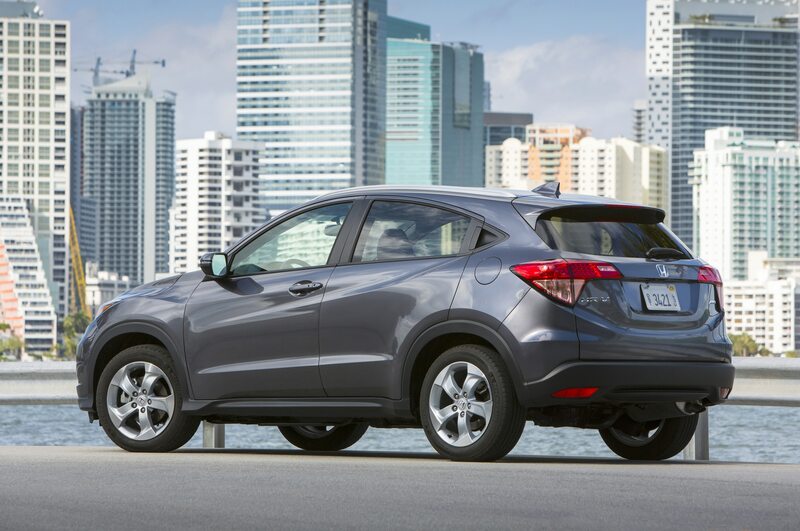 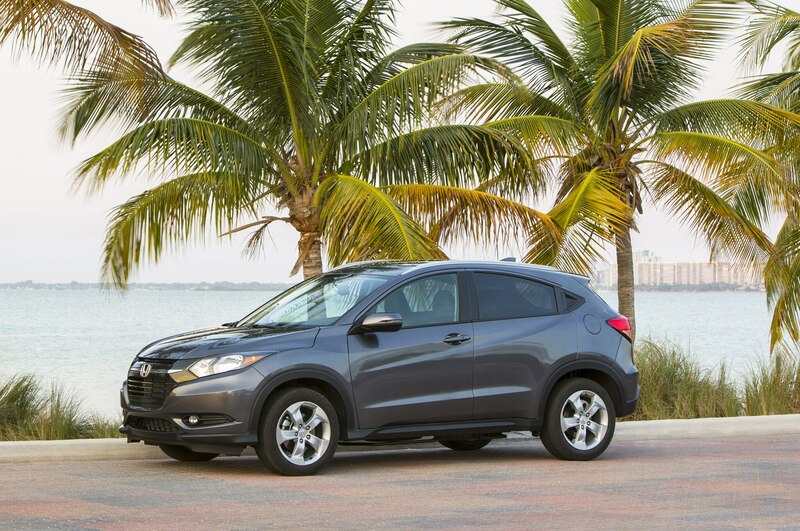 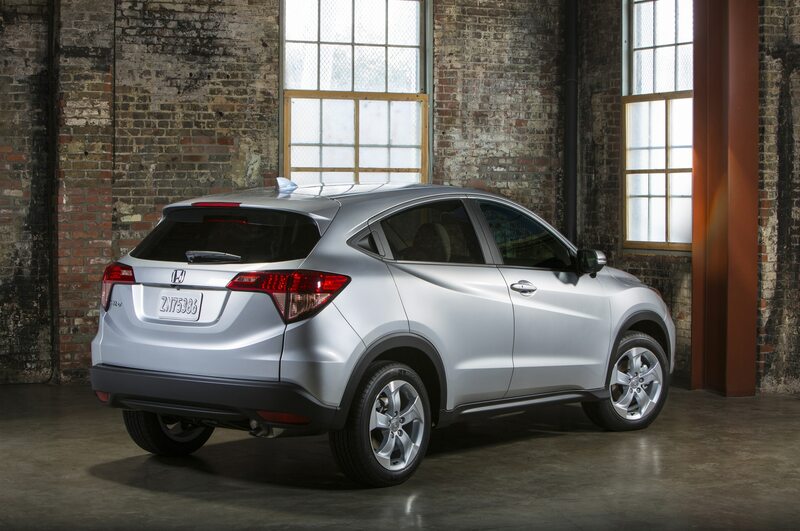 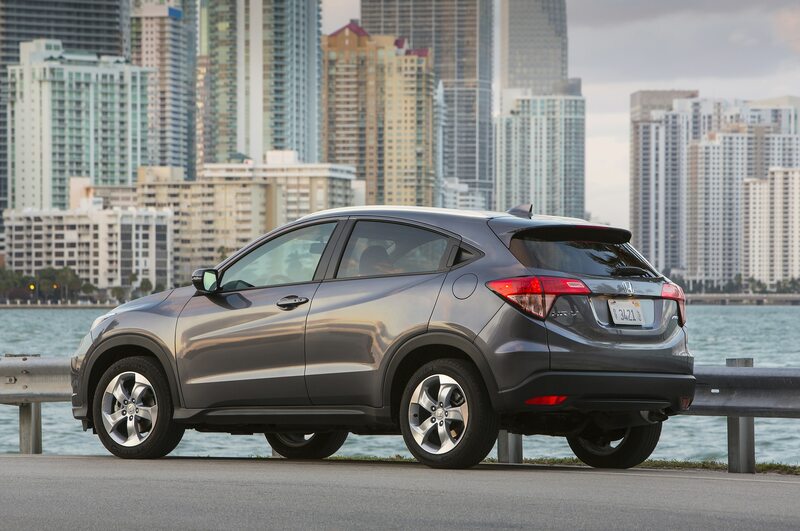 The 2016 Honda HR-V takes the best elements from its successful siblings and combines them in a satisfying package. 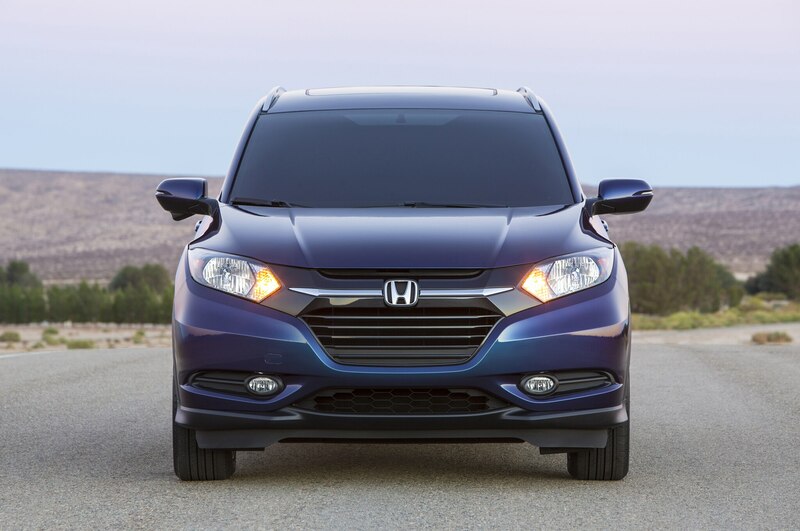 It’s a middle child that is easy to love and will have no problem standing out on its own.